We lost Pam King to Metastatic breast cancer on June 16th 2018. We have posted her obituary here. 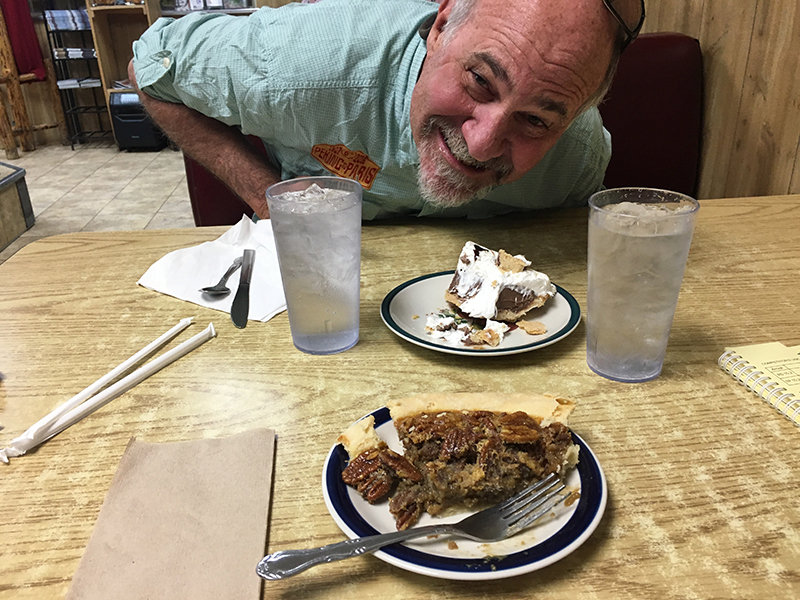 In Fall 2016, Chris, Pam and I were having dinner at Jamestown Fish. Jeff was out of town. Pam was telling me how her fellow Board members at METAvivor were encouraging her to host a fundraiser in Jamestown. Pam and I were not huge gala fans - it's just not our thing. 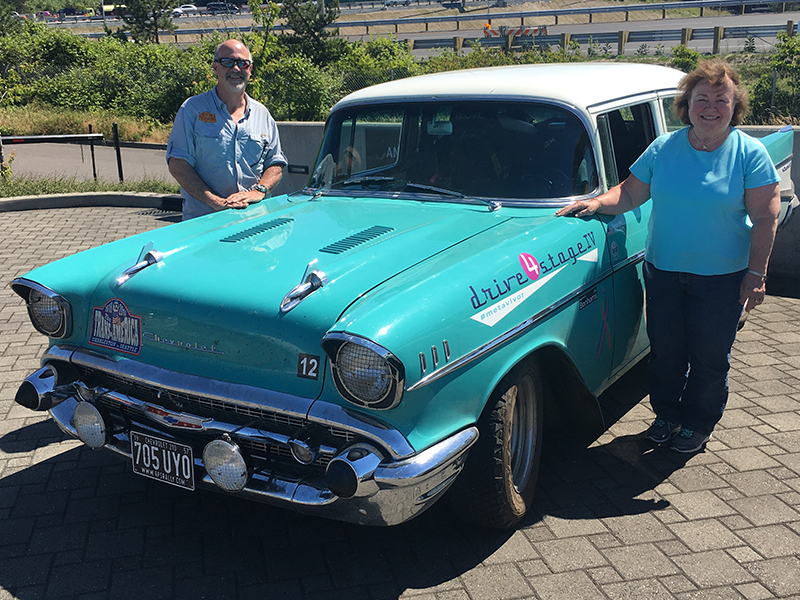 Then Chris came up with a brilliant idea - to drive the TransAmerica Road Rally in 2018, to raise awareness of metastatic breast cancer and funds for research with METAvivor. Pam and I looked at each other and said "We could do that!" Of course, we would also take our dogs! So the plan was born. Of course, we didn't plan on Pam being so sick by the time of the rally. 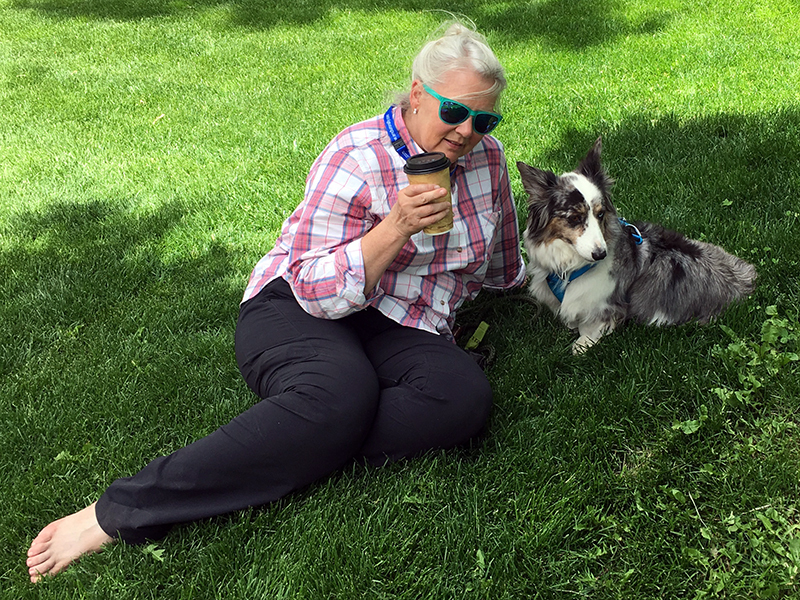 Pam had a very difficult winter this past year, with two bad bouts of pneumonia, metastasis in the brain which (meant debilitating whole brain radiation), and she was approaching the end of her limited treatment options. Pam's cancer mutated and spread, making the known treatments increasingly less effective. 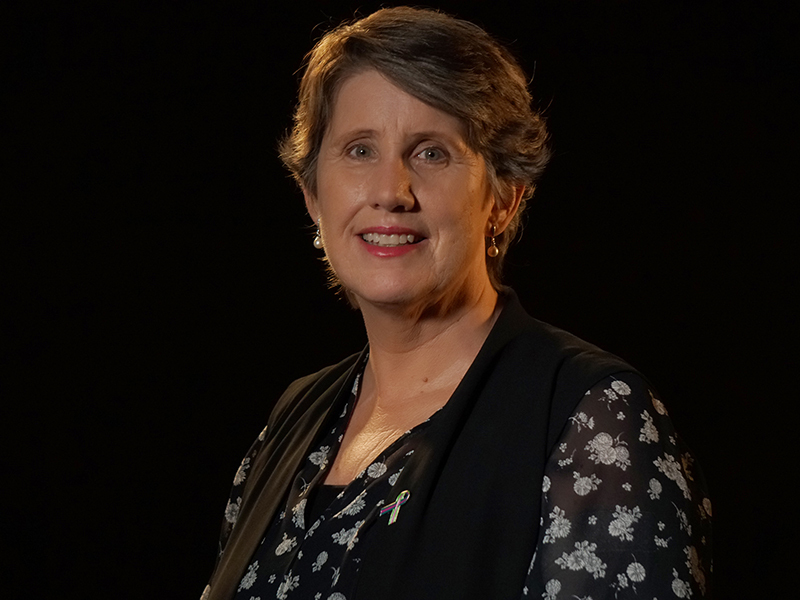 This is the story for the many people diagnosed out of the gate with metastatic breast cancer, like Pam, as well as those whose cancer recurs as metastatic cancer. Pam's life ended the same way. Nearly 3 years after her initial diagnosis, she died when her body shut down after allowing her 2 of the 3 weeks on the rally she so wanted to experience. "I can stay home and deteriorate," said Pam a few days before we left for the rally. "Or I can go and have fun. I choose to have fun!" In that spirit we gathered in Charleston, dogs in tow. Everyone who has read our "dogs' blog" knows the rest of the story. 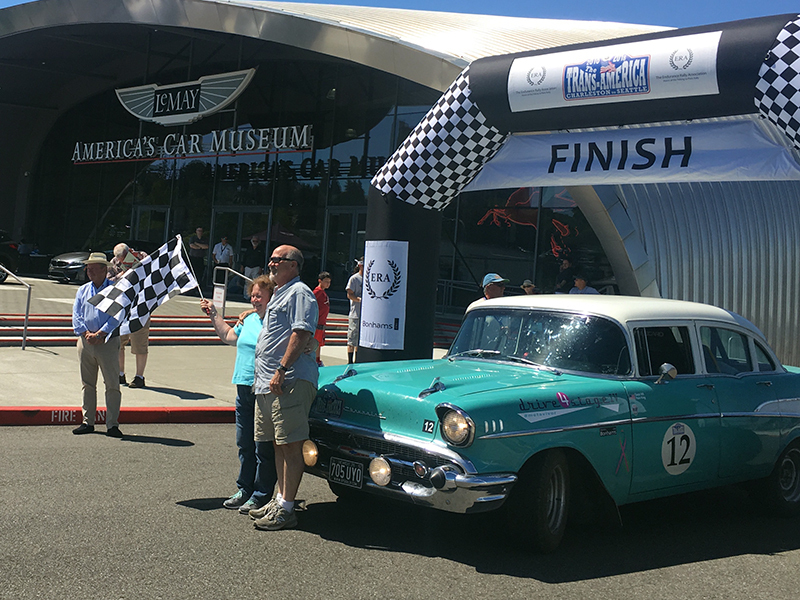 Our dear friends Peg and Tim Eades drove our 1957 Chevy BelAir across the rally finish line in Seattle. They finished the task that Pam and had I planned with joy, hope and determination. They did it in honor of that very special person, Pam King. Thank you, thank you! 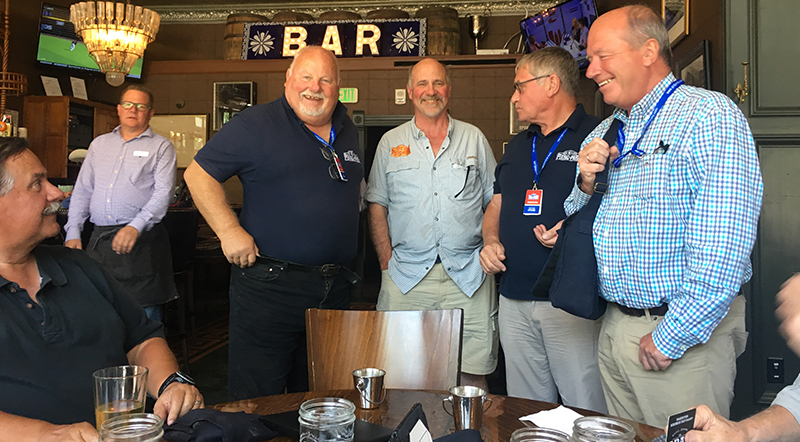 The end-of-rally dinner in Seattle was a joyous celebration of the cars, people, heat, roads, and overall accomplished challenges of the 2018 TransAmerica Road Rally. Thank you to the Endurance Rally Association for supporting our Drive4StageIV effort. 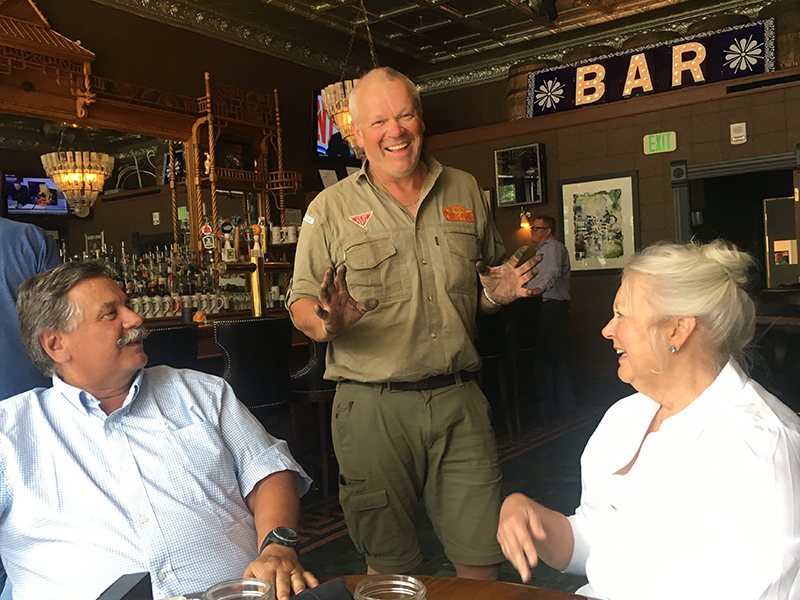 Fred Gallagher, the Rally Director, had kind words to say about Pam, and he expressed condolences to her much-loved husband, Chris, from all of the ERA staff and rally participants. Everyone stood for a moment of silence in memory of Pam, and then all raised a glass as a toast to her spirit. During each rally, gifted photographer Gerard Brown takes amazing pictures throughout the event, and the 2018 TransAmerica was no exception. The slide show compiled for the dinner will be available on the Endurance Rally Association's website and Facebook page in the next few days. The final slide is a wonderful picture of Pam, showing her after the first day of navigating, Charleston to Charlotte. At the conclusion of each rally, participants vote on who best embodied the "Spirit of the Rally." 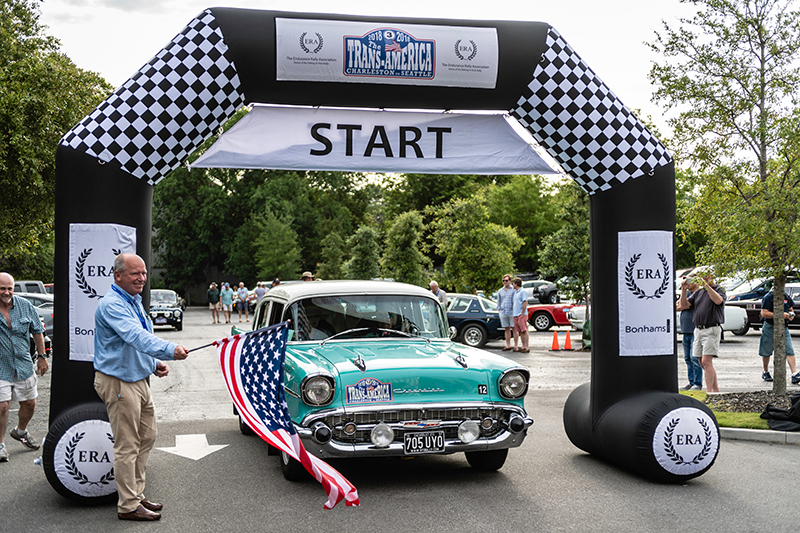 This TransAmerica, Car 12, the '57 Chevy BelAir, won this award. This award recognizes not just Pam and I, but Peggy and Tim, who brought it to the finish line in Pam's honor. Tim's contributions to making this rally happen for us - by prepping our cars, teaching Pam and I how to read a tulip book by making one for us to practice with in Jamestown, supporting the Chevy and the Ford and the people who were driving and navigating - cannot all be enumerated here, but Pam and I definitely appreciated his efforts, done with love. Peg bravely stepped in to navigate for me driving the Chevy, first for half-days, then whole days, when it became obvious Pam could no longer do it. 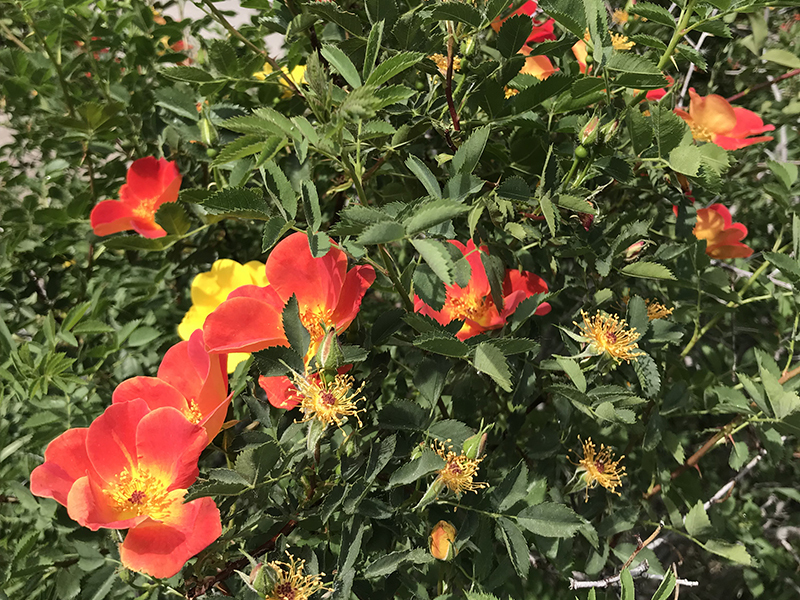 Peg was a quick study, and we had our own level of fun, laughing together, worrying about the Chevy, enjoying each other's - and Gemma's - company, and sharing our experience of each day with Pam so she could participate in a little more of the rally adventure through us. 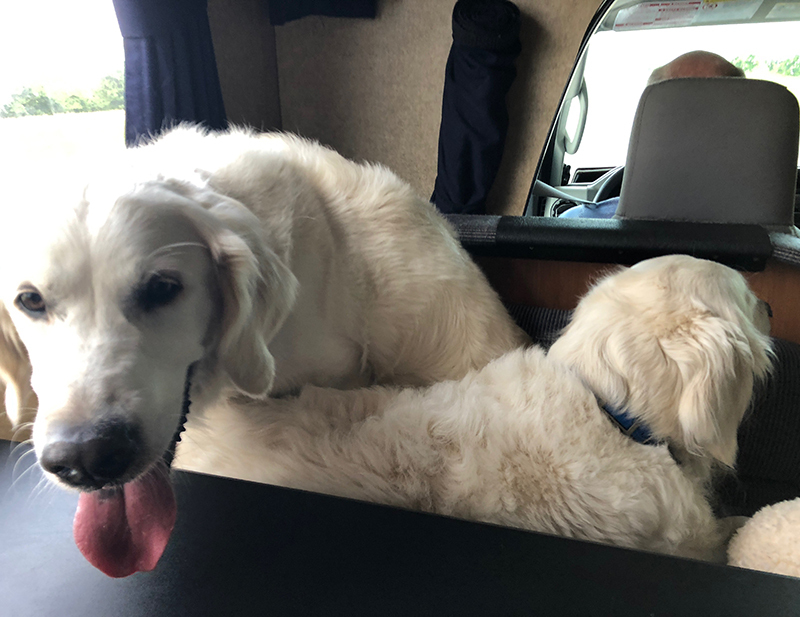 We also need to mention our dear friend, Willie, who spent time with Pam and Finn and Dodger in the RV, watching over Pam as well as her beloved dogs. Chris and Jeff, who were with Pam and I every step of the way, both physically and emotionally, were our closest support, and understand more than anyone how much this meant to Pam.. Thank you, with love. The sweeps, Andy, Tony, Jamie and Bo - the rock-star mechanics who ensured all these vintage cars could continue on the rally - brought Tim an envelope at the end of the dinner. It was their donation to METAvivior, in honor of Pam. Thank you for this illustration of how Pam's efforts in the TransAmerica brought awareness, and research funding dollars to fight metastatic breast cancer - the disease that took our beloved friend Pam. Pam's life is over, but her story continues. We want to keep Drive4StageIV going in myriad ways, and hope to continue to raise awareness and research funds with the help of METAvivor. Pam's brother, Don, will be taking the lead, with support from Pam's mom, Pat; and of course, me. Finn, Dodger and Gemma will guide the effort, along with Don's dog, Monty and Pat's pup, Cody. Pam would be happy to see us having fun. Every 14 minutes someone with metastatic breast cancer dies in the United States. Today Aunt Pam was one of those people. Uncle Chris, Aunt Pam's mom Pat; and Aunt Pam's brother Don, were with her. So were my mom and dad, Finn and Dodger, Monty and me. It was hard to see her go, but we know she was ready. 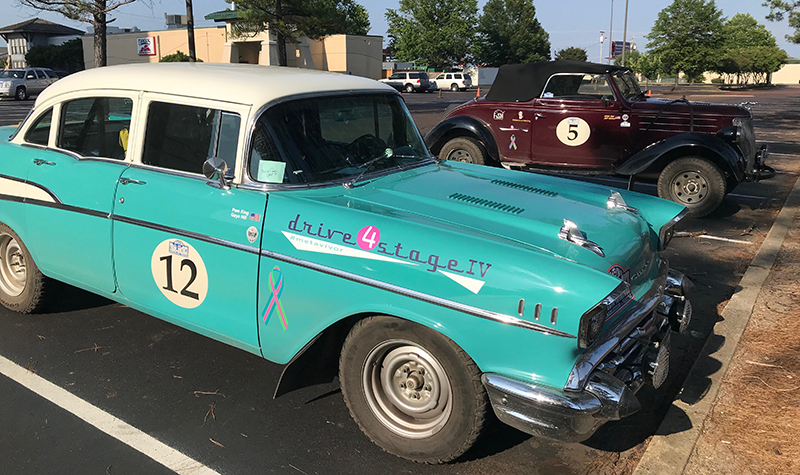 We also know that the Drive4StageIV gave her great comfort, while we were driving to raise awareness about metastatic breast cancer, raise funding for research through METAvivor, and encourage hope for current and future MBC patients. It is what Aunt Pam wanted. "Before we talk about Day 21, we wanted to tell you about the Sweep's party on the evening of Day 20. It seems that this is done towards the end of every rally, and it's a way for the Sweeps to say thanks to all the rally participants. 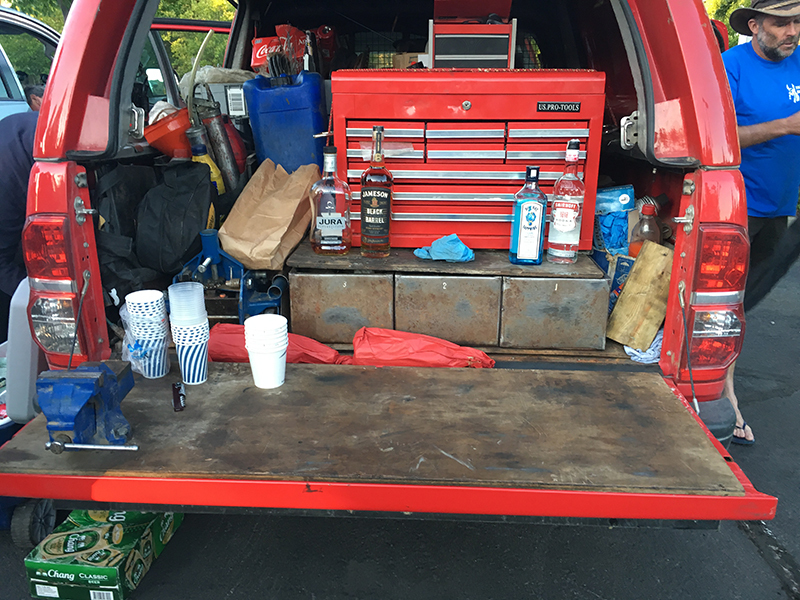 The transformation of changing their truck from a giant tool box into a bar was pretty funny. Everyone had a drink or two and a lot of laughs. Now, back to Day 21. It started out with route changes being handed out thirty minutes before start time. 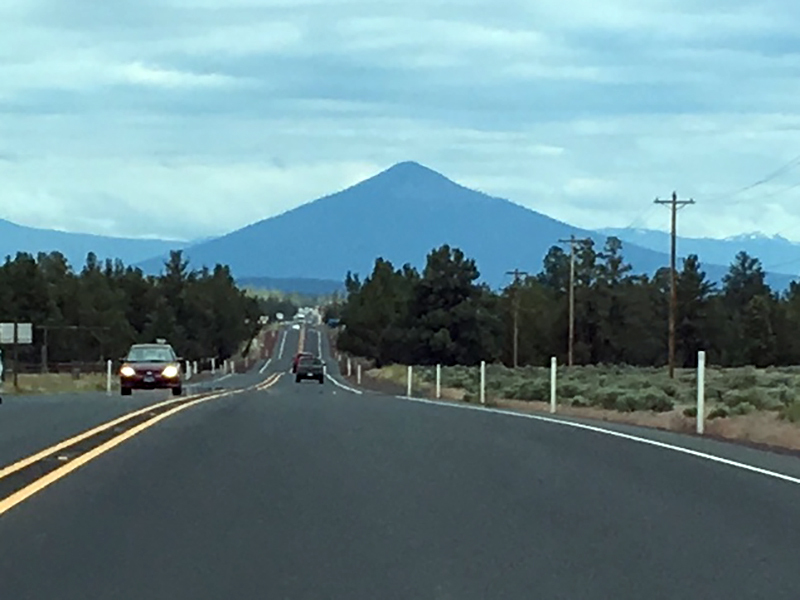 The reason for the changes was because McKenzie Pass is not yet open for motorized traffic. We were told that they are still doing clean-up after a fire in that area during the recent week or so. As we left Bend, we saw a guy walking down the road with a backpack, and he had a handwritten sign across his backpack saying "Salem". This must be the new way of hitchhiking where you don't have to stick your thumb out and wait. We drove up into Mt. 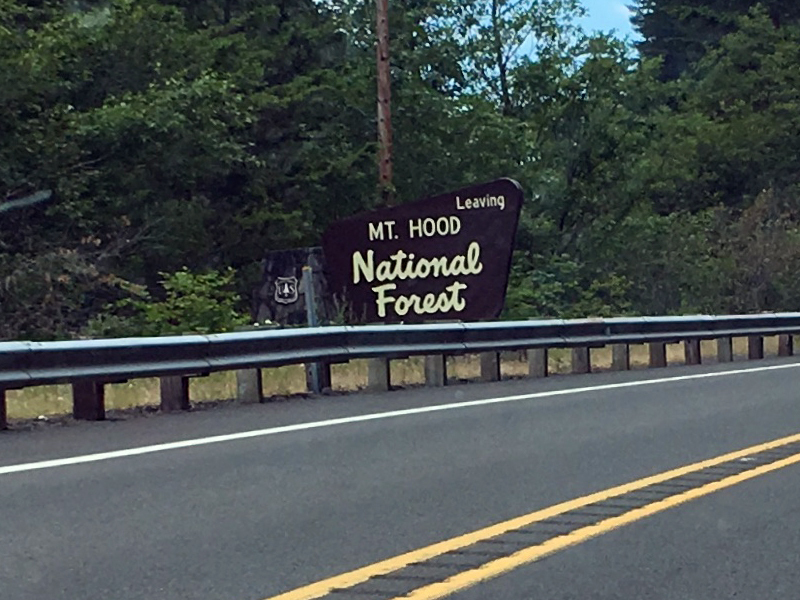 Hood National Forest, and the scenery was beautiful. The evergreens and foliage were lush and green. We saw all sorts of blue, yellow, white, and purple wildflowers, as well as gorgeous ferns, growing along the road. 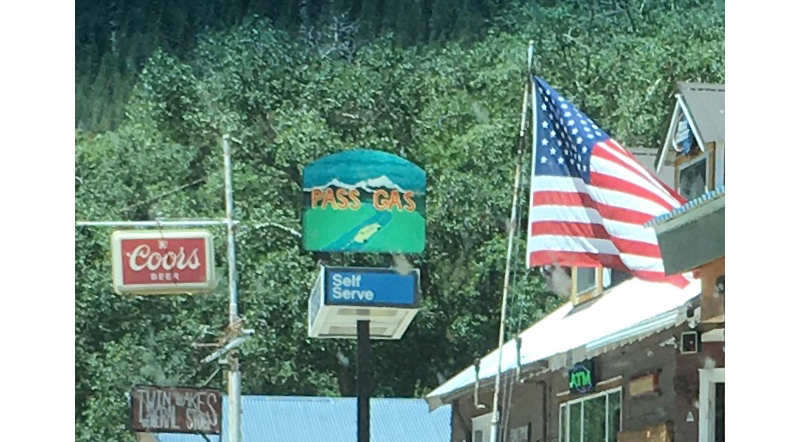 While driving through Mt. Hood National Forest we had rain for about ten minutes or so, and afterwards there was see steam coming from the road as we drove along. Coming up with names for roads must be a lot of fun. Here are two of the funny names that we saw yesterday: Pudding River Road and Nutmeg Road. 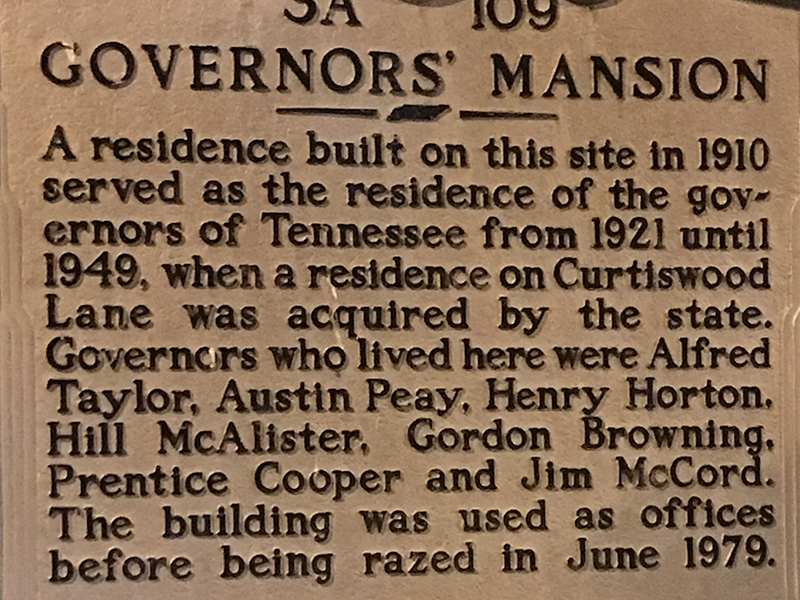 There were also lots of roads named after creeks, including Lake Creek Road, Straight Creek Road, Horn Creek Road, Fall Creek Road, Marion Creek Road, and others. On Day 20, we came upon a cow in the road, and on Day 21 a young deer ran out. When the deer got in front of us it just stopped, looked at us, and then turned and ran back. It may have just wanted to see what was going on. We ended Day 21 at the Woodburn Dragstrip. Each rally car got to have three runs on the quarter mile track. Everyone loved it. The Bel Air did great on the first two runs, but on the last run the Bel Air had only warmed up for a minute and that wasn't enough. So when the green light came on, the other car, which was a VW, took off, but the Bel Air stalled. Tim has now being razzed because he was beat by a Beetle! This was quite a day. The rally was in Oregon, and back home in Jamestown, we all said goodbye to Aunt Pam. She died before the rally was finished - but she knew Tim and Peg were going to finish, and that made her happy! There's one more day remaining in the rally, finishing in Seattle! 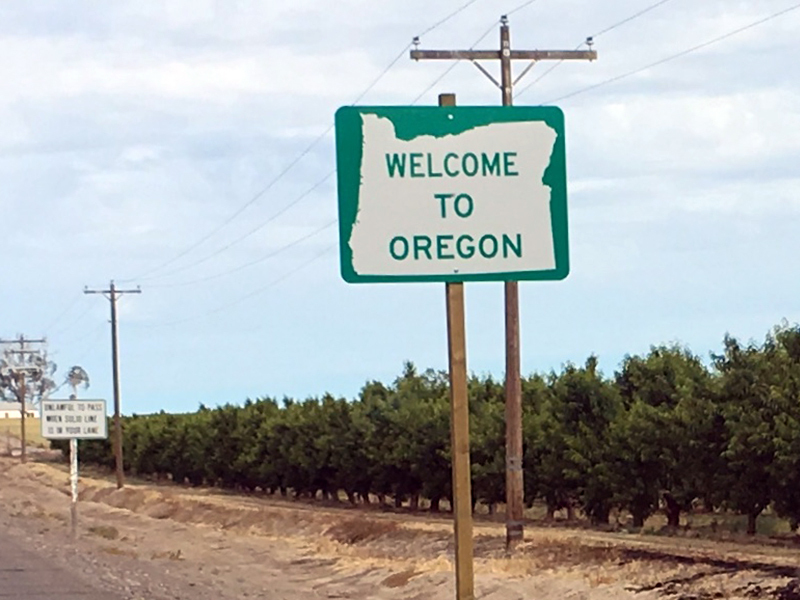 Another new state - Oregon! I was looking forward to being there, since it would be a new state for me, but I guess I need to go another time. 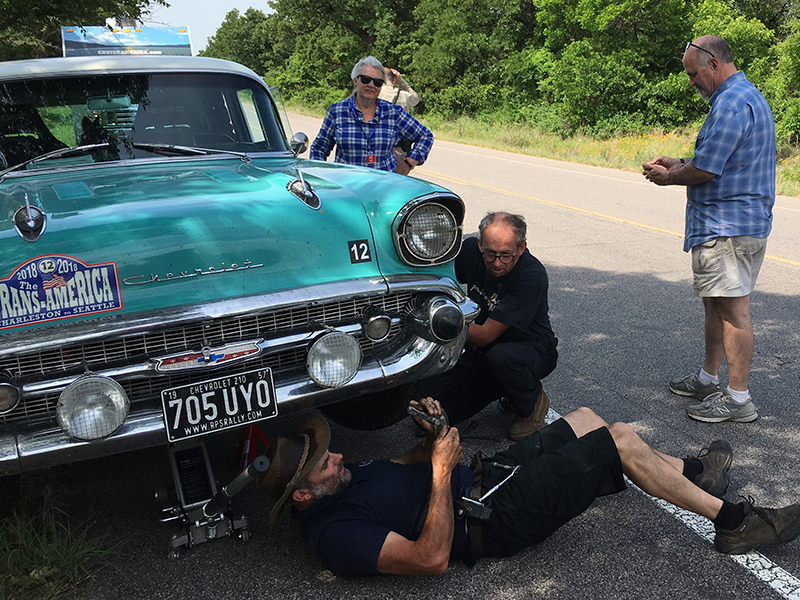 The '57 Chevy Bel Air started first again today. 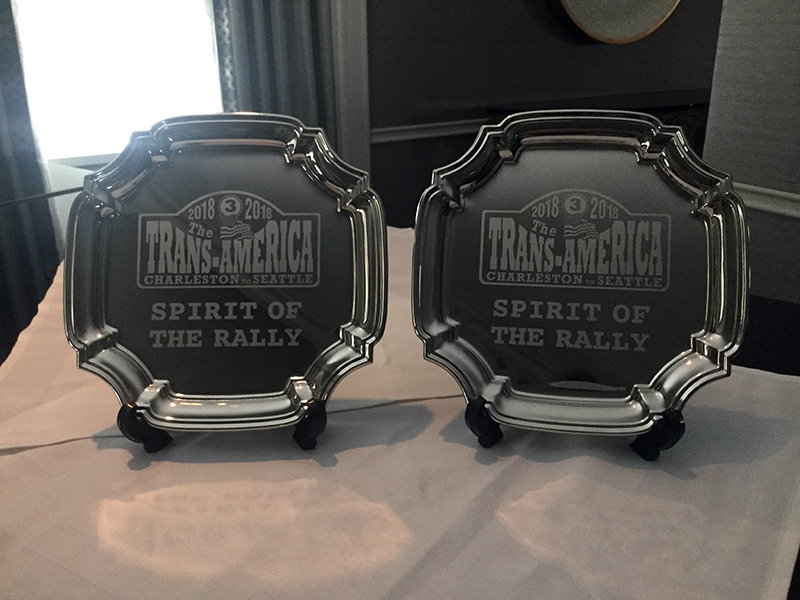 The entire TransAmerica rally is focused on getting the Drive4StageIV team to Seattle to honor Pam! 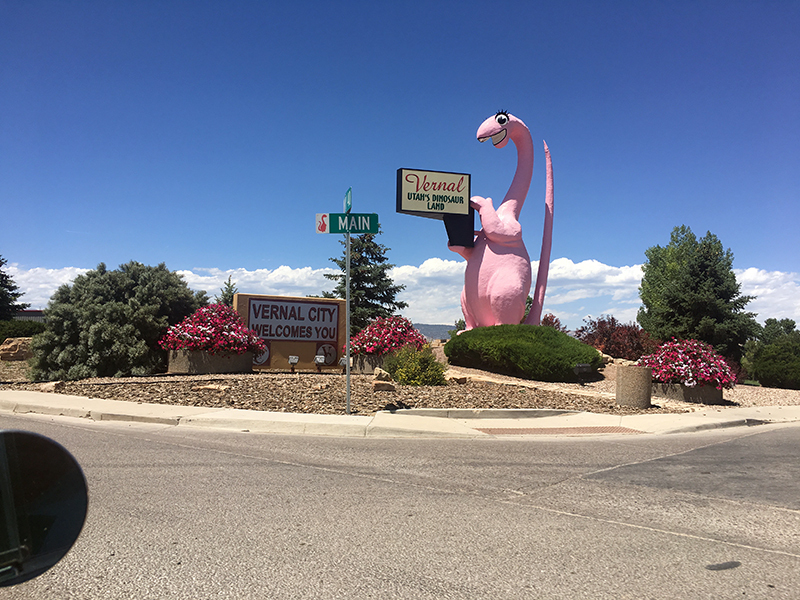 She can certainly be proud of this effort to raise awareness of metastatic breast cancer and funds for research into treatments for other patients. "Upon arrival at the newly built hotel in Boise, there was no hot water. Management said they had plumbers working on the problem. This morning, surprise, there was still no hot water. Not good for all of us older folks who need hot water to get the blood moving. Still though, not a big deal when considering how lucky we all are to be participating in this wonderful rally and seeing beautiful parts of the USA. One of the rally participants, Matthew, a Brit, said he woke up in the middle of the night and thought there was a burglar in his room. Soon, he realized it was his driver, Michael, who was lost in the dark in the hotel room. So like a good navigator, he instructed his lost driver to "Turn 180 degrees. Walk 2 meters forward. Now turn left. Walk three meters forward. Enter the bathroom. Shut the door." Mick from Switzerland, in the red Mercedes, and his wife Grace, started behind the Bel Air. At the first Time Control of the morning, he came up to us and said "I have not driven behind the BelAir before. When you let off the gas, it sounds like someone is shooting at me." Welcome to the beautiful sound of an American V8, Mick! 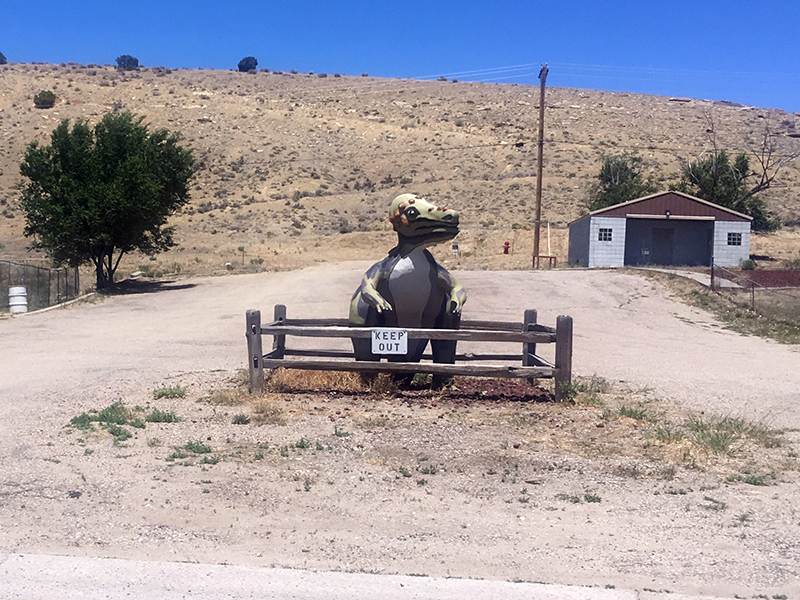 Leaving Boise and entering the rural part of the state, we passed a sign that said "Chicken Dinner Road". Only in America. 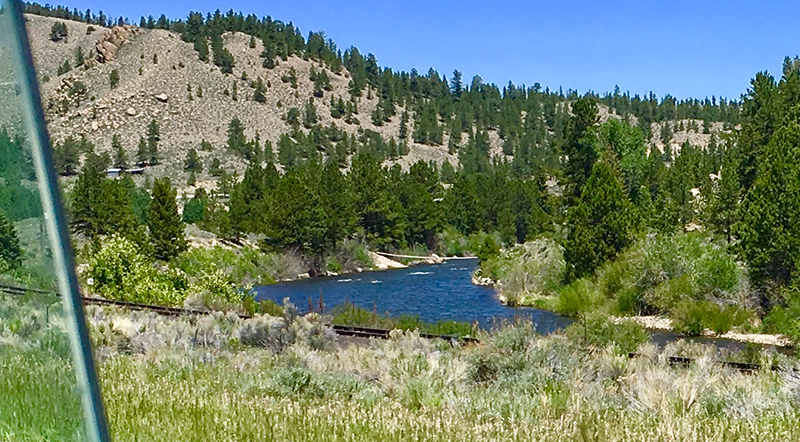 In the OR high plains, we looked down a valley and it looked just like a scene from "Bonanza". We expected to see Hoss and Little Joe come riding along. Eastern OR has a lot of small ground squirrels or marmots living in the rocks along the roads. They would constantly scurry across the road in front of us. It was like they were hiding in the rocks playing chicken with the cars. "Here comes another car. See if you can make it across the road in front of them at the last minute." 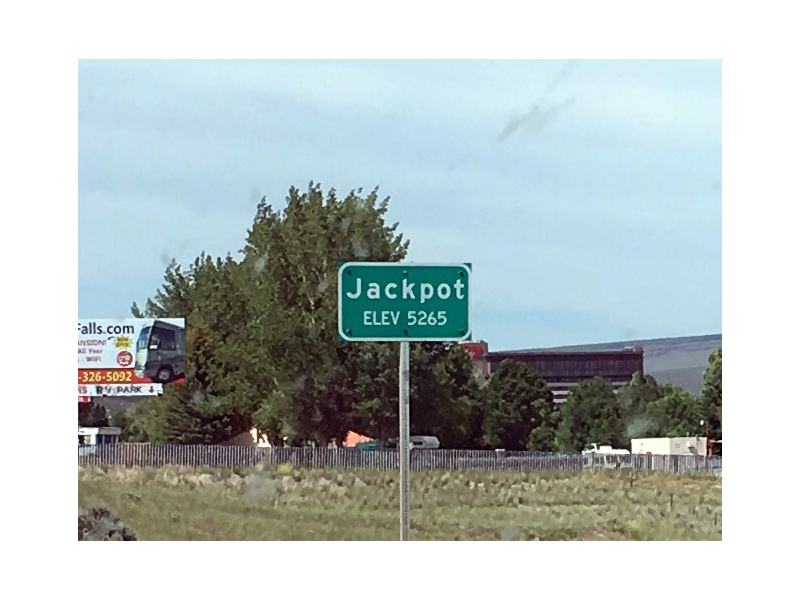 Fortunately, we never hit one. They are pretty fast. Coming into Bend OR, we suddenly realized that what we thought were white clouds were actually the snow covered peaks of mountains and volcanos. Magnificent." 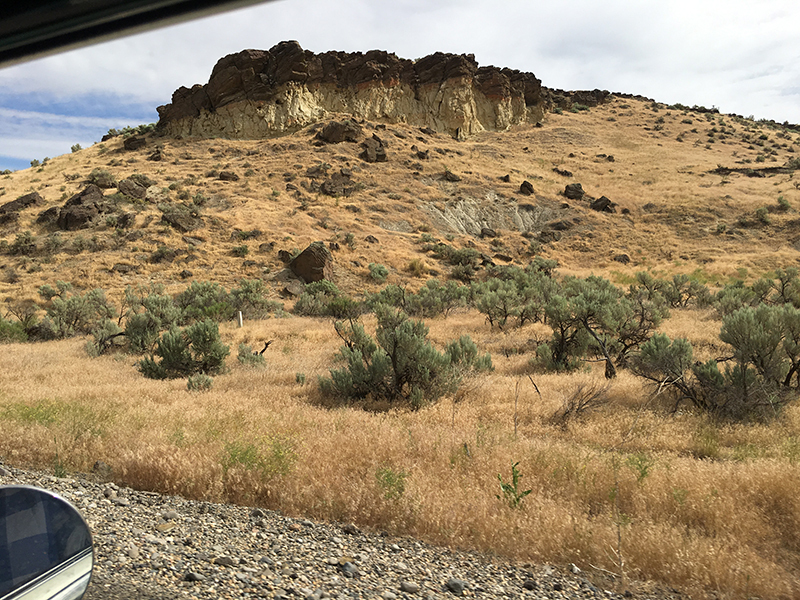 A real first-hand report from the rally road to Seattle! Aunt Pam continues to have so many friends come to say goodbye. It's wonderful to see so many people whose lives she has touched in some way. Friends from one of the patient groups she has worked with, the HAEA, talked about how they would not have had the success in research into the disease, medications approved, insurance coverage secured, and awareness increased, had it not been for the work Pam did for them and with them. She helped them save lives, and that's amazing. And it's just one of the groups she worked with over the years! Some friends from New York came and even brought their dogs! That was really fun. Uncle Chris says he needs a bigger refrigerator because everyone brings food. Dodger managed to steal a big piece of cheese off a platter sitting on the kitchen island. He got yelled at, but said it was worth it. If Aunt Pam knew, she would probably laugh, but pretend to be mad at Dodger. Lots of Jamestown people are stopping in, too, and it's good to see so many familiar faces. 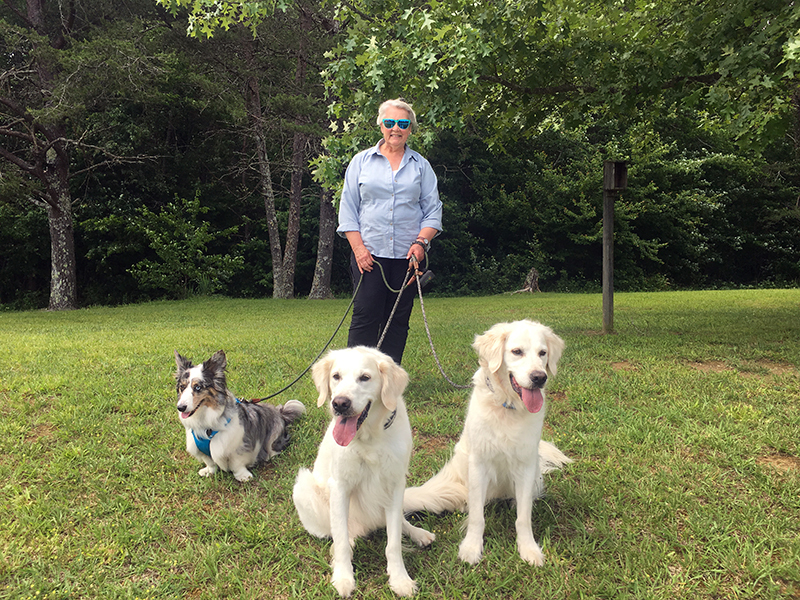 Leslie, our pet sitter, took me, Finn, Dodger and Monty to the park. We had a lot of fun running around, and riding in Leslie's car together. She is a good friend to Aunt Pam, and to us dogs. 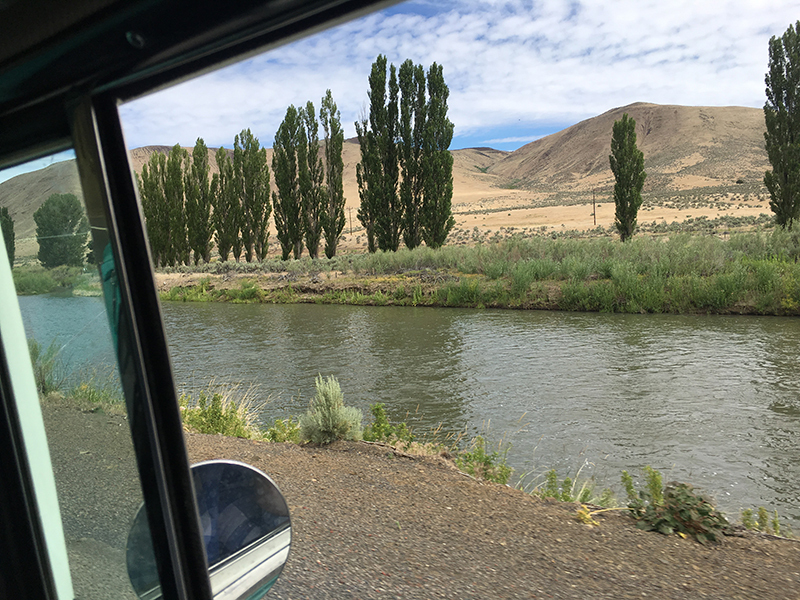 Tim and Peg and the rest of the rally stay in Oregon for the next to the last day of the TransAmerica, as they will drive from Bend to Newberg. More, then! 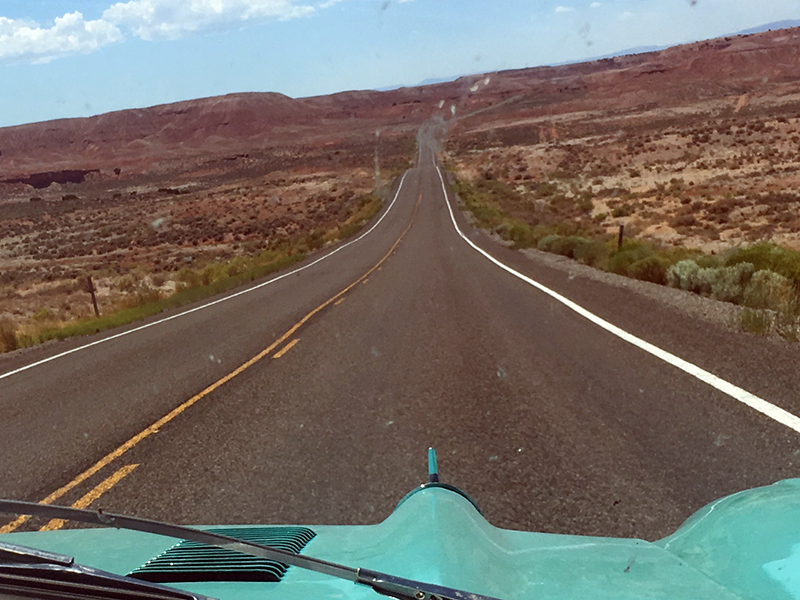 Today, Tim and Peg in the '57 Chevy Bel Air drove from Park City, Utah to Boise, Idaho. It was a very long drive! 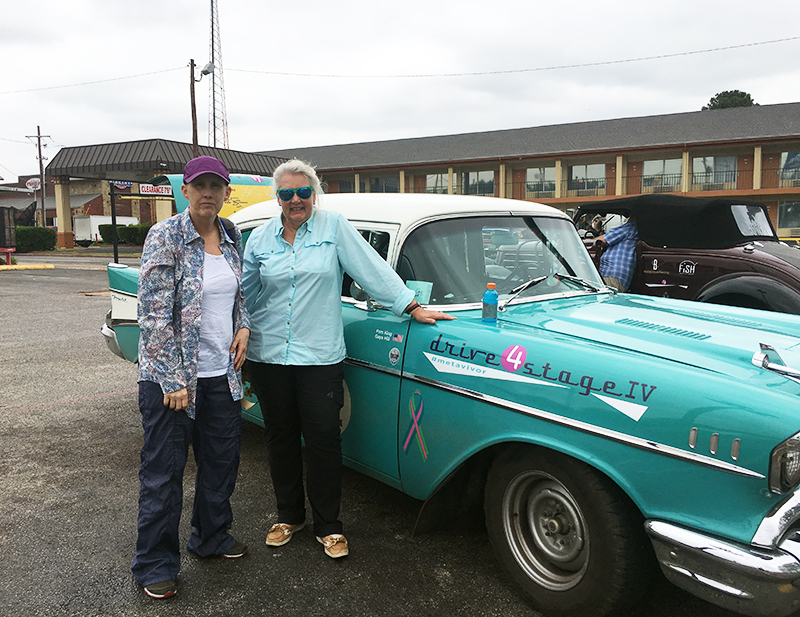 But Drive4StageIV is sticking with it - driving for Aunt Pam and all those with metastatic breast cancer. 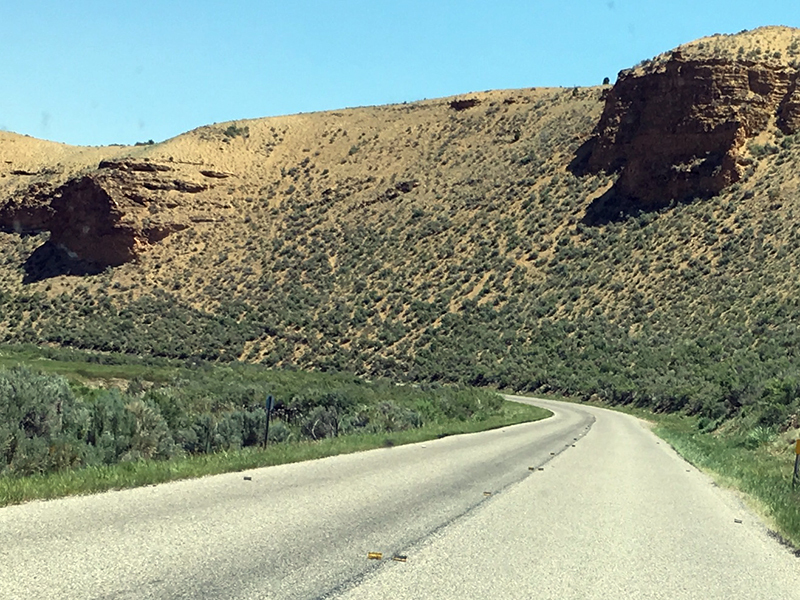 Peg reported that the route was only scheduled to be 30 minutes longer than yesterday, even though it was 130 more miles than yesterday's drive. It turned in to a very long day, 11+ hours, with some trouble thrown in. Leaving the hotel, the rally embarked on a drive that seemed pretty much straight up! Without all the switchbacks the car had driven in earlier climbs, it seemed to be doing okay - until it just quit. Tim coasted to the side of the road to safety. He looked at the engine, and thought there might be a problem with the starter. 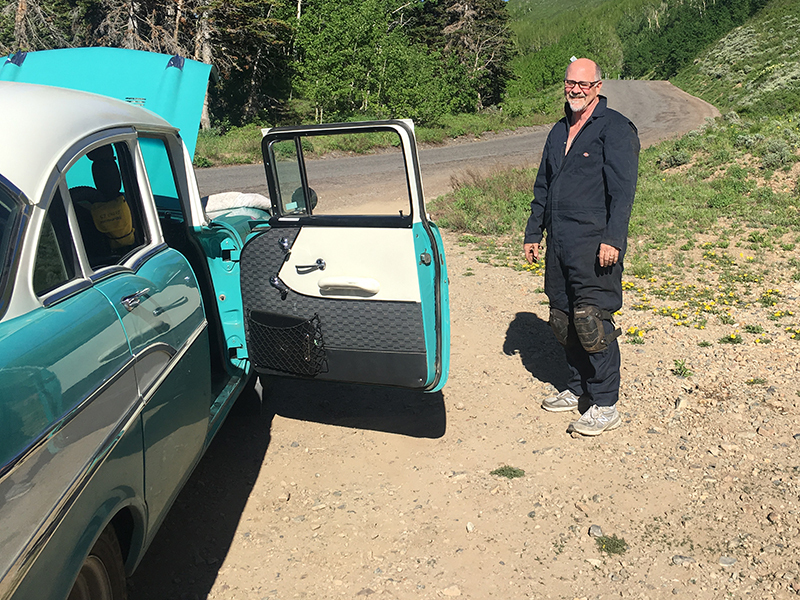 He put his overalls on, jacked up the car, then the sweeps (the mechanics traveling with the rally) arrived. Together, Tim and the sweeps decided the transmission fluid and the fuel line had gotten too hot in the drastic climb. 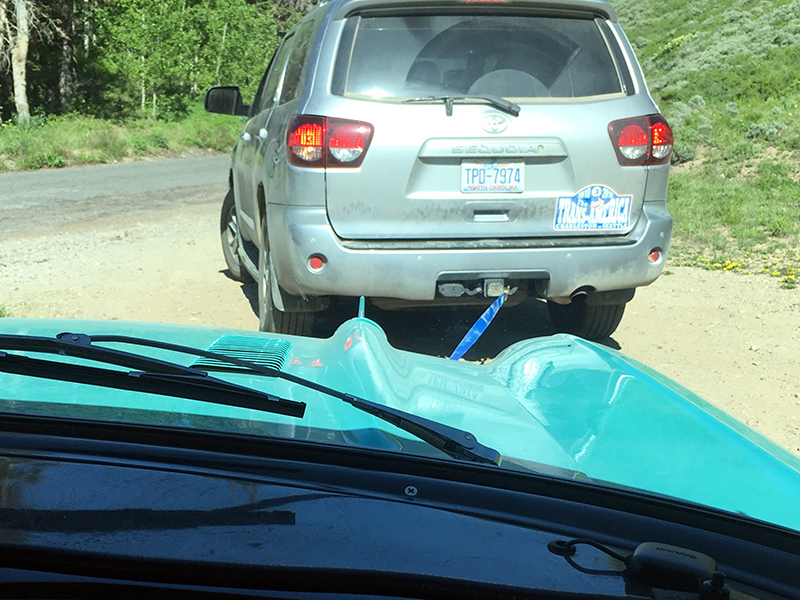 They decided to tow the Chevy to the top of the pass, then see if it had cooled enough to start. And it worked! Aunt Peg and Uncle Tim were driving again! 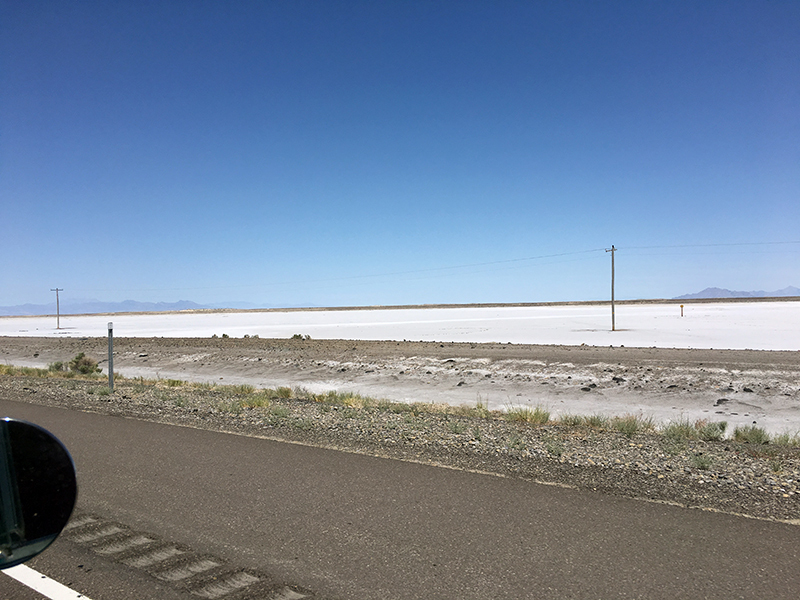 We heard from Peg and Tim as they were driving through the Bonneville Salt Flats. Peg said it was pretty desolate. 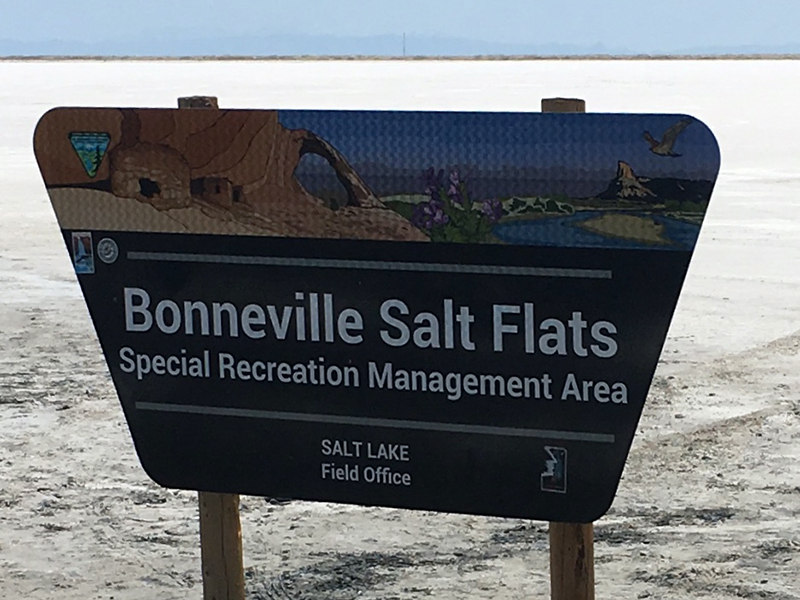 West of Great Salt Lake in Utah, the Bonneville Salt Flats are 30,000 acres in the northwestern part of the state. They are 12 miles long and 5 miles wide, a hard, dense white salt crust. Many land speed records have been set there. 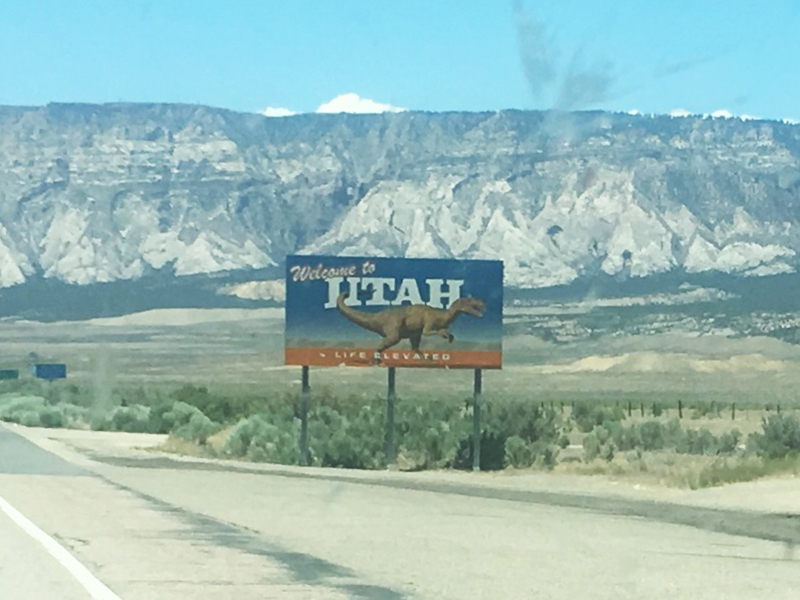 Part of the day they drove into Nevada - another new state for the rally cars! There are lots of casinos there, and lots of traffic. The rally day ended in Boise, Idaho. Most people who don't live there say boy-ZEE, but those from around there say it's more correctly pronounced BOY-see. They like it when you say it right. Aunt Pam continues to rest comfortably at home. Her oxygen helps her breathe. We got to visit again today, and lots of her other friends are stopping in. Uncle Chris has to make sure there aren't too many people there at one time. She needs to sleep a lot, but she is happy to have people talk to her. Today Dodger, Finn, Monty and I got to play with Cody in the yard a little bit. 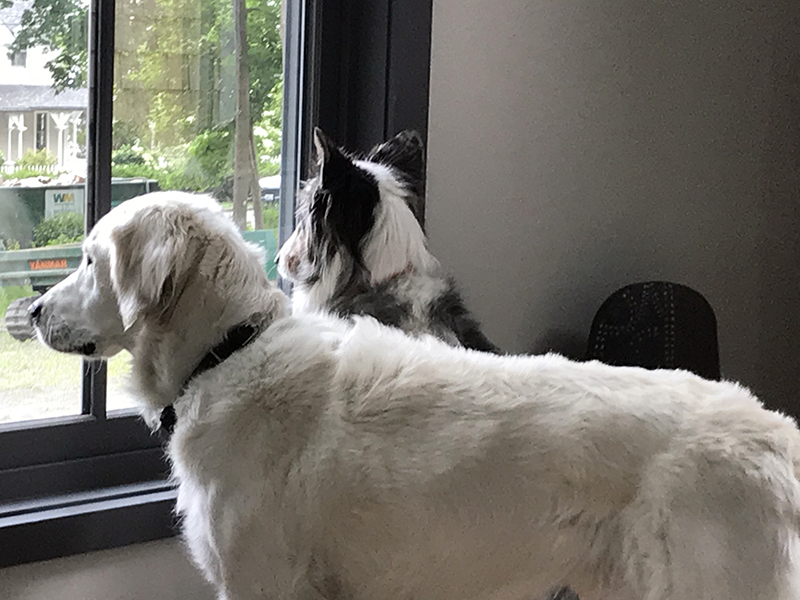 Dodger, Finn and I enjoyed watching out the windows of the den for squirrels and birds. That's fun! Next, the rally and Aunt Peg and Uncle Tim head for another new state - Oregon! More from them and from Jamestown, RI then! 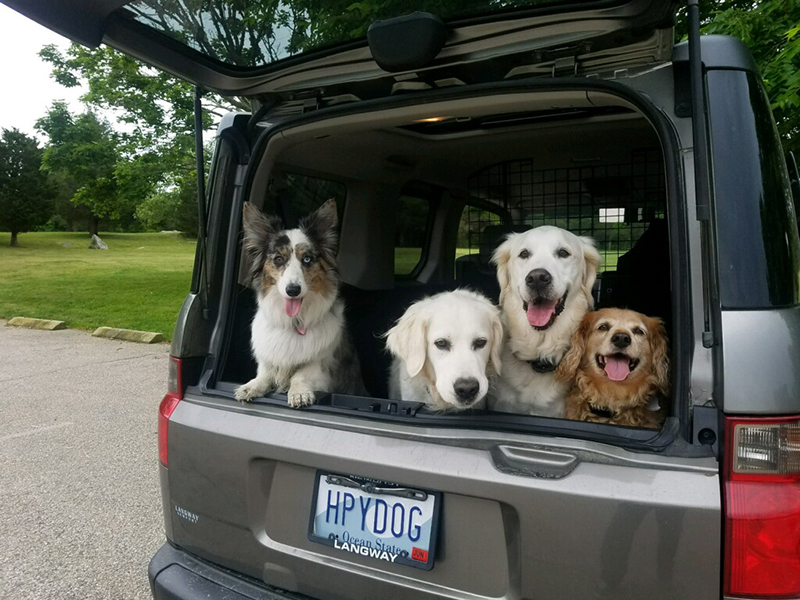 All the dogs are back together again! 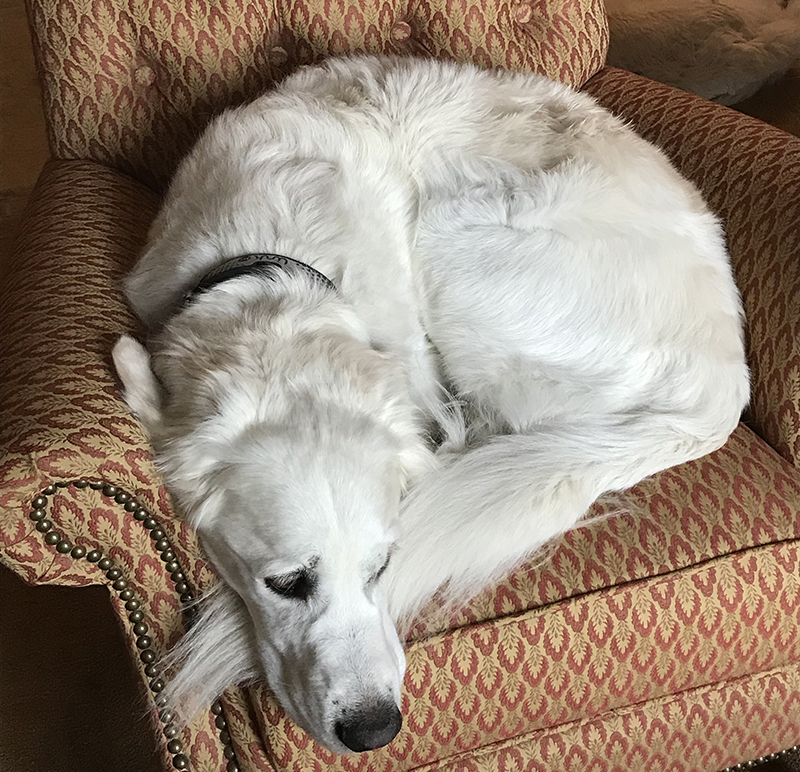 Actually, Finn and Dodger are with their Mom and Dad in their house, and I'm with my mom and dad in our house, but we're all in Rhode Island! Aunt Pam got home from the hospital today, and has a special bed in the first floor den. She can look out the windows and see Narragansett Bay, and enjoy the beautiful green trees outside her windows. When we went to visit, Monty was there with his dad, Don! It was great to see them. Aunt Pam's mom Pat was there, too, but not little Cody; he was with his friend and puppy trainer, Wally. Colin was there, too. (Pam and Chris' Colin, not my mom and dad's Colin.) It was great to see everyone! Aunt Pam was glad to see us, and my mom spent time sitting and talking with her, while my dad visited with Uncle Chris. It is good to be home. 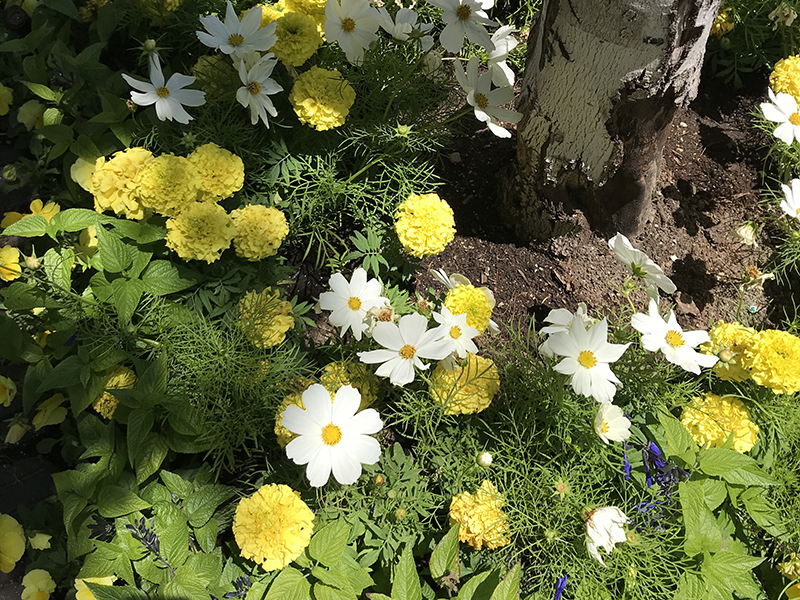 They will have lots and lots of people visiting this week and next, all sorts of friends and family to come talk to Aunt Pam, help in whatever way they can, and remind us all how many people Aunt Pam has helped in her life. It will be fun to see all those people who love Aunt Pam like we do. Pat and my mom talked about how terrible it is when metastatic cancer patients run out of treatment options, like Aunt Pam has. Metavivor is trying to change that, and our team driving the rally is helping to tell people about the need for more research into treatment options, and to raise more money for research. Drive4StageIV was on the road today! 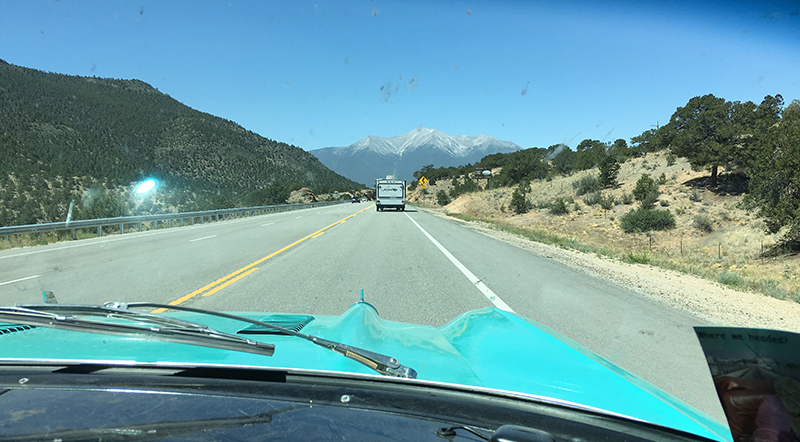 The Chevy Bel Air, driven by Tim and navigated by Peg, started at 8:30 AM, heading to Park City, Utah. My mom looked out the window and saw them driving down the street! Right out of town, they hit the desert. 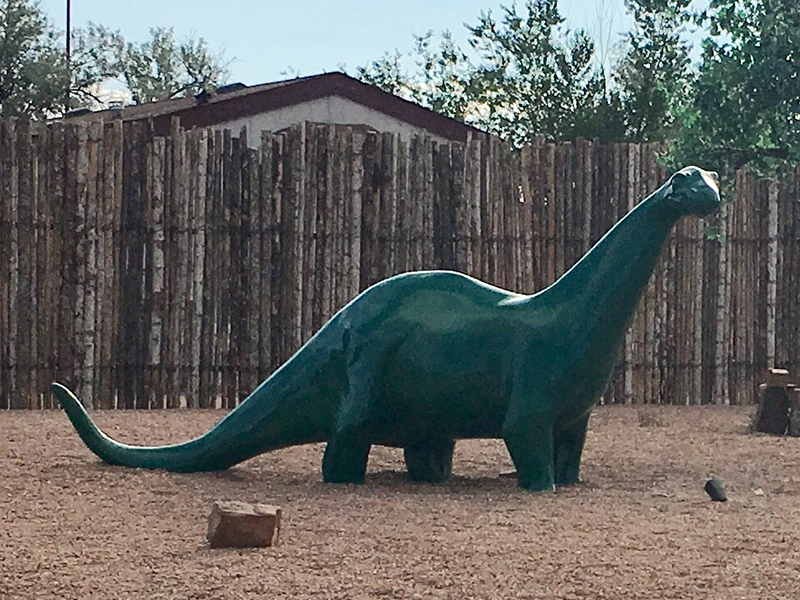 The first town they came to was Dinosaur City. What fun Finn, Dodger and I could have had with those old bones! Lunch was at a convenience store and it was very hot. Peg said lots of people were standing under the only tree, hoping for a little cool shade, just like the cattle do. In the town of Altamont, all sorts of town's people showed up to see the rally cars. They said the newspaper had lots of stories about the rally coming to town. Peg said it was fun talking to them, and more people learned about Drive4StageIV! As they were driving, they went past a sign that said "No Hunting in the Cemetery". There must be a good story there. 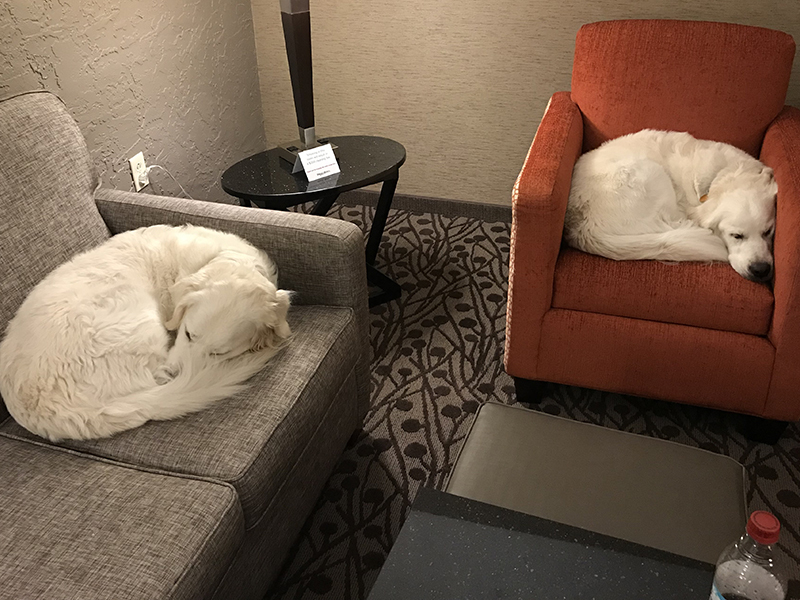 Uncle Tim reports that they never went above 3,000 RPM, and 60 MPH, and they still arrived first at the hotel in Park City! The car ran really well through the desert, and even climbed a 10,000 foot pass without any problems. That is great news! All the rally mechanics, marshals, and participants are sending their good thoughts to Aunt Pam and Uncle Chris. I hope they can feel that caring! Tomorrow the rally drives to another state - Idaho! It will be another long drive, so be careful, everyone! 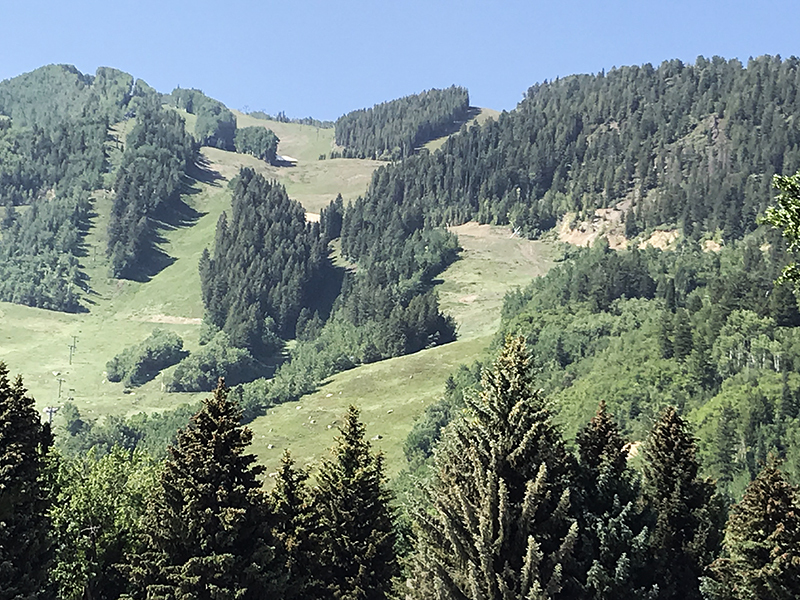 Today was a rest day in Aspen, but we had a lot to do, since our plans have changed. Aunt Pam received some hard news from her medical team. Her last treatment option has stopped working, and nearly 3 years after her Stage 4 diagnosis, she will be released from the hospital into hospice care. So my mom and dad, and I, will leave the rally to go back to Rhode Island to be with Aunt Pam, Uncle Chris, Finn and Dodger. We fly there tomorrow. But the rally continues and so will Drive4StageIV! Tim will drive the Chevy and Peg will navigate. They should have a good time, and they'll keep telling the Drive4StageIV story. My mom and dad talked to a lot of the rally people and everyone is on Team Pam. Tony - one of the mechanics, told Tim they would make sure the Chevy comes across the finish line even if they have to tow it across! The Ford will stay in Aspen, at a friend's house, until we can send it back to Rhode Island. Aunt Pam wanted to drive this rally to help people learn about metastatic breast cancer and the need for additional funding for research. Drive4StageIV has done and is doing that! 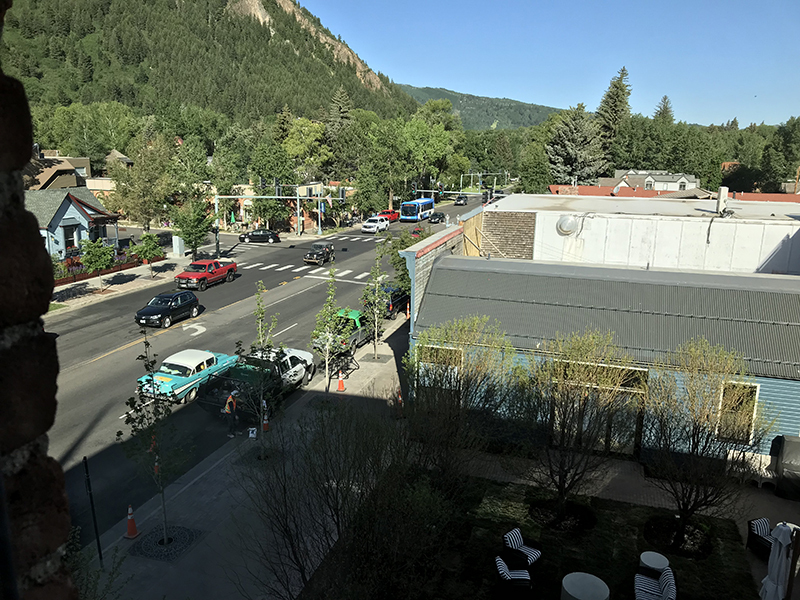 Aspen is a nice city. 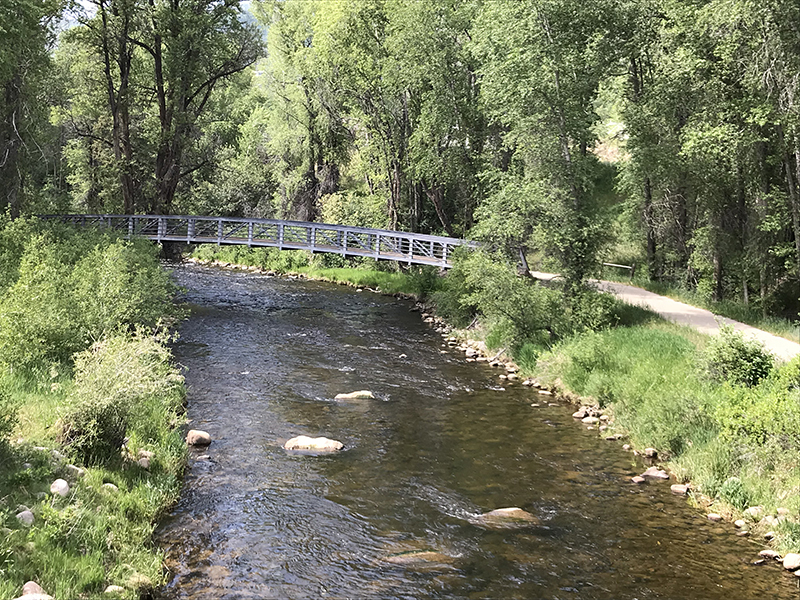 It's very dog friendly, and a beautiful Colorado location. We walked all over! Tim got the transmission fluid changed in the Chevy, and he and Peg will be starting first tomorrow! 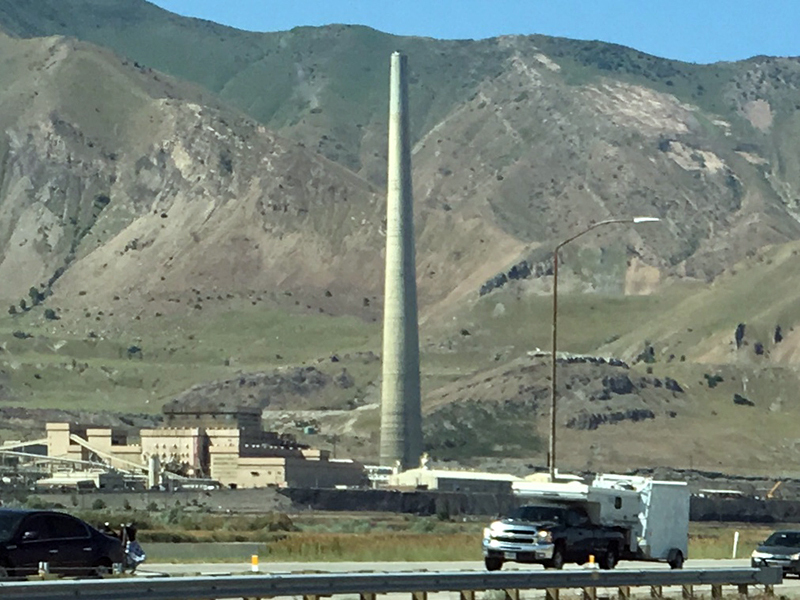 They have a long day, finishing after 6:30 PM in Utah. I'm sure it will be an interesting day for them, and I can't wait to hear all about it! We'll say goodbye to Willie, too. He'll be returning the rental car in Boulder, CO and will visit people he knows there. And I get to see Aunt Pam and Uncle Chris tomorrow! 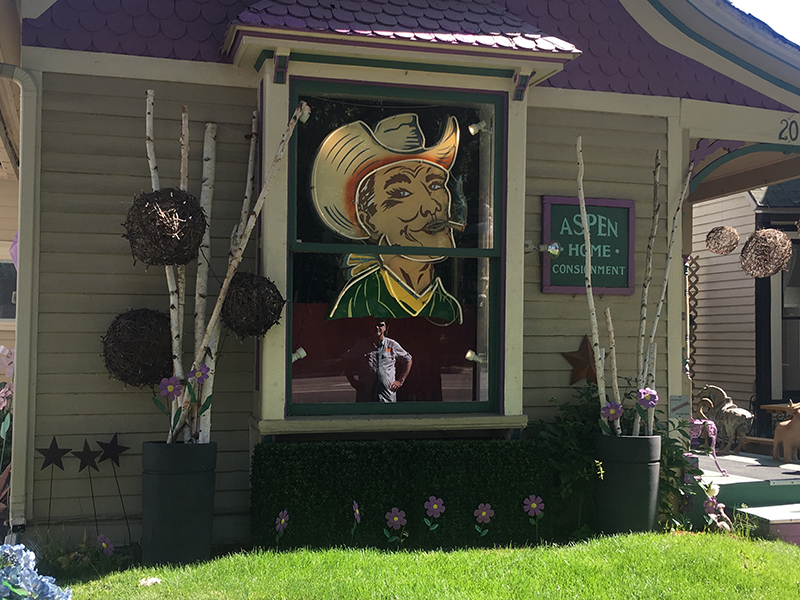 Today we arrived in Aspen! It wasn't an easy arrival. 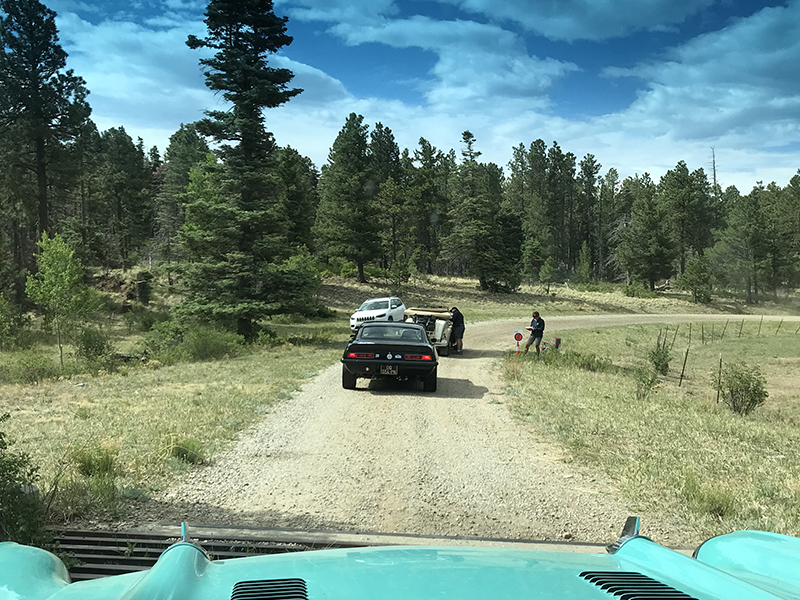 We decided this morning that with the condition of the Chevy, it would be better not to drive the rally route over Pike's Peak. 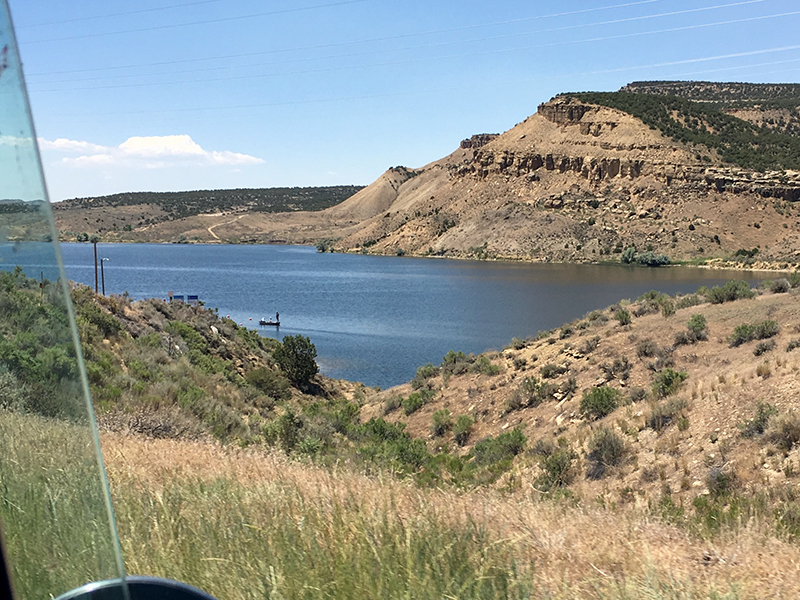 So my dad and Tim in the Ford, and my mom, Peg and me in the Chevy, (and Willie in a rental car), left the hotel in Colorado Springs to head to U.S. Highway 24. Soon we were out of the city, and driving in wonderful country. The air was nice and cool, and the car was running well. The Ford was right behind us, so we all were traveling together. 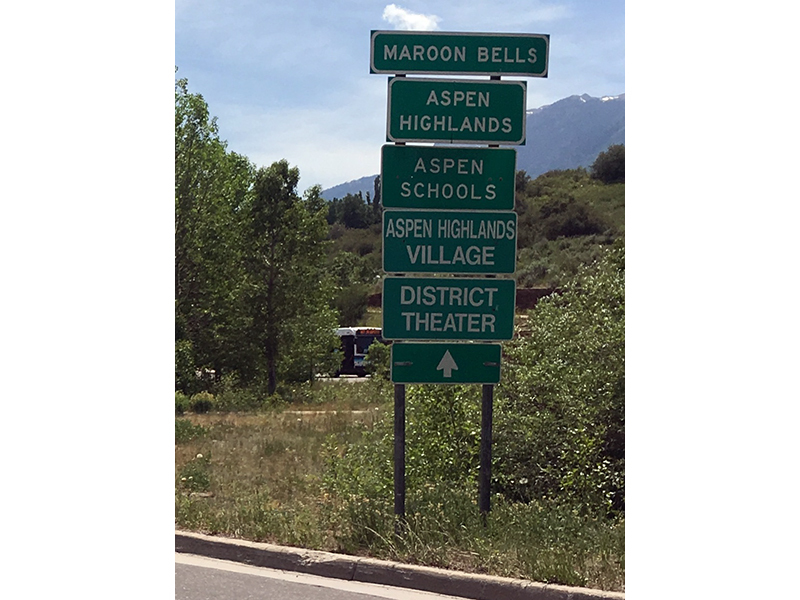 We started in Colorado Springs at an elevation of about 6,000 feet and ended in Aspen at about 8,000 feet. We climbed a lot of mountains to get there. The mountains were beautiful, with snow up at the tops, wonderful pine trees, and some aspen. There was a great road that ran on and on, and the nice flat valley kept the Chevy from having problems. But every time we had to climb and drive the looping road, my mom had to downshift, and the car made a grumbling noise. Once she thought we were getting a vapor lock, but it cleared, and we kept going. After about 2 1/2 hours of driving, we stopped in the little town of Twin Lakes. This place had an elevation of about 10,300 ft. There was no restaurant, so we went into a convenience store and bought snacks and cold drinks. I got to go in, too! The people were all very nice. I did a little hike with my mom, too. Then we were back on the road, climbing, and climbing... 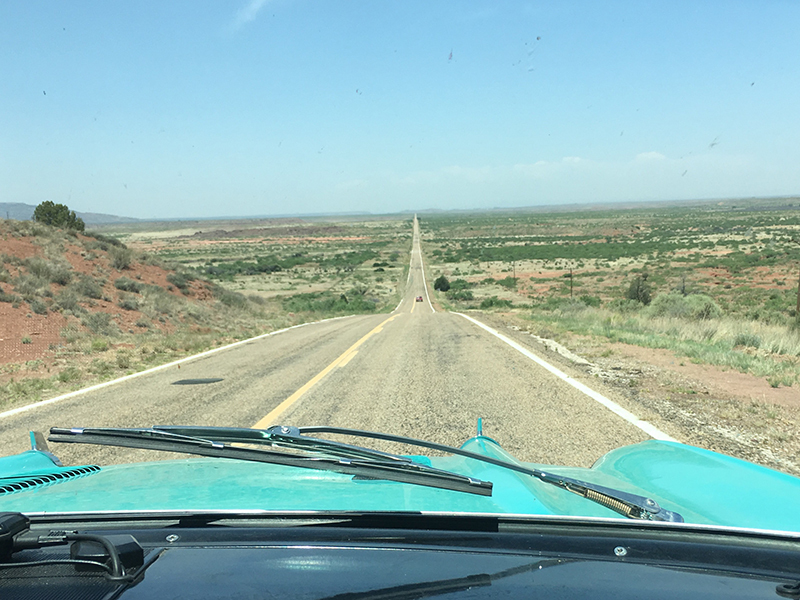 There were lots of switchback roads, and the Chevy could barely make it above 20 miles per hour! Soon we were at an altitude of 11,400 feet! And the Chevy started making a choking sound, with no fuel getting to the engine. My mom tried shifting into second gear, and nothing happened! We kept going, but soon we pulled over to the side of the road and the car died - vapor lock! The Ford was right behind us. We sat for about 5 minutes with the hood open to cool the engine, then tried again. We barely made it 1000 yards up the road, when it vapor locked again. Uncle Tim said the transmission fluid was burning, and wanted to drive it a little to experience the symptoms of the drive. So my mom took me out of the Chevy, and we got into the passenger seat of the Ford. The Chevy took off, and we followed. We went around a corner and there was the Chevy by the side of the road again. We all waited for a while, and my mom hiked up the hillside with me. 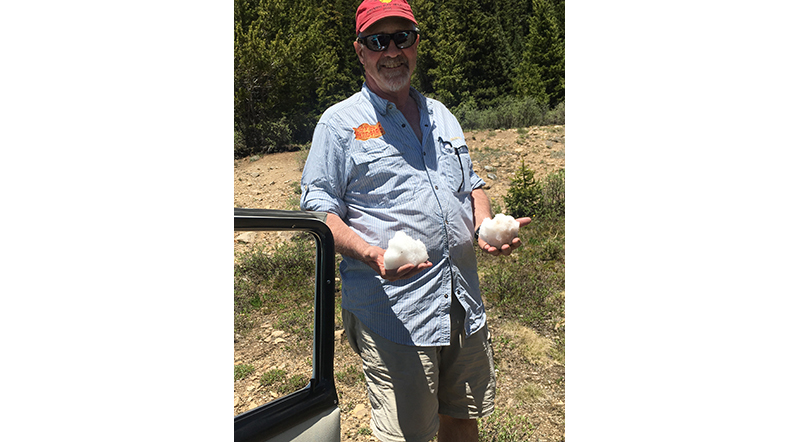 Then Uncle Tim walked off and came back with two snowballs! 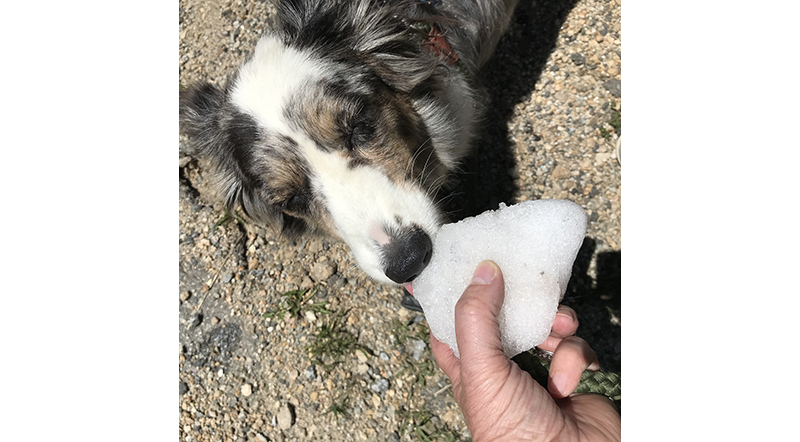 They tasted great, and Mom rubbed me all over with the snow. That felt wonderful! 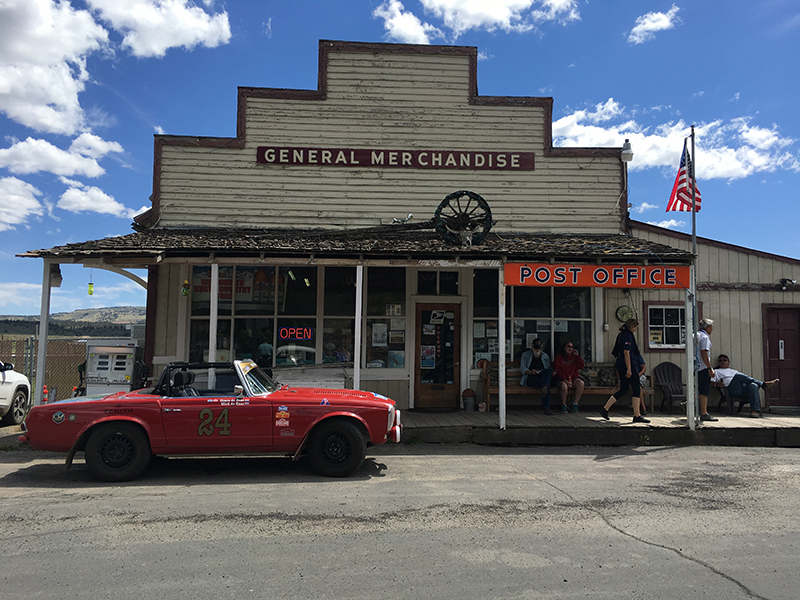 We decided that maybe the Chevy needed more help, so my mom and dad and I figured we could drive the 25 miles down into Aspen, and get some. We left Aunt Peg and Uncle Tim with the Chevy, and we drove in the Ford. But before we could get down into Aspen, we had to climb the rest of the way over Independence Pass - more the 12,000 feet in elevation! The Ford made it, but it was making vapor lock noises too. 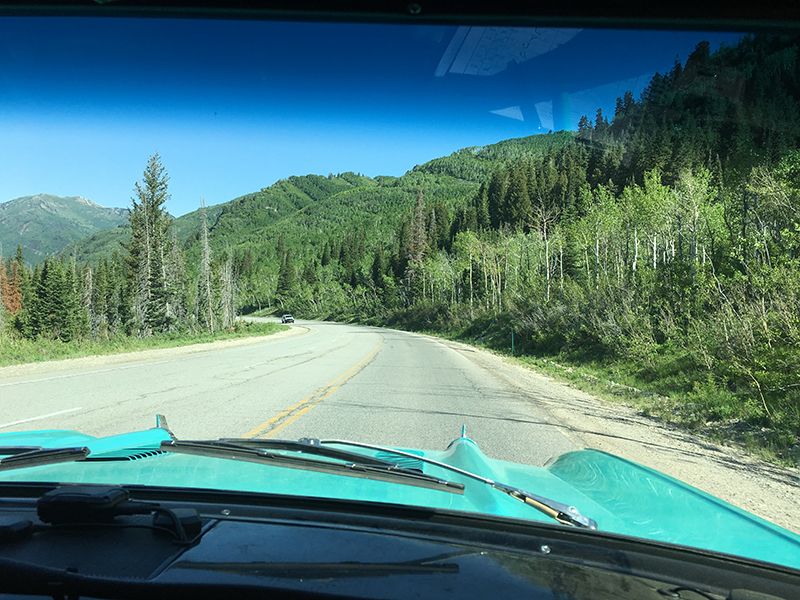 But my dad down-shifted, and made it around the tight turns in the road, and soon we were headed down into Aspen. We pulled up in front of the hotel. Boy, as much as I love sitting on my mom's lap, it was hot in the Ford without a roof, and it really smelled like gas and burning clutch! Riding on my shelf in the Chevy is way more comfortable and it has great breezes! Once in the hotel, my mom's phone rang! It was Peg, but they had a terrible connection, Eventually on the third try they could hear each other, and Peg said they were almost in Aspen. 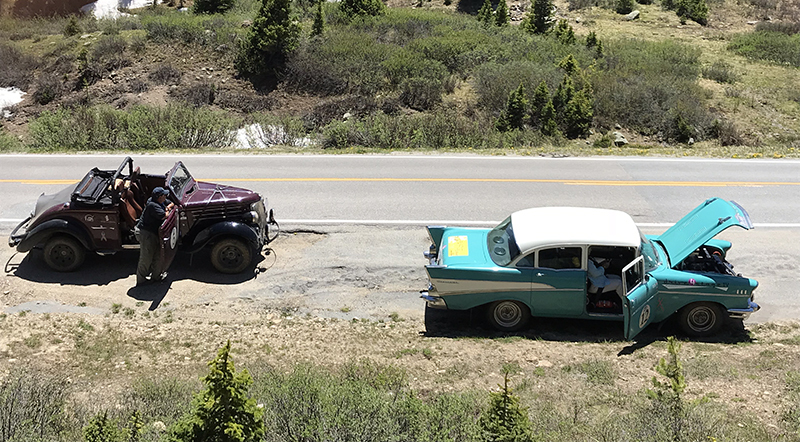 After letting the Chevy cool for about 45 minutes, they were able to make it over the pass, and down the other side. But Tim didn't slow down much in the turns, and Peg was really glad to climb out of the car when they arrived. Tim has an appointment with a garage tomorrow morning, and he and my dad will figure things out for the rest of the trip. Stay tuned! Meanwhile, back in Rhode Island, my Aunt Pam went to the doctor, who wanted her to check in to the hospital. So she is there tonight, getting checked out, and hopefully getting treated to feel better. My mom has been sending her and Uncle Chris some of the pictures you see here, and she was smiling at the car stories. I hope she gets to home to Finn and Dodger soon! Having metastatic breast cancer means spending some time away from your dogs when you have to be in the hospital to keep you from feeling so bad. Wouldn't it be great if some researcher could figure out a way to make metastatic breast cancer a chronic disease instead of a terminal one? That is the question Metavivor asks every single day. 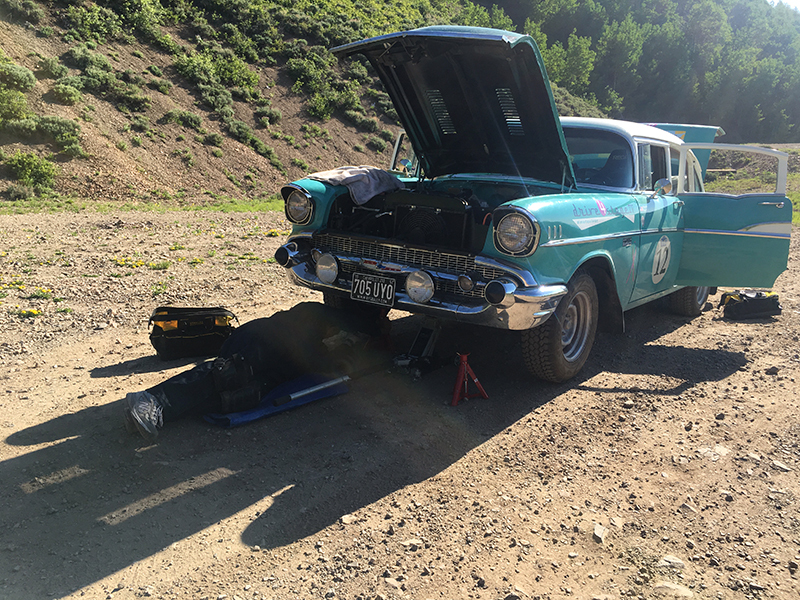 Tomorrow we will stay in Aspen, and hope to figure out the Chevy's problems. We will still have more elevation changes ahead, as we drive into Utah on Wednesday. Hi! This is Gemma. 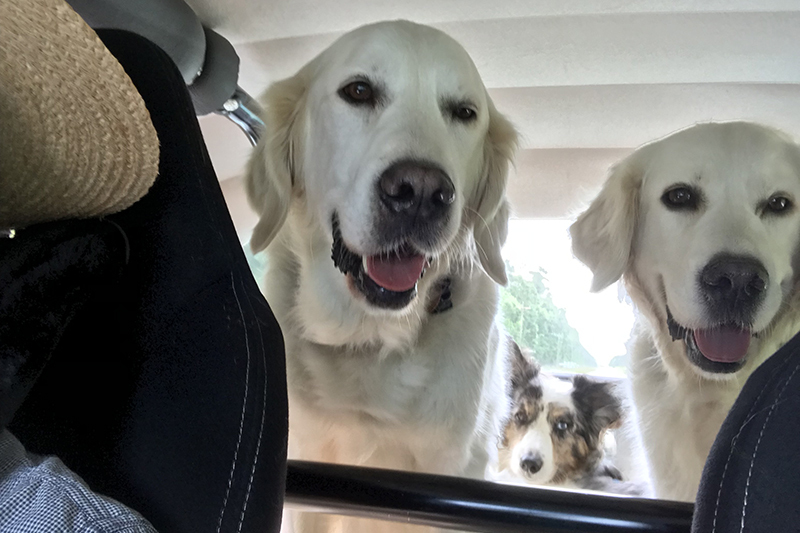 My friends Finn and Dodger asked me to continue the dog blog from the Drive4StageIV teams while they are back with their mom and dad in Rhode Island, so here we go! Today was a beautiful drive, but very long. 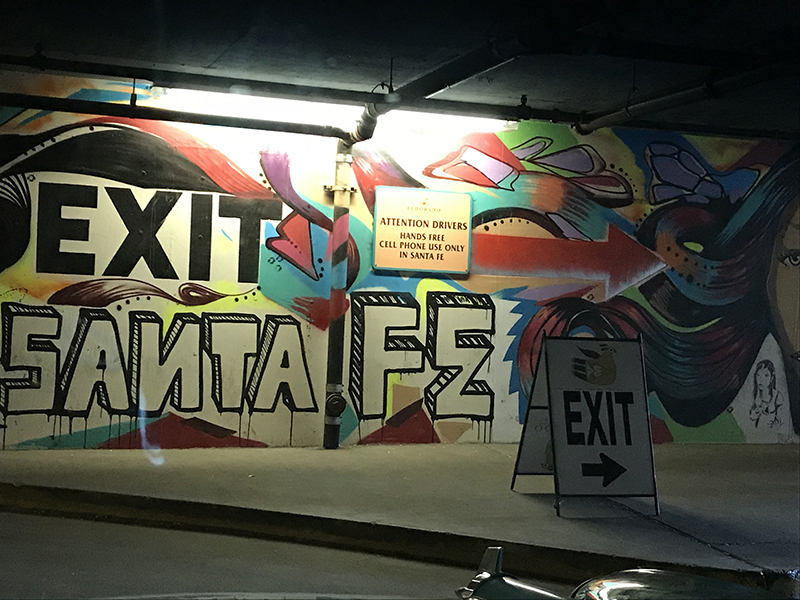 We left Santa Fe at 7:30 AM, and got to the hotel in Colorado Springs at 6:45 PM! 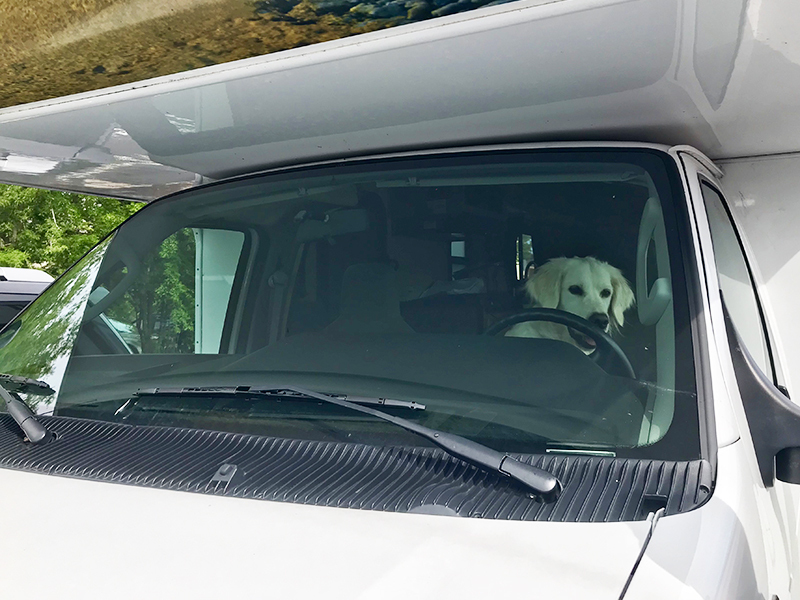 Finn and Dodger have been driving in the RV to take care of their mom, so I've been the only dog in the Chevy Bel Air! It's really comfortable, and I have a special water dish that doesn't splash or tip over. There are bags filled with water that make comfortable pillows, too. 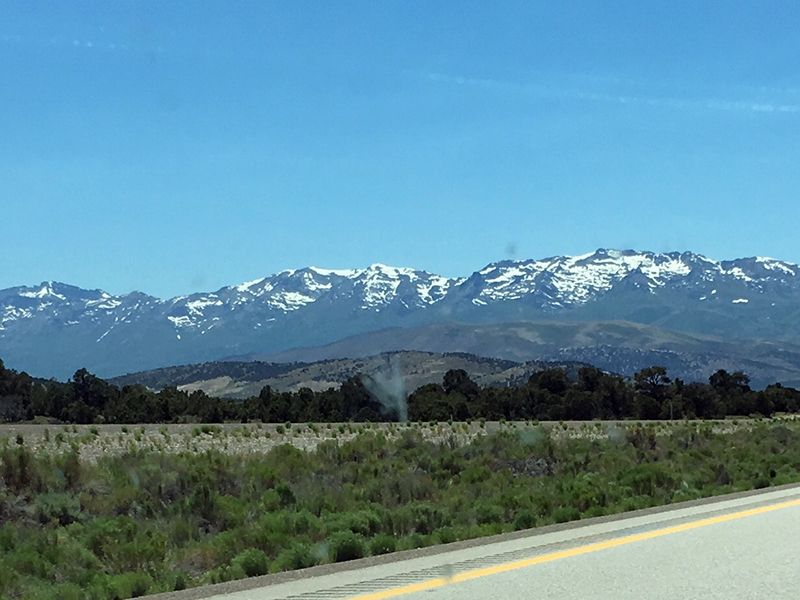 We had an adventurous drive up mountain passes, and we saw mountains in the distance with snow on them. 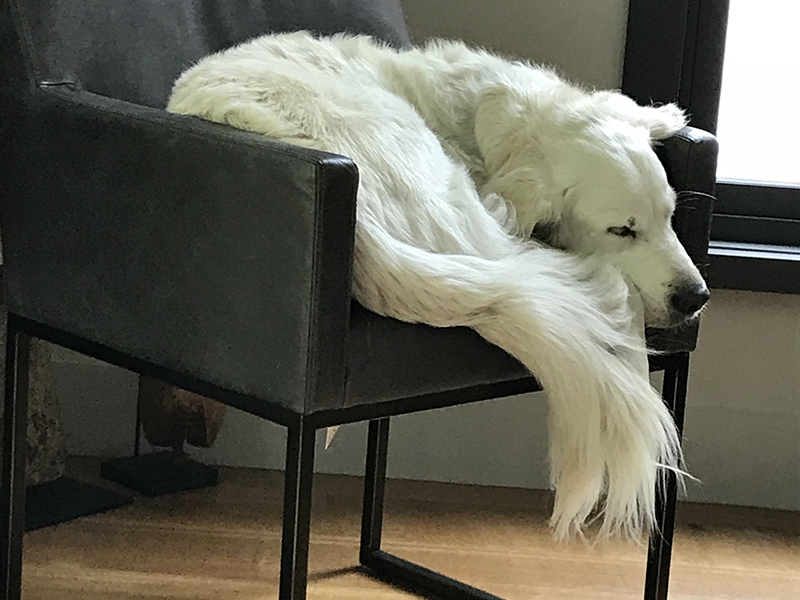 It was cooler all morning, too - great weather to sleep! We saw lots of animals: cows, deer, hawks, an eagle, and lots of gophers like we have at the ranch in Montana. 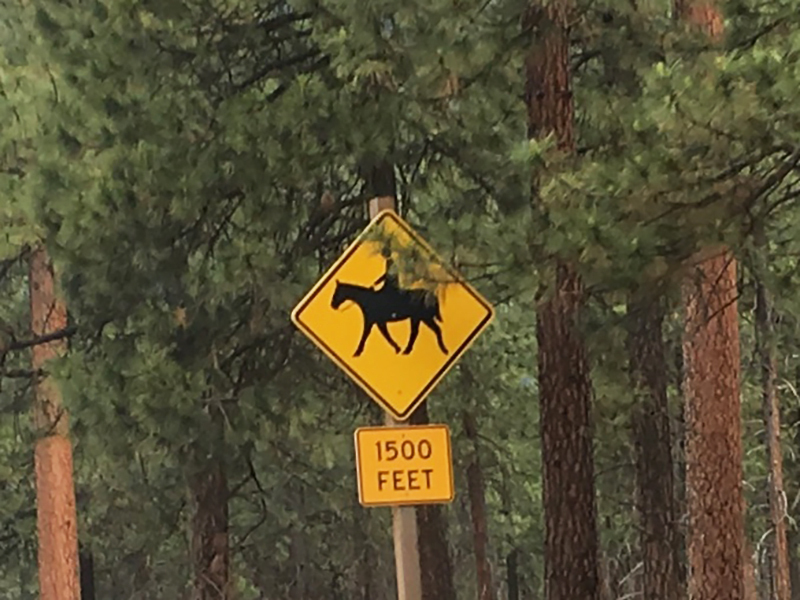 There were animal signs posted on the road for elk, deer, cows, bears, and mountain goats. We had lots of twisty turns, climbing, and then the descent. All fun, but sometimes the car made a very grumbly sound and slowed down even though my mom was pressing the accelerator as close to the floor as she could! The Metavivor RV, driven by the Knowles, met us at lunch in Raton, NM! These nice volunteers help spread the same metastatic breast cancer awareness message and how more funding is needed for research to help people like Aunt Pam. It's all part of Metavivor's Sea to Sea for MBC program. We'll be seeing these nice people all around the route! My mom and dad were teasing Uncle Tim about navigating. Even though he is a really experienced rally driver, he's only navigated for four days! Because Aunt Peg stepped in to help Aunt Pam with navigating for my mom, she has become an experienced navigator without ever having been in a rally before this. So we are all telling Tim to ask Peggy for help! The Chevy is having a vapor lock problem. The gas in the fuel line gets heated up and expanded due to altitude and turns to vapor. Car engines need liquid gas, not vapor! The car can't accelerate, and then dies. It can be dangerous, because all my mom can do is pull over to the side of the road and wait for it to cool off. Then we can start up again. We had another problem, too. During one of the regularities, a stone bounced in to the engine and bent a blade on the fan! Tim was able to fix it, but the whole fan needs to be replaced. We will decide what to do, to get to Aspen, our next stop. 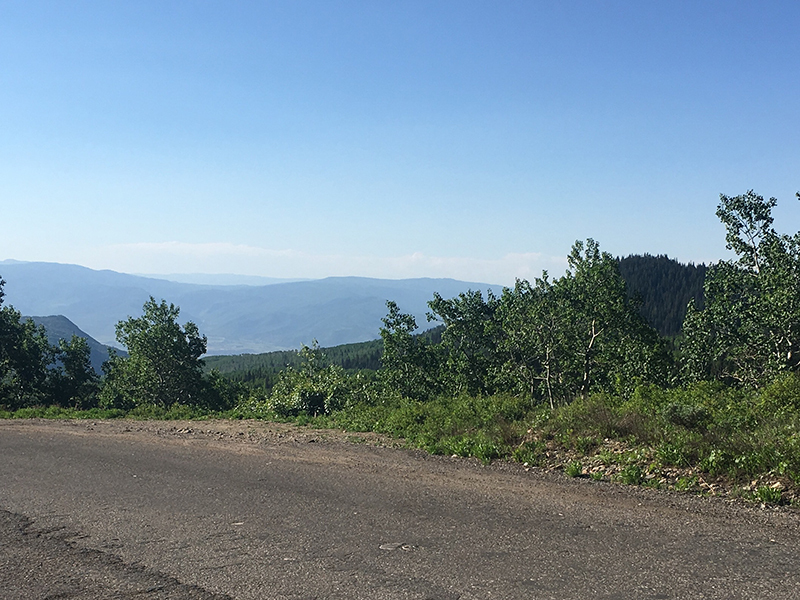 There are a lot of altitude changes to climb over Pike's Peak, and that will be hard on the Chevy, and we want to be sure we get to Seattle for the official finish of Drive4StageIV! 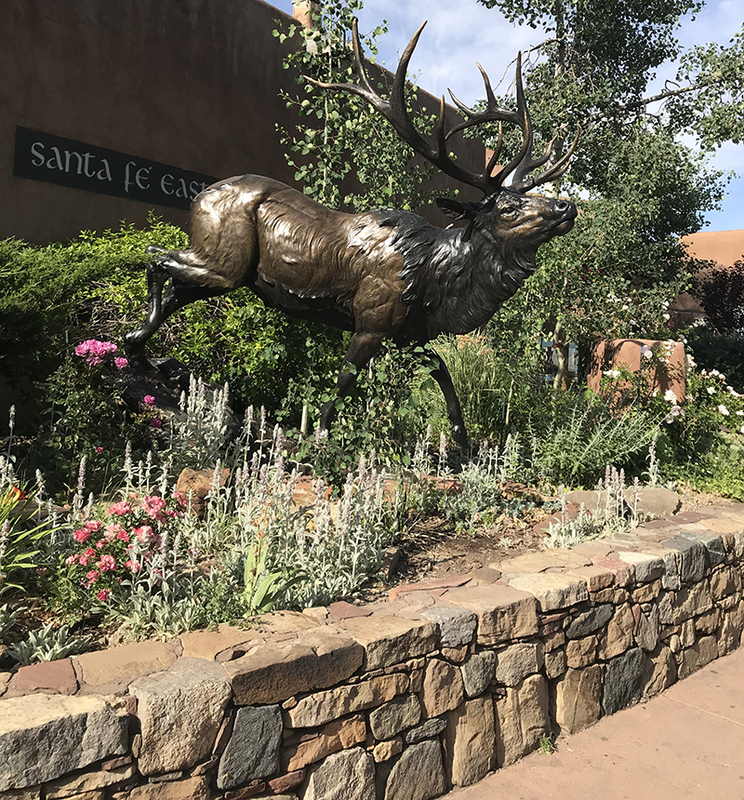 It was a great rest day in Santa Fe! 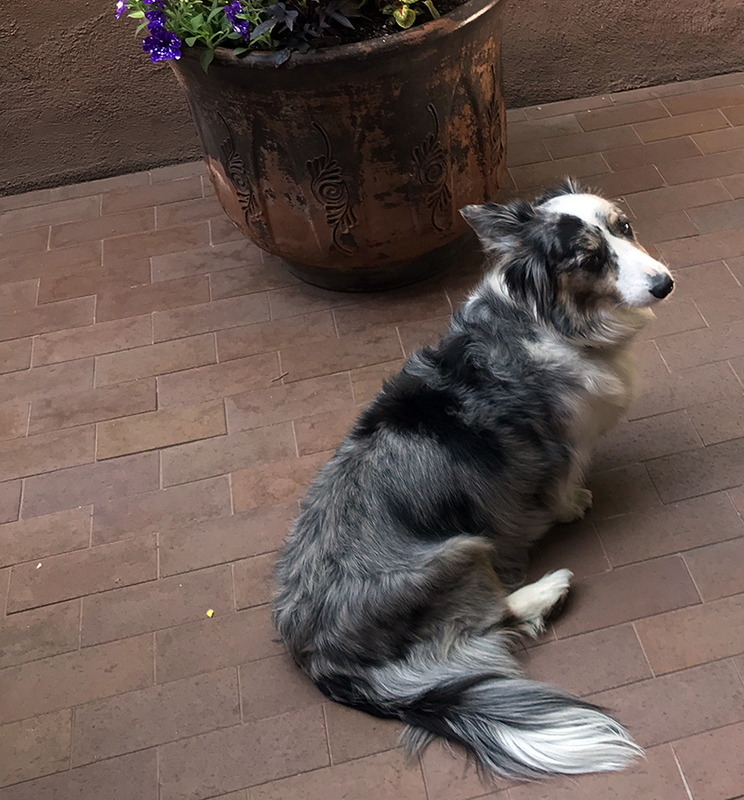 Our hotel is nice, and the people here really like dogs! We had people visit us today, too! First, the Metavivor Sea to Sea for MBC RV came! 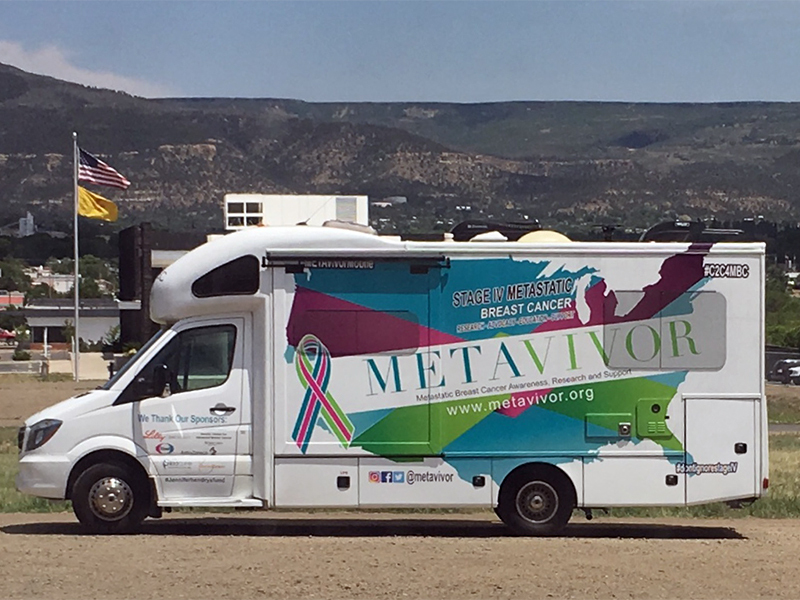 Metavivor uses this RV to do what we're doing with Drive4StageIV; raise awareness about metastatic breast cancer, and donations to support research. Thank you to Patrick, for driving it here all the way from Arkansas. So - we'll be seeing them along the way. Then a long-time friend of our mom's, Amanda, stopped by. She just happened to be here the same time we were! It was fun to meet her, and for our mom to see her. The best for us was we got to hang out in the hotel lobby all morning! We could look out the open doors, feel the cool breeze, and say hello to a lot of people. Tim and the rally mechanics checked out the cars today, making sure they were ready for the altitude climbs to come. They figured out the problem with the Chevy yesterday was a vapor lock, caused by the heat. The fuel got hot, and condensation formed. The only way to fix this is to stop and let the engine and fuel cool down. Tim got worried when he realized the dog hood ornament on the Ford was missing! He thought someone had stolen it and was mad. But our dad told him it had come loose yesterday, and when he couldn't tighten the stripped screws, he took it off for safe keeping. So that made Tim relax! Tim returned our RV today, because our mom and dad decided to go back to Rhode Island. Of course, we'll go with them. Our mom will go see her doctor Monday morning, and will spend some time resting in our own house. The plan is for our people to go back for the end of the rally, but we probably won't get to go. We'll all be hearing about the next seven days of the rally from Gemma! Tim will drive in the Ford with Gemma's dad, and Peg will drive with Gemma's mom. Gemma will keep riding in the Chevy! 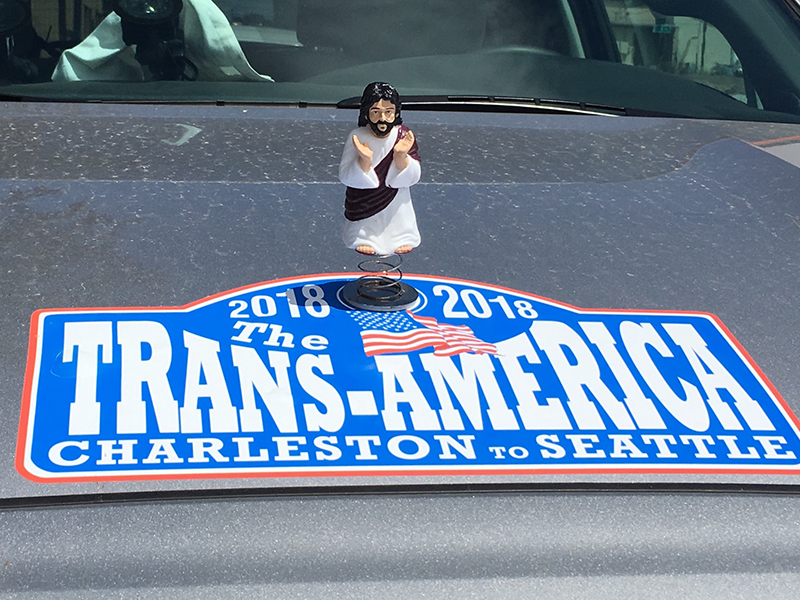 Willie rented a car and will be driving along to all the places the rally will stop. 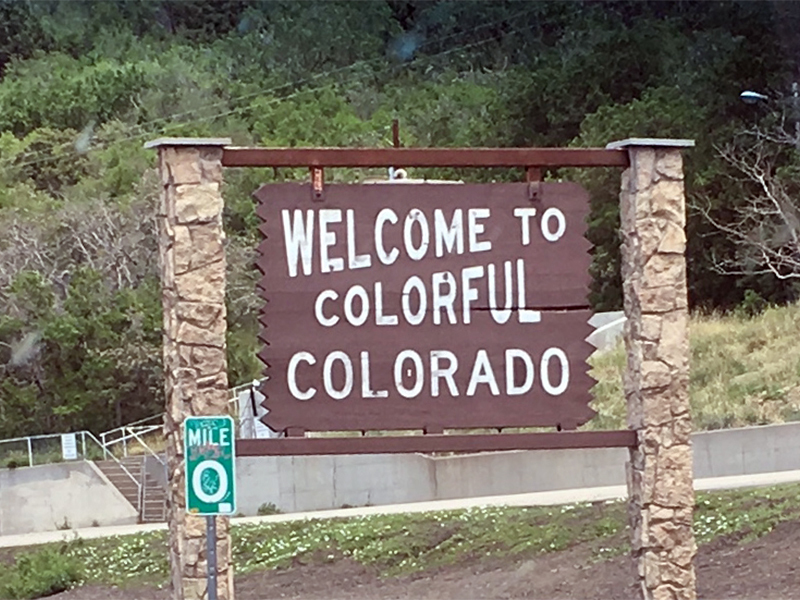 Tomorrow the rally heads to another new state, and will be in Colorado Springs for the night. Gemma will pick up the dog blog then! Keep following and supporting Drive4StageIV - and our mom! We're in a new state! It even has "new" in its name! New Mexico! Of course - it's old to a lot of people and dogs (including Gemma-she's been here before), but it's new to us! 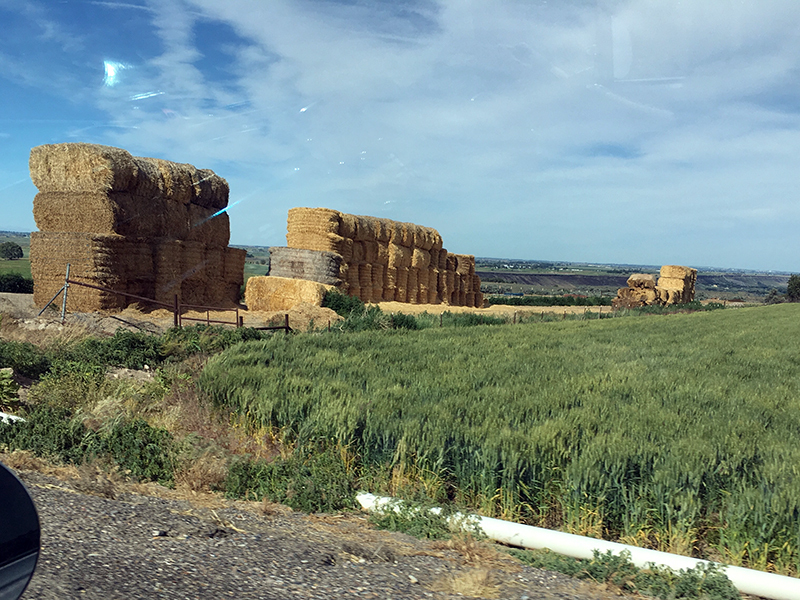 We started the day in Amarillo, and it wasn't hot! There was a thunder and lightning storm during the night, but it was windy, dry and cool in the morning. All of us (dogs and people) ate breakfast and then Tim picked us up in the RV. We all went to the rally hotel. 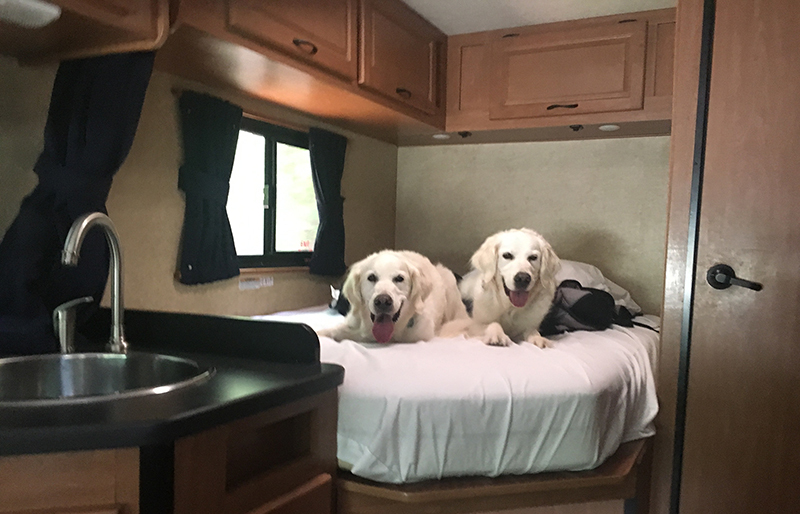 We stayed in the nice, cool RV with our mom. Gemma, her mom and dad, and our dad headed out to get ready for the rally day. The Chevy was the second car to start. They mix up the cars every day so everyone sees different cars and people during the day's drive. But Aunt Gaye, Peg, and Gemma found it really different to start so early, and to have the Ford behind them. We had a great day riding straight to Santa Fe in the RV with our mom, Tim and Willie. 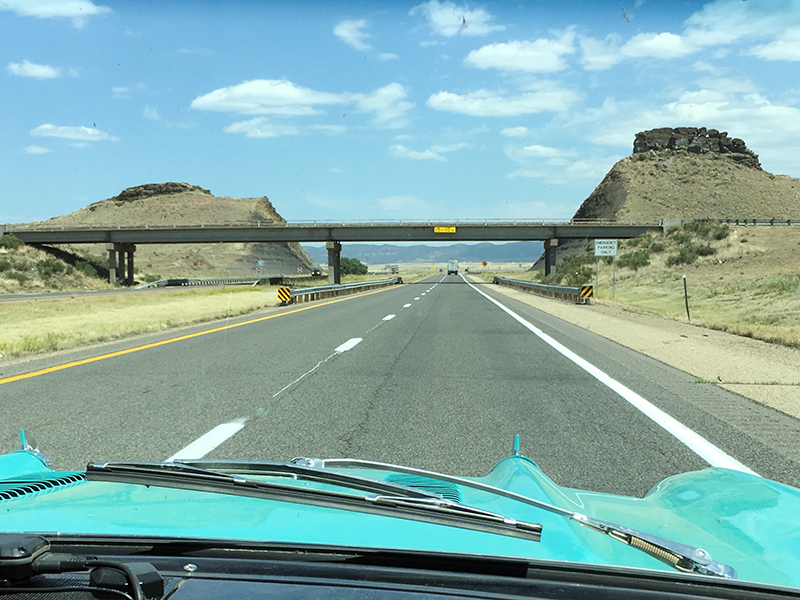 The rally cars had an adventure driving on old Route 66, the Santa Fe Trail, and seeing lots of scenic places. During the drive - boy, was it windy! Our dad said he needed to roll his window up so his eyeballs didn't blow out of his head! We don't think that could really happen, but we're glad he was careful. The lunch stop was at a cafe that had a patio where dogs were allowed, and it was cool enough to eat outside! Gemma liked sitting with her mom and dad out there. There were long stretches of driving without any gas stations, so Gemma's mom stopped two times when she could to fill up - just in case. She worries about the gas getting too low. 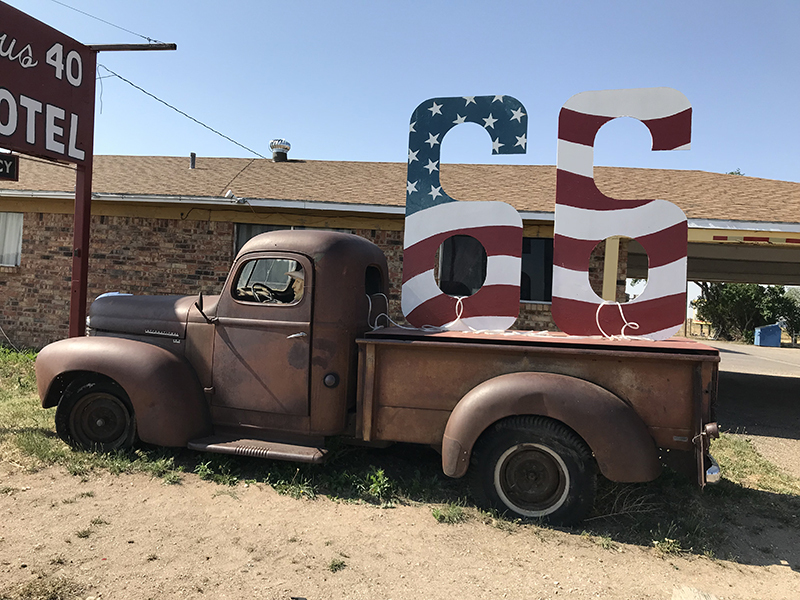 The rally stopped in Las Vegas, New Mexico. Gemma said there was a great park there with soft, thick, green grass. She walked all over, and rolled all over, and even played with other dogs. But she says she still likes us best! Then she sat in the grass with her mom. They both liked that. We are at a higher altitude now than any other time so far, and it's not as sticky hot. But it was still hot this afternoon! We took a nap with our mom in the air conditioned RV. 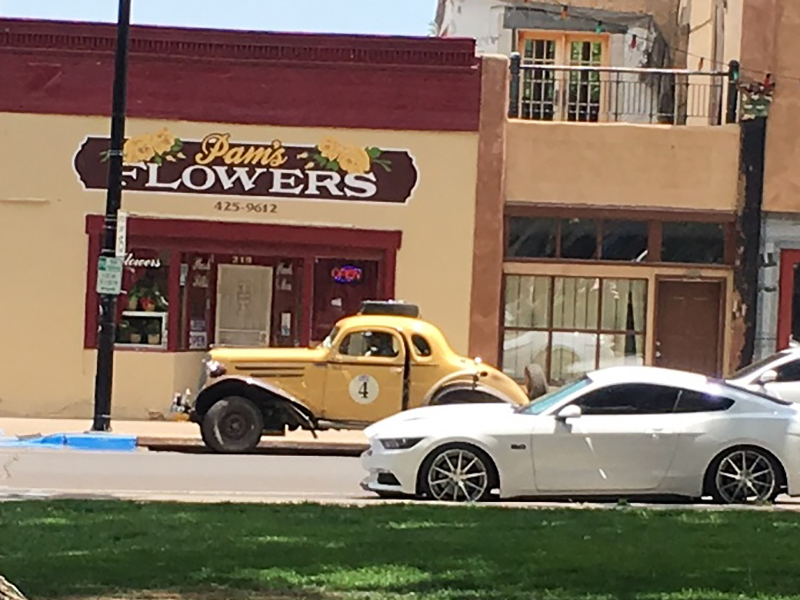 Both the cars are having some problems. Everyone thinks there are issues caused by the altitude changes today, but the mechanics are going to look at things tomorrow morning with Tim. 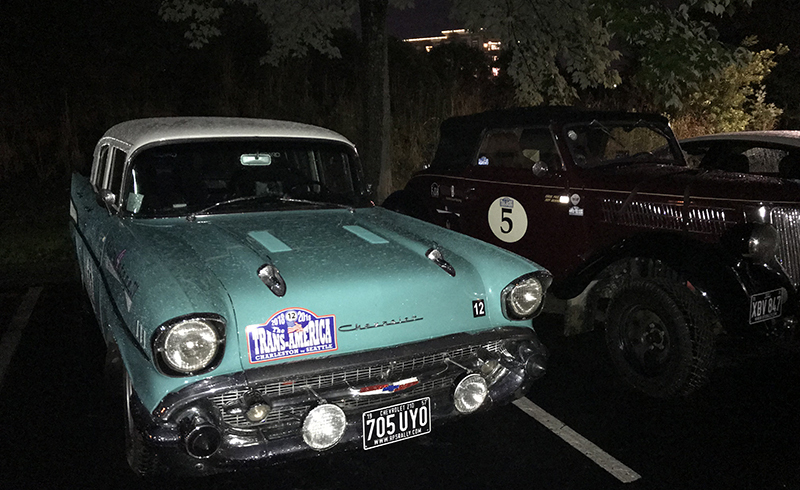 When Gemma and the Chevy arrived at the hotel, the rally people asked if the car could be one of the cars on display tonight, and her mom said sure! It's a good way to help more people learn about metastatic breast cancer and our Drive4StageIV. They parked the car where it would show off really well, then Gemma's mom and Peg cleaned all the windows and dusted it off. Then they put some of our special cards telling about our drive under the windshield wipers, so people could learn more. It looked great there! Tomorrow is a rest day, and we're talking about our mom checking in with her doctors in Rhode Island. We'll figure out a plan. Maybe Gemma will have to tell our Drive4StageIV story for the next few days! On the road from Wichita Falls to Amarillo! Today we had a late start-not until almost 9:30! That gave us all time to sleep in, and give our people time to get ready and eat breakfast. Tim picked us up in the RV and our mom got in the front passenger seat. Hooray! She was going to ride with us in the RV! When we got to the rally hotel, it was exciting! All the cars were getting ready to start for the day. We saw people putting sunscreen on, and lots of drivers doing the towel trick! Our friend Tim invented the towel trick! You soak a towel in cold icy water, then wring it out and there you go! You have a cooling wrap for your neck! It was fun to see so many drivers had learned that trick from Tim. Then everyone left the parking lot, one car at a time. We saw our dad and Gemma's dad drive away with the roof down. Then we saw our car, with Gemma in the back. We looked out the window and wagged goodbye! They were off! Once Willie and Tim got into the RV, we left the parking lot, too. First on the drive was leaving Texas and going to Oklahoma! We didn't know we were going to do that! After we drove for a while we saw mountains! We didn't know we would see mountains either! They were called the Wichita Mountains and it was fun driving up and down the hills in the road. Our people said there were a lot of nice colors, too. There were purple thistles -they're prickly- and lots of yellow flowers, and red rocks. We just take their word for that! It was cooler, too, with clouds in the sky, which was nice for everyone. 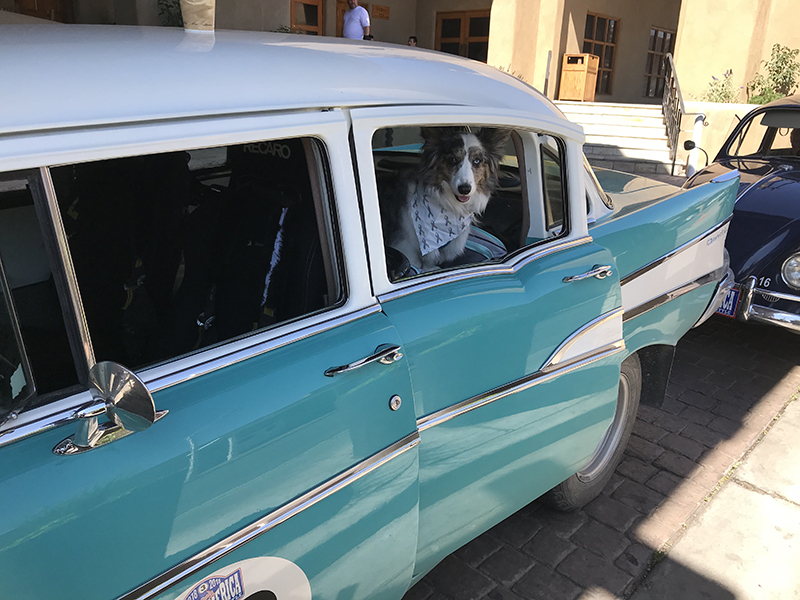 Gemma was riding in the back of the Chevy BelAir when her mom drove over a cattle guard at a wildlife park and the car started to make a terrible noise! They pulled over to the side of the road, and Aunt Gaye got out to look under the car. Then we drove in! Tim looked and listened and didn't know what to think. Then the rally mechanics showed up! They are car geniuses. Tim and Gemma's mom got the jack out to lift the front of the car off the ground. Tony and Andy saw the problem right away. One of the bolts on the brake pad disk had pulled loose! The smart mechanics fixed it right away, then checked the lug nuts on the tire just in case. The Chevy was ready to go! 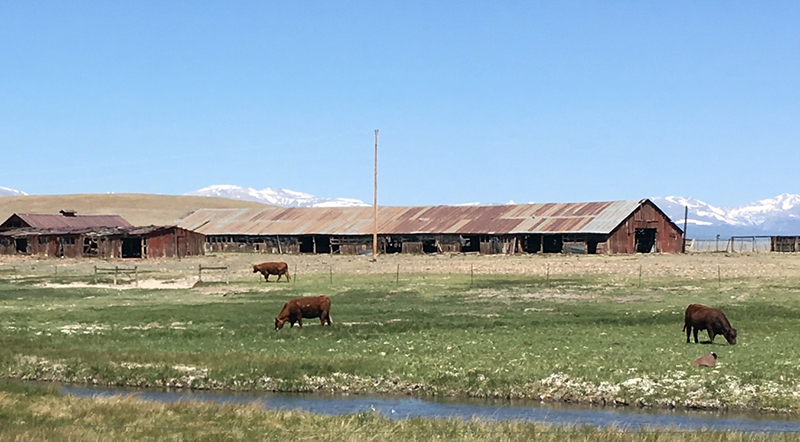 Driving through the wildlife sanctuary, we saw longhorn cattle, which was cool. But our dad saw buffalo! We guess all those early cars scared them away so they were off the road watching us when we went by. 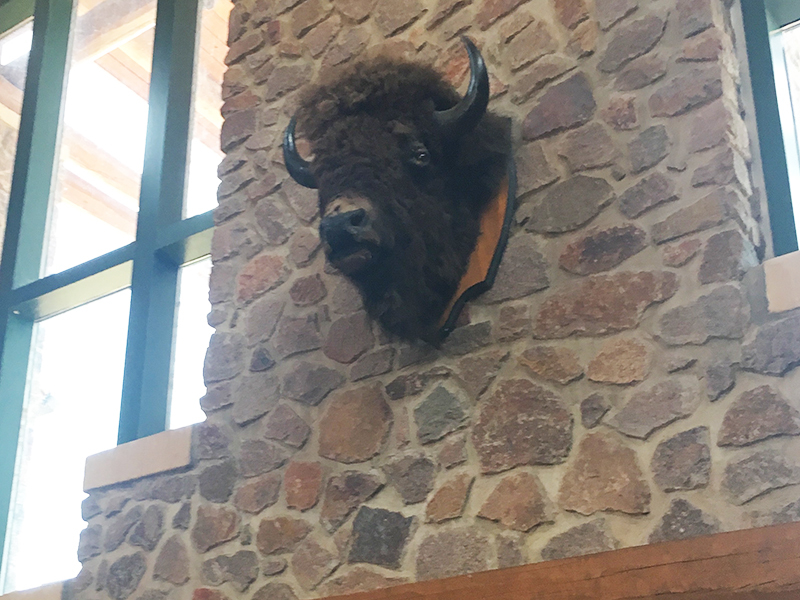 But we saw a buffalo head in the Quartz Mountain lodge when our people stopped there for lunch! This was an interesting resort with a beautiful lake, campgrounds, a hotel and cabins. We walked with Willie and Gemma's dad, and Gemma! That was fun and the place had great sniffing to be had. Back on the road we all drove through a thunder storm! There was a lot of lightning, and big rain drops. Gemma said she had her windows rolled down and it rained in one side. But by the time her mom could stop to roll the window up (no power windows like in our regular cars), the rain had stopped! We said it was a good thing our dads had put their roof up after lunch! 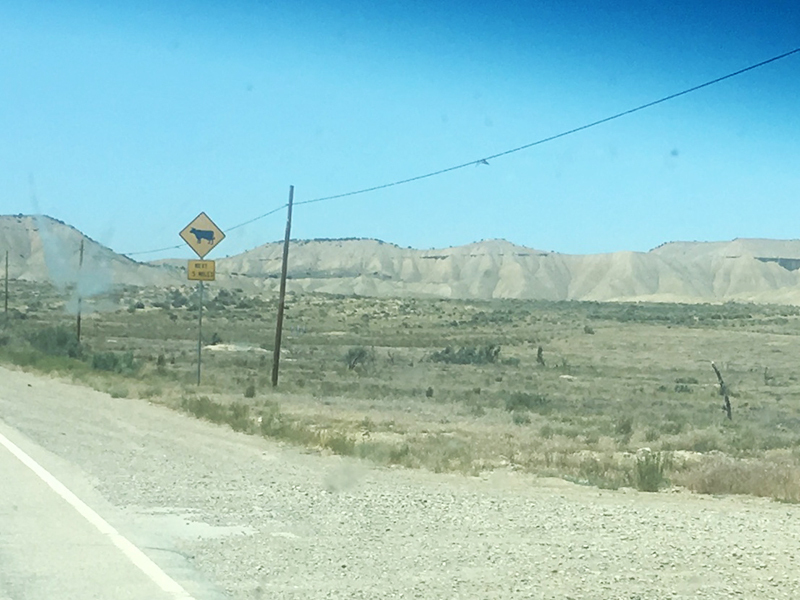 Later, we drove back into Texas and it got really hot again. 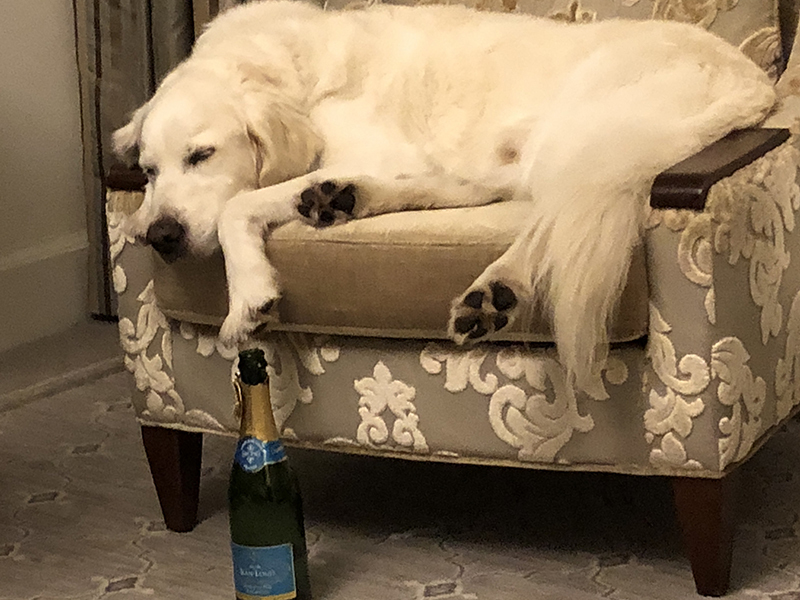 Our mom had a hard afternoon. She still has a bad cough, and it got really bad. She hurts from coughing so hard! It makes it hard to breathe and to talk and sometimes to eat and even sleep! So she was tired out when we got to Amarillo. Getting tired is part of having Stage IV cancer, and it's impossible to really get rested. But our mom tries to rest and sleep to help her feel better. And finally her cough got a little better. The Ford's back window blew out during some highway driving, so our dad and Tim had to figure out how to fix it. But they did! Gemma's mom and dad, and Gemma, came to our room to hang out and our moms ate dinner. When our dad came back from fixing the Ford, he and Uncle Jeff went out to eat. So we got to see Gemma all evening! Tomorrow we will be in another new state for us, New Mexico! We hope it's not as hot! Today we were back in the rally! We rode with our mom all day in the RV. Tim drove, and Willie kept us company in the back, since mom is more comfortable in the passenger's seat up front. But we get to kiss her and look out the windshield with her, and that's fun! It is very hot in Texas! That's why mom was in the RV all day - it's hot for her! It's too hot for everybody, but when you have metastatic breast cancer heat makes you feel way, way worse. So air conditioning is the answer. The organizers shortened the course today, but it was still a long day. And did we say it was hot? Gemma rode in the Chevy BelAir with her mom and Peg. They say the dog shelf is the coolest part of the car! 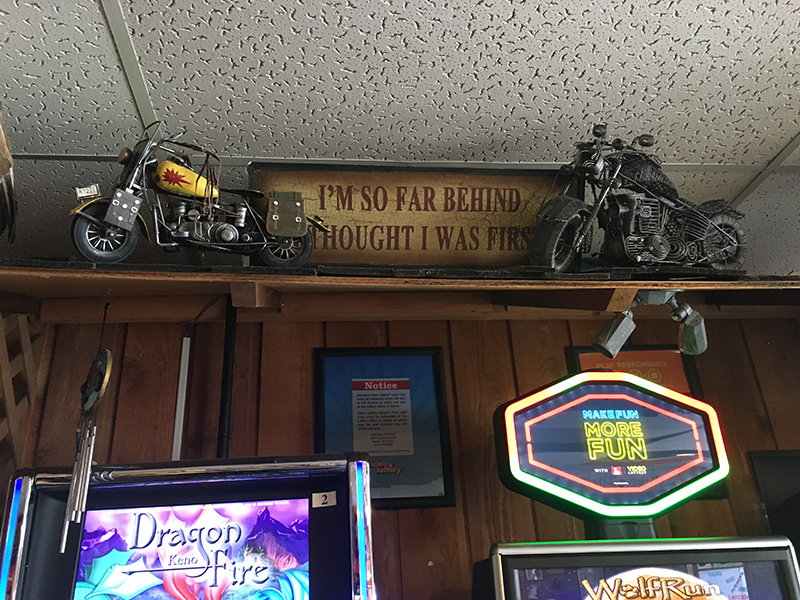 All the air blows back there, and it's far from the hot engine. She really likes it! It's really fun seeing her at rest areas when we get to run around and play together! Our dad and Gemma's dad drove with the top down on the Ford all morning. 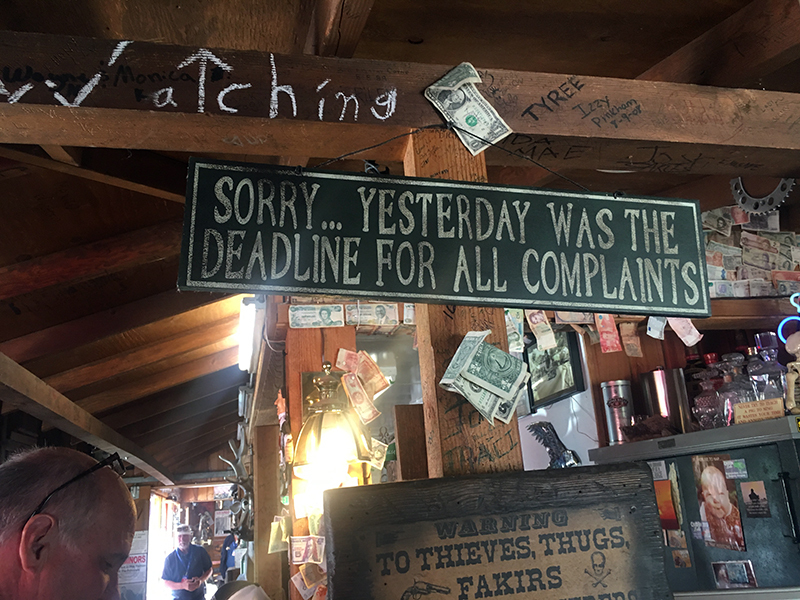 They said it was fine until afternoon when the sun just got too hot! Peg did a good job navigating for Aunt Gaye all day. With the shortened route, the new directions were kind of confusing, but they figured it out. Today was a good ice cream day, too. Our mom had ice cream for lunch then as an afternoon snack. And Gemma said she got to taste her mom's soft serve ice cream snack! Lucky dog! 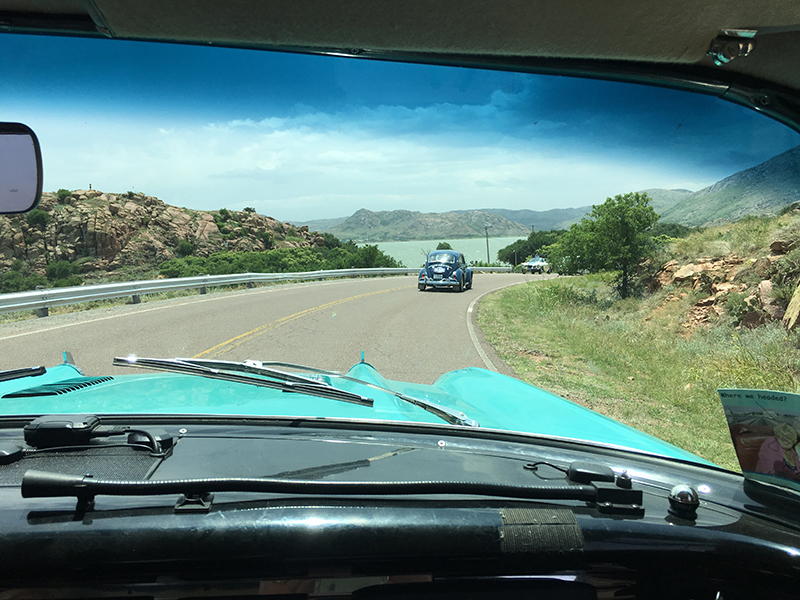 Our favorite place to drive through today was Possum Kingdom. What do you think that means? We would chase those possums out and make it Finn and Dodger's kingdom! Except it's too hot. Jamestown is way better, but it's still fun to see all these places. Tomorrow will be another long hot day to Amarillo. We are so happy for Uncle Tim and the air conditioned RV! 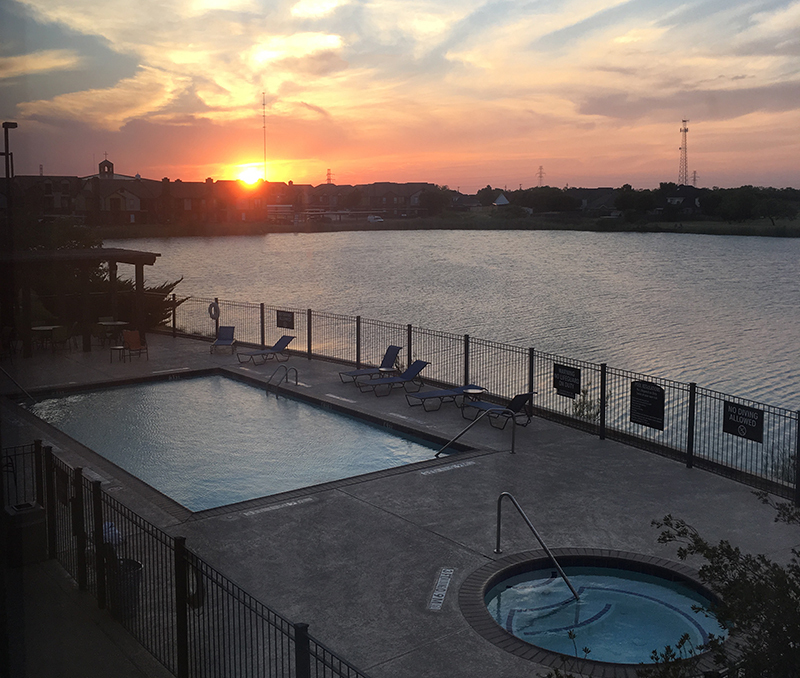 Another rest day for us in West Lake Hills, Texas, outside of Austin. These rest days in air conditioning are good for our mom. She didn't eat enough today, but she did eat! We don't get it - all we want to do is eat! But this is one of the problems of having metastatic breast cancer. Our dad and Tim worked on the cars today. They checked oil and other fluids. They also found some auto shop online to order a back-up clutch for the Ford. 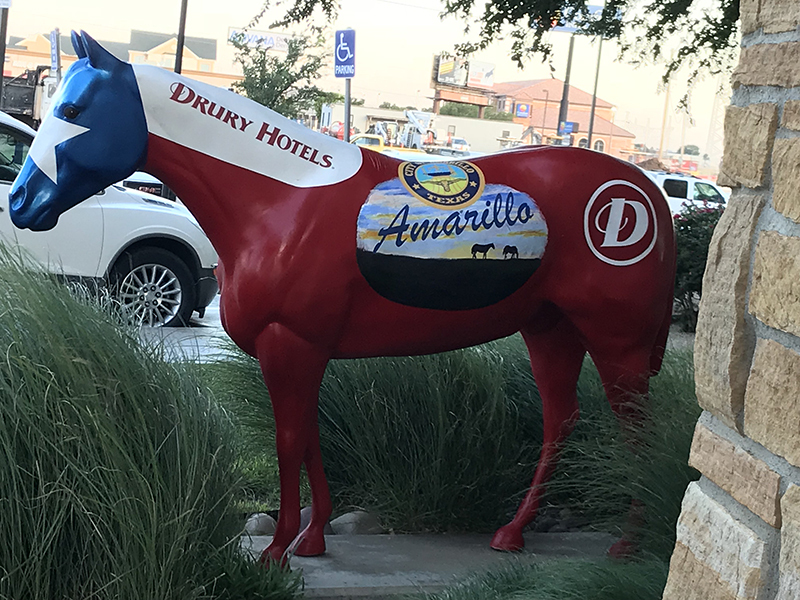 It will be in Amarillo when we get there-just in case. Gemma's mom and dad came to the garage and cleaned windshields. 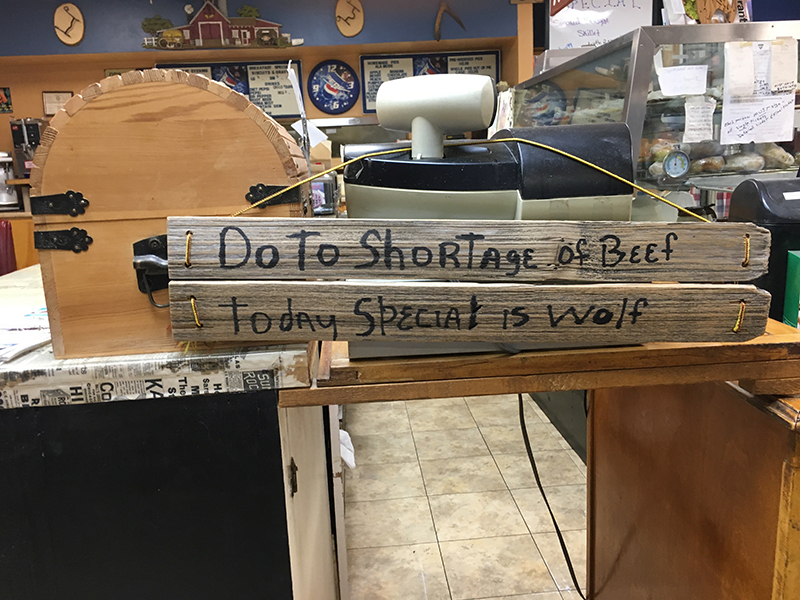 Then Aunt Gaye cleaned out the dog shelf in the Chevy, and reorganized things so she and our mom will be ready to go in the morning. We'll rejoin the rally then. Gemma and her mom came by our room to see our mom, and to take us for a walk. And we saw a snake skin! Our dad HATES snakes, so it was good we were with Aunt Gaye. The rest of the rally drivers started showing up around 4:00 PM. 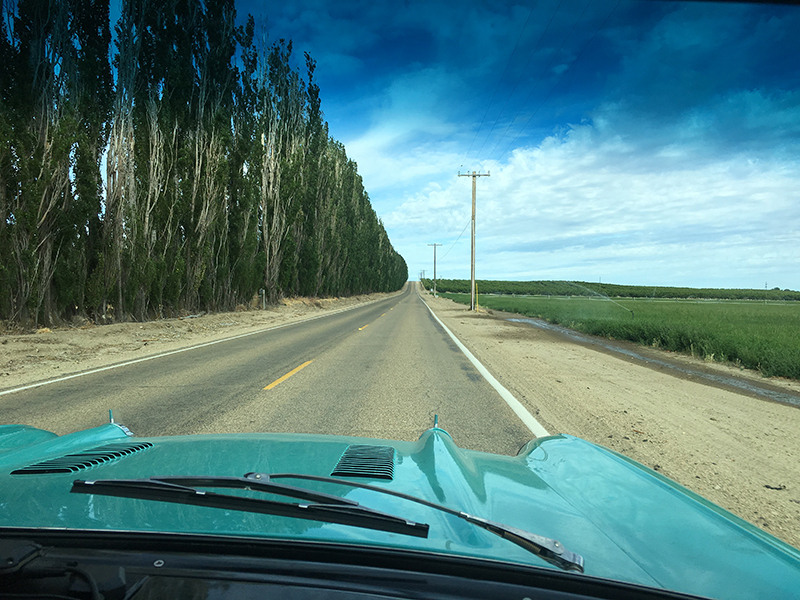 They had a long, hot drive, and one of the organizer people said they had simplified the regularity speeds because drivers felt it was too complicated in the intense heat. At the drivers' meeting about the Austin to Wichita Falls drive on day 11, they talked about how last month was the hottest May in Texas history! The heat will continue for the drive through the rest of Texas, but should get better from Santa Fe north. The rally course is getting changed a little the next three days to help the drivers, the cars, and the dogs! So, we are on to Wichita Falls - and back to being rally dogs, and having fun on the road! Today was a great rest day! This morning it was cooler in West Lake Hills, Texas, outside of Austin, when we went walking with our dad. We're on the hill side here, so while we wanted to run down the hill into the woods, our dad wouldn't let us. He was sure there were snakes in there! But we thought that might be interesting! Tim got up early and took the Ford to a local garage to get the accelerator rebuilt. They really knew what they were doing, and Tim learned a lot more about accelerators. So that is fixed, and ready for Wednesday when we rejoin the rally. They also looked at the clutch repair and made a few adjustments. Tomorrow he is going to take the Chevy to them to have it checked out. Our mom and dad went into town to get mom's blood work done. This is something metastatic breast cancer patients need to do a lot. The nurse takes blood out of our mom's arm. Then they look at it to figure out if the medicine is still working to keep the cancer from growing, if her blood is healthy enough to not worry too much (we always worry! ), and to see if there are any other problems. The nurse at the clinic here will send the results to her primary oncologist in Rhode Island, who will then tell our mom all about it. So even when she is driving a road rally to raise awareness of Stage IV cancer, she is all too aware of her own cancer and working to take care of herself. While they went into town, we stayed with Gemma and her people in their room. That was fun, but Finn thought it would be a good idea to dig Gemma's empty breakfast food bag out of the trash. He's not supposed to do that, and he knows, but he waited until Aunt Gaye went to the bathroom and then dragged it out. I just watched him do it! Of course, as soon as Aunt Gaye came back, she took it away! We also saw Willie when we came back from walking. He was enjoying the day off, sitting outside. It was fun to see him! When our people got back from the clinic they ordered a late lunch with Gemma's mom, then they all ate together. Our mom ate an entire bowl of fettuccine! That was the most she had eaten in days! It was a child's portion, but still a pretty big bowl full. Our dad told us it would help keep her stomach from grumbling so much, which is good. It sounded really loud last night! We hope she will eat more and more, and get stronger again. That would make us happy. Something we didn't write about before was a story our dad's mom told him. She lives in New Zealand, and last week she went to a lunch to raise money for metastatic breast cancer research. And the speaker talked out our mom, and how she and our dad were doing this road rally to Drive4StageIV! So half-way around the world. people are hearing about our adventure, and supporting the cause to raise awareness and funds for the good work Metavivor does. 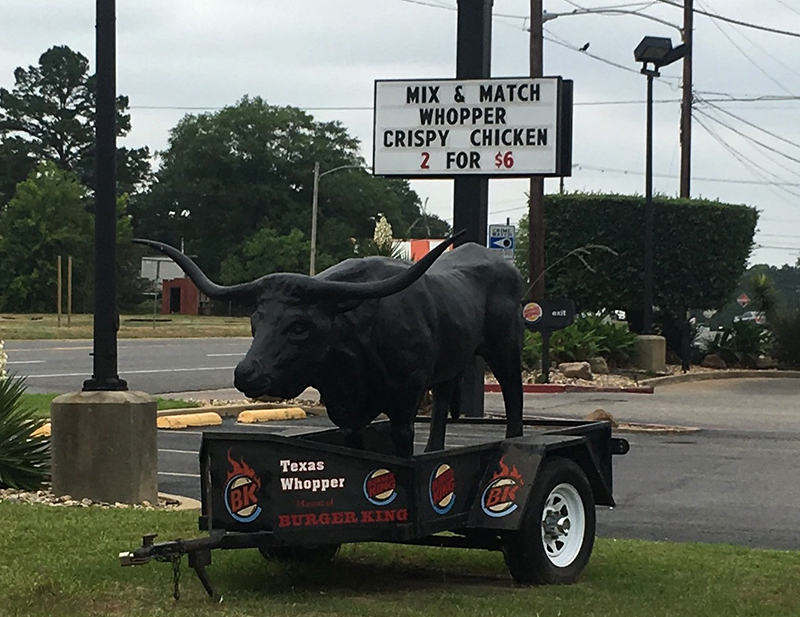 We started in Jackson, Mississippi, and are now in Austin, Texas! We were on the road from 7 in the morning to 7 at night! Dinner was late! No rally today for us, but it was an interesting drive. Since it was so hot, our mom rode in the RV with us all day! Gemma rode in the Chevy with her mom and Peg. Aunt Gaye drove all day, but she said she had fun, too! We started out with us leading the way (we like that), but of course Tim was driving. Willie was watching the directions. And our mom was hanging out with us and working on her phone. Then came the Chevy with Gemma, her mom, and Peg; then the Ford with Gemma's dad driving and our dad navigating. We heard we missed seeing our friends Nick and Colleen in New Orleans! We're so sorry to miss them, but we couldn't get there with the Ford's clutch broken. We hope we get to see them soon, though. We got to cross the Mississippi River today on a long, beautiful bridge. Then we drove in Louisiana. We heard there were a lot of signs for catfish restaurants. We don't know what that is. Fish is good to eat but we would rather chase a cat than eat it! We saw lots of dead animals on the road. There were deer, lots of smelly skunks, opossums, a coyote, some prickly thing, and an alligator Tim said was about as tall as he is! Gemma was lucky because her mom was driving with the windows open so she could smell everything. Because it was so hot, she said everything smelled extra great! The windows in the RV were closed to keep the air conditioning in, so we couldn't smell much outside. Our people stopped for lunch and we had a good walk next to a weird metal animal - Gemma said it was some kind of bull. Our people went in to eat, and our moms saw a funny bull head on the wall! We all thought it was Texas weird. No sooner did we start up again, when we had to stop! The Ford's accelerator cable came off. Tim, our dad, and Uncle Jeff had to fix it. We watched from the windows of the RV. Then we were back on the road. And it was even hotter! 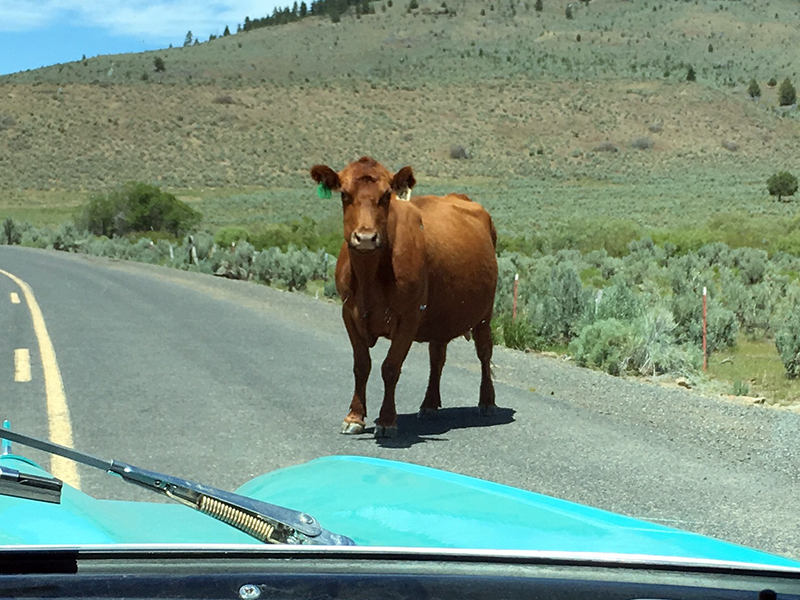 The last time we stopped on the road, Gemma's mom couldn't start the Chevy again. She called to Tim and he came over to help. He couldn't get it to start, either. Then Peg saw the car wasn't in "park". Cars can't start that way, but Tim and Aunt Gaye didn't even notice that! A bark out to Peg for figuring it out, and letting us get on the road again to get our mom to the hotel. The RV ride was making her stomach all grumbly. One more thing: there were some nice people who came out of the hotel when we first got here, who were looking at the cars. 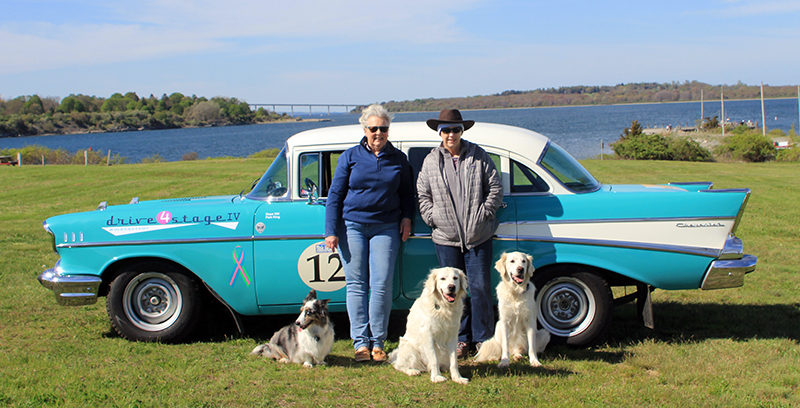 We told them about Drive4StageIV, and how our mom is doing this rally to raise awareness about metastatic breast cancer and money for more research. We gave them one of our cards about how we're doing this together with our mom. And then they made a donation! That was so nice, and reminded us that this is about serious stuff. Of course, it's really fun, too! An entire day without driving! Tim and our dad left early this morning in the two rally cars to drive down the road to a mechanic's shop, to work on the Ford's clutch. The problem was part of the clutch seized up. They worked all day with the mechanic to figure out what was wrong, and then to fix it. The mechanic, Mississippi Tim, came in on his day off to help them! He was very nice, but our dad had trouble understanding his American southern accent, and Mississippi Tim had trouble understanding our dad's New Zealand accent. Our friend Tim could understand them both, so he helped communicate. Gemma's dad went to the garage for a while too, so he could see what they had found out. But then he came back to the hotel to join Willie, Peg, and our moms for breakfast. Gemma's mom, our mom, and Peg took all us dogs for a very hot walk. Then we took Gemma to our room to rest on the cool floor while our people went to eat breakfast. We don't understand this, but our mom doesn't want to eat much. But she needs to! So we didn't mind when we stayed in the hotel room alone while she went to eat cereal and a banana. But she could have brought us a piece of yummy banana back. We love banana! Gemma's dad and our mom came back to our room, and Gemma left. We took a nice nap with our mom. Aunt Gaye and Peg walked to the store to restock the RV. Then they cleaned up in there. In the afternoon we got to take another walk with Gemma and her mom. 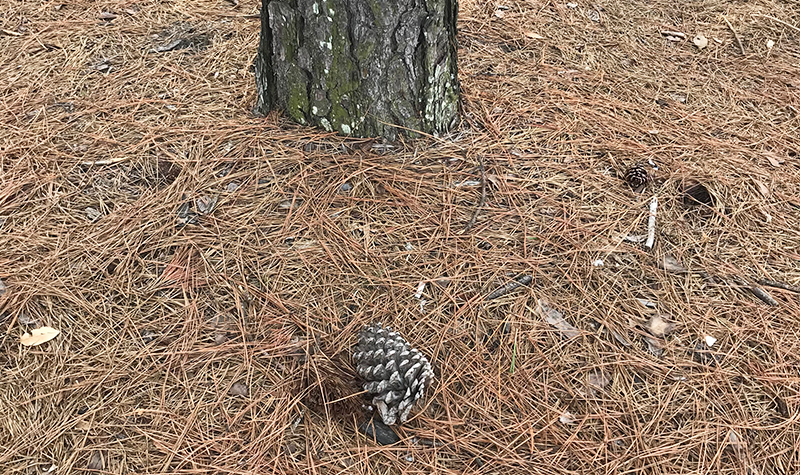 We walked in long pine needles under very tall trees, saw big pine cones and smelled that squirrels had been there! Then we went up and got our mom, and we all took another walk inside the hotel! Our mom is supposed to walk every day, but it is just too hot to walk outside. So walking in the air conditioned halls works great. And it's fun! Our dad and Tim came back from the mechanic's shop with the Ford all fixed! We saw them downstairs when we were doing our hotel walk. It was great to see them. Tonight Tim, Gemma and her mom and dad, and us with our dad met at the Ford and Chevy in the parking lot. Our dad told Aunt Gaye he would clean her windshield if she took us and Gemma. She said it was a deal, so we got another long walk in nice grass. Then we saw a squirrel!! She wouldn't let us chase it, though, so that was no fun. 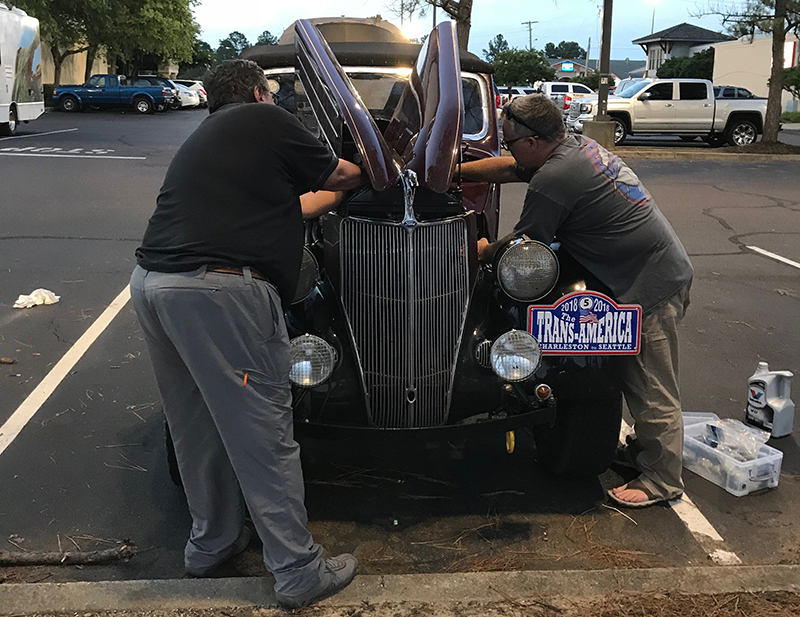 Our dads and Tim made sure there was water in each car's radiator, added oil, checked tire pressure and cleaned windshields. All this because tomorrow we drive to Austin to catch up with the rally. It's going to be a long day on the road, but we'll be with all our people, and we'll stay at a nice hotel there for two whole days while waiting for the rest of the rally to catch up. Unfortunately we will miss our uncle and Aunt Colleen, who flew in to see our mom and us Tuesday night. Then we meet up with the rally in Austin. Another day for Team Ruff and Drive4StageIV! We started the morning in Tennessee and ended the day in Mississippi. Memphis was a bustling town, with a lot of people walking around. 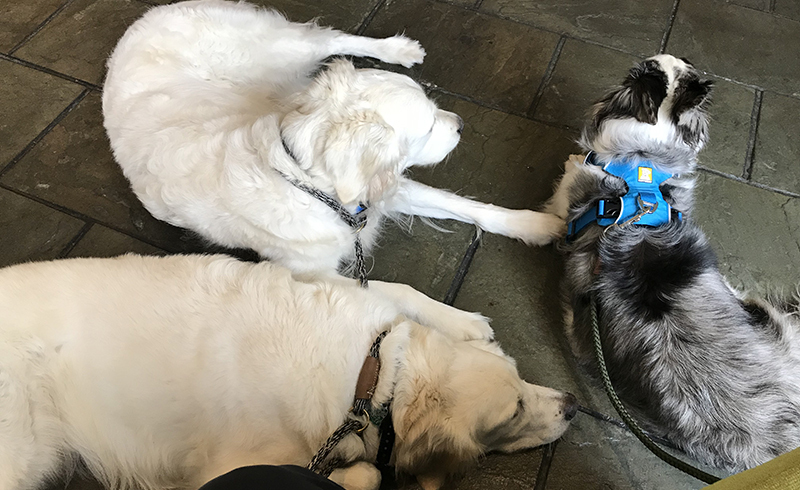 We were happy to sit in the quiet lobby of the hotel while our moms and dads waited for the Main Time Control sign-out. Everyone has a different time to start for the day. Then it was outside to the hot day, and the noise of car engines! Our mom was navigating again, with the tulip book on her lap, the timer remote in easy reach, and a green pen in her hand. Gemma's mom was driving, and we pulled out onto the busy downtown street. Lots of turns later we were on the highway! We had the windows open and the wind kept everyone cool. Our mom took her hat off to stay cool. Her hair is really growing back in! 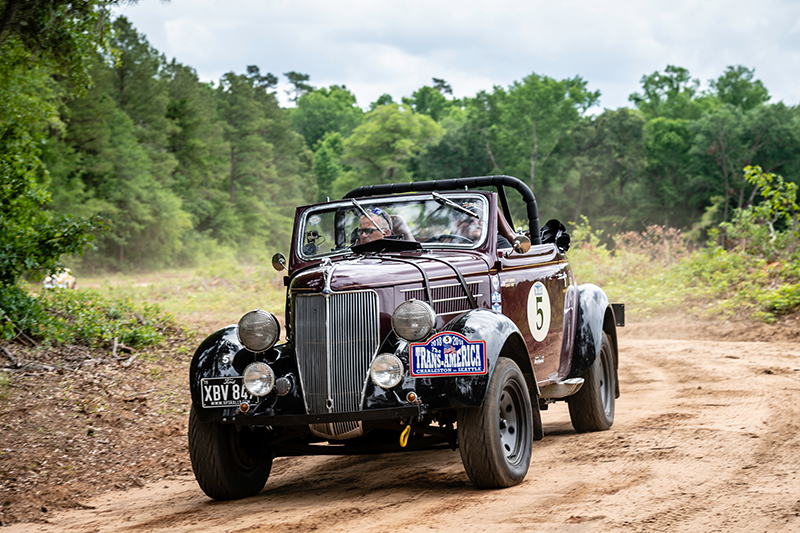 The first regularity was on terrible roads! 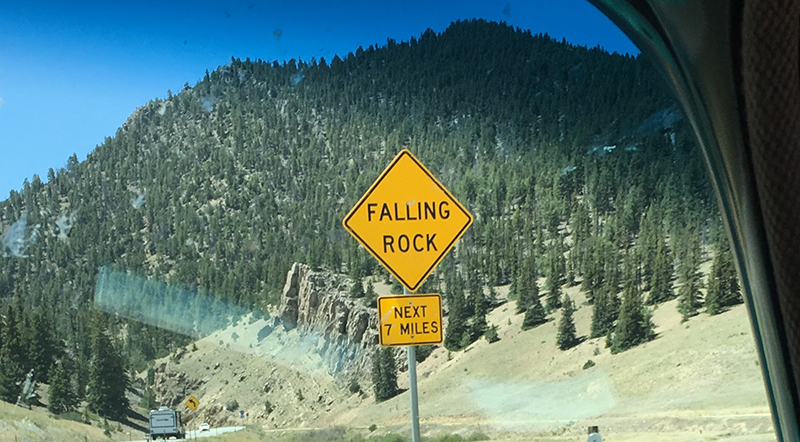 Our mom said the driving directions described "broken tarmac" which meant potholes, pieces of asphalt and sections of gravel. It was really bumpy, but interesting. Our mom's cough got bad from all the open windows, so we turned the air conditioning on. It's not very good air conditioning, but it keeps the air circulating without allergens flying in the window. And it helped with the cough! 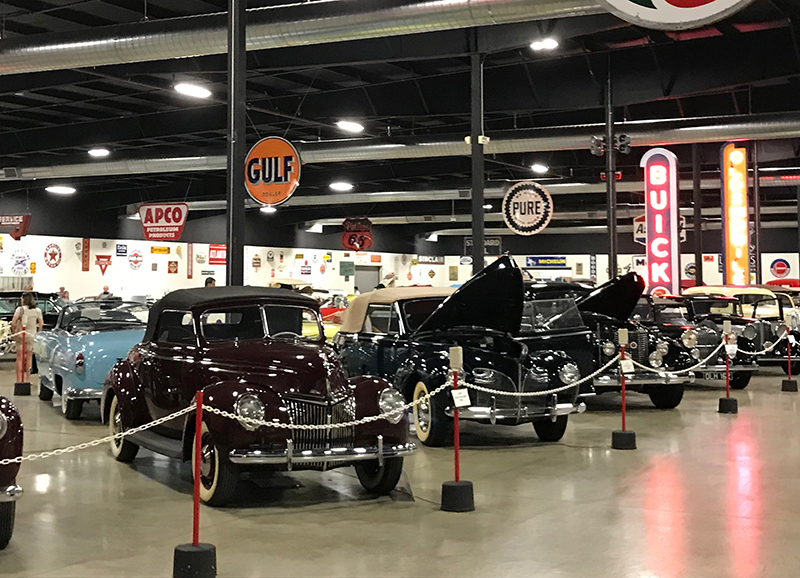 There was a "time check" at the Tupelo Automobile Museum. We couldn't go in, so Tim, Peg, Willie and our people took turns walking with us and checking out all the cars in the museum. 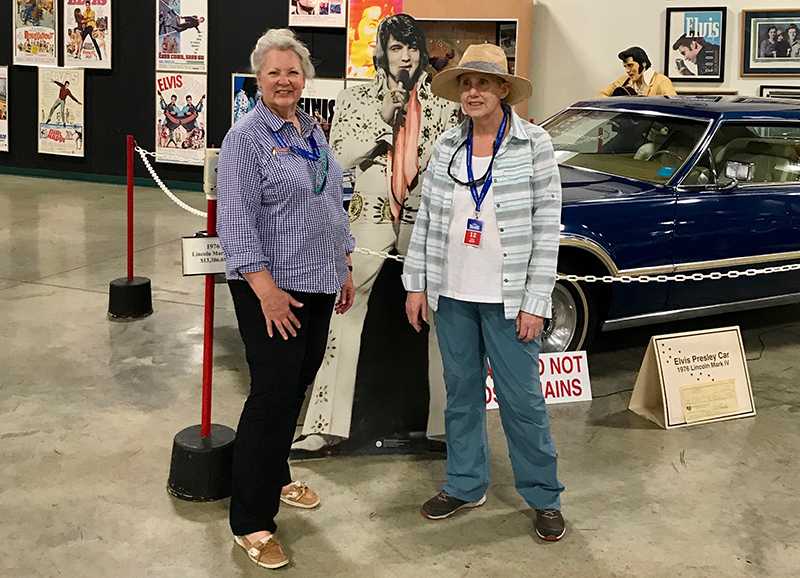 Our moms saw a car owned by someone called Elvis Presley. He lived in Tupelo a long time ago. We stayed in the RV while the people went to a restaurant for lunch. Then came our favorite part of the day. Our mom came in to the RV for an afternoon nap with us! She worked with her phone some, too, and it was like being at home with her. Except we were moving. And the RV isn't as nice as our house. Gemma rode in the Chevy with her mom and Peg all afternoon. We saw her drive away with her head out the window like she likes to do. 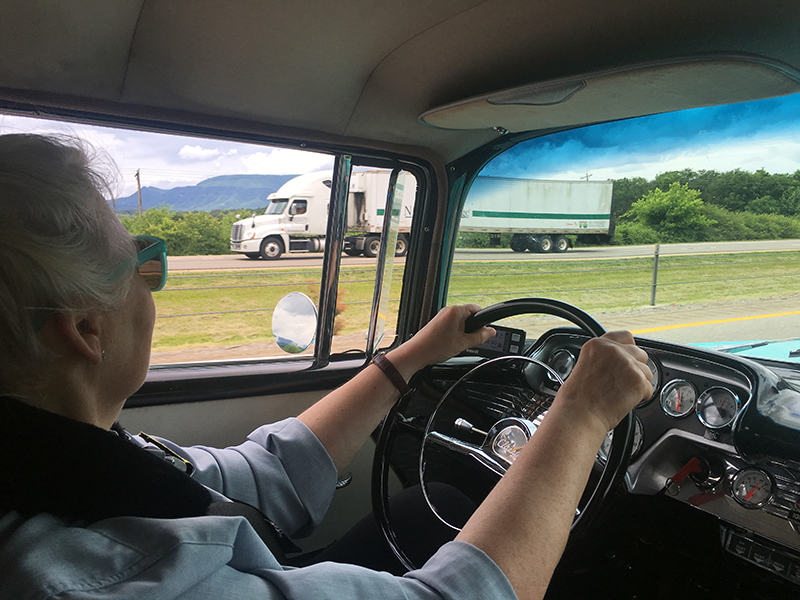 She got to drive back on to the Natchez Trace Parkway, and stop at one of the rest areas. There was lots of grass and pine needles to sniff, and she got to see our dads there, too. The regularity in the afternoon was on all sorts of gravel roads. Gemma said it was kind of scary! There were deep gullies along the side of the road from all the rain, and the gravel was slippery to drive on. And there were a lot of turns and curves! Once three dogs ran out to chase the car, and Gemma stuck her head out the window to watch. Our people would never let any of us hang out next to the road, and we would never chase cars. That is so dangerous, but those dogs didn't seem to know that. After all those gravel roads, it was back on the good road of the Natchez Trace Parkway. There were trees by the side of the road that looked like the roots had just come out of the ground! Gemma's mom said some had been there a while, but others were from Tropical Storm Alberto. Then Gemma saw a beautiful lake! It was the Barnett Reservoir, and much, much bigger than the reservoirs in Jamestown. It sounds like it would be fun to swim in. We heard our dads had a problem with the Ford this afternoon. The clutch is the problem, so instead of driving to New Orleans from here, we'll be staying in Jackson another night and the Ford will go to a garage to get fixed. Then we'll probably drive straight to Austin and wait for the rally to catch up Tuesday night. We should be back on the road on Wednesday! But a rest day will be fun, too, and good for our people - especially our mom! Today our rally teams were back on the road! Our dad is in the Ford, and our mom is in the Chevy BelAir. We started the day's drive from Nashville to Memphis at 8:08 AM. Peg got our time book signed, and ran it out to our moms. Then they drove around the corner and were off! Our mom was doing great today. She had something called a "mini-stroke" that affected the part of her brain that lets her talk. She could think the words, but couldn't get them out! The doctors all told her it would get better, and it already has. She's supposed to read and talk a lot, so navigating is great for her recovery. Our mom has to tell Gemma's mom how far to go, what signs to look for, and to drive straight or to turn left or right. And she has to reset the meter that measures distance all the time, so there's a lot of mental and physical concentration. It's hard work, but mom does great, and she and Aunt Gaye laugh a lot, so we know they are having fun! Right after leaving Nashville, we drove the Natchez Trace Parkway. It was beautiful! And in the shade of all the trees, it was cooler, too. We saw turkeys, pheasants, and even little turtles! 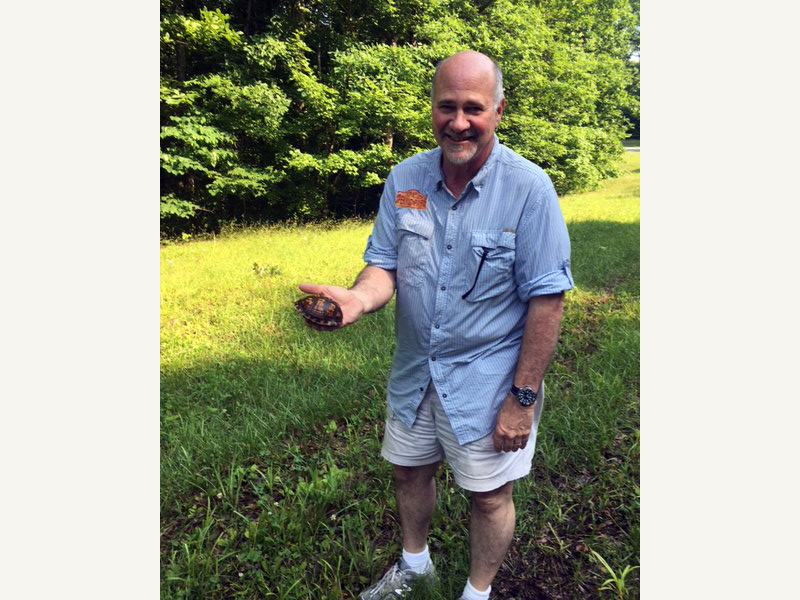 Tim stopped the RV twice to pick up turtles in the middle of the road - he didn't want them to get run over! Our dad even saw armadillos eating grass by the side of the road, but we missed out on seeing them. We all met up at a time trial. We were supposed to drive around a course set out in an open field as fast as we could, but it was really muddy from all the rain. Our moms were next in line to go on the course, when the rally people said there was a problem. The car right in front of them got stuck in the mud! It was so hot in the car, and mom was feeling sick to her stomach. When the rally official came back and said we didn't have to drive the course, we drove right out of there! Then we saw chickens! We met up again at a gas station to fill up our tanks. We all went to the bathroom, and our mom filled two cups up with ice and tea for her and Gemma's mom. They said it was refreshing! After driving lots of twisty roads, we stopped for lunch. There were a lot of people who were walking around the parking lot taking pictures of all the rally cars. One man said it was the best car show he had ever seen! A reporter from a local newspaper talked to our moms. They gave her one of our cards that explains why they're doing the Drive4StageIV, about Metavivor, and about how our mom has metastatic breast cancer. The reporter was very nice and wished us safe driving. All throughout the day, rally drivers and rally marshals told our moms how happy they were that we were back in the rally. That was so nice to hear! Our mom was ready for a rest after lunch, so she rode in the RV with us and Tim and Willie. Peg rode with Gemma's mom, and did her first time navigating! Aunt Gaye said she did a good job, and they got to Memphis a little after we did. 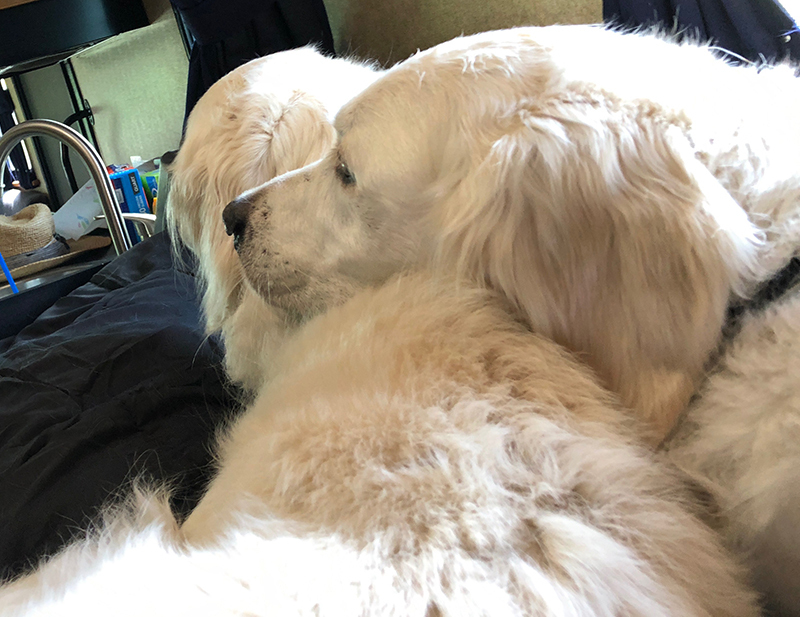 The best thing for us was that mom took a nap with us on the RV bed! We all snuggled up and fell asleep. Gemma slept on the bench seat she likes - the bed is too high for her to jump up on. Mom had a nice nap, and so did we. We all felt better when we woke up, and we all had a good dinner in the hotel. Next we be driving to Jackson, Mississippi. Our mom will be navigating again while Aunt Gaye drives. Our dad will be driving the Ford, while Gemma's dad navigates. We're having fun! Even if it's very hot - and it really, really is. It was a long day in the RV. Our mom and dad dropped us off with Gemma and her mom and dad early in the morning. 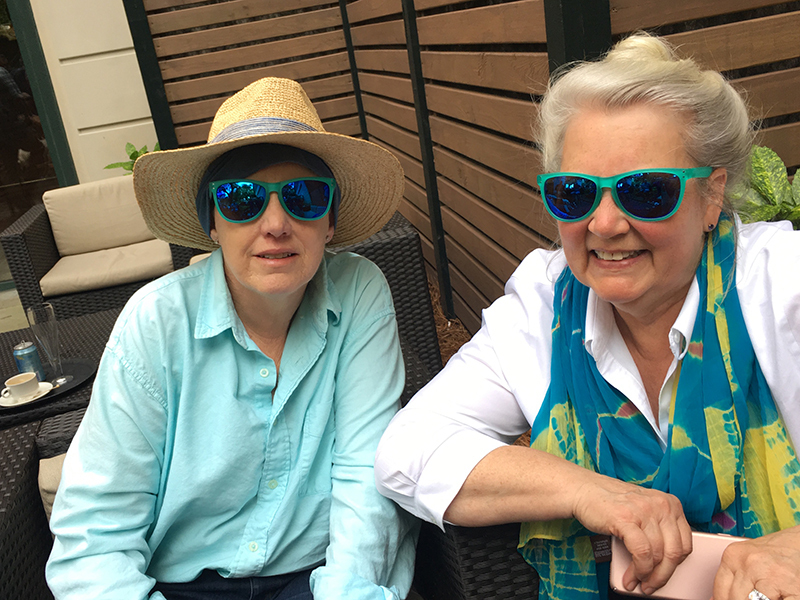 Then they went to the airport for their day in New York at the hospital with the top metastatic breast cancer researchers. After a nice walk in that great park - did we say it had geese? And squirrels? And birds of all sorts? Well anyway, all three of us ate a delicious breakfast. Then we headed out to the cars. It was already so hot!! Did we tell you about the tropical storm? It's been raining on and off like crazy, and Gemma's mom had the television on yesterday showing lots of muddy water, and trees falling over, and pouring rain! And it was like that outside the hotel sometimes. Today it was raining just a little bit, but since it was so hot we decided we needed to be in the RV. So we got nice bowls of water, treats, and kisses from Gemma's mom, then she left. Tim and Willie started the RV, Aunt Gaye and Peg got in the Chevy and Uncle Jeff in the Ford. And we all started to drive! It was fun to see all the other cars (regular ones, not rally cars). We drove out of the city to the highway, and drove and drove. Then we started thinking about missing our mom and dad, and started trying to tell Tim and Willie about it. But they thought we just needed to go for a walk, so we stopped. And then Gemma's mom came in the RV!! She was having a problem with the car "misfiring", so Tim went to look at it. And then we went for a great walk in the rain. Peg came too. We got really wet, but it felt great! When we got back to the RV Gemma's mom dried us off with a towel, and that felt good, too. Tim figured out what was wrong with the Chevy pretty fast. He said one of the wires connecting a spark plug to the cylinder wasn't attached, so instead of 8 cylinders the car was running on 7. That made no sense to me, but all the people seemed to think it did. There was a nice man who came over to look at the engine, too, and Tim told him about the rally and we gave him one of the cards about Drive4StageIV. Back on the road. 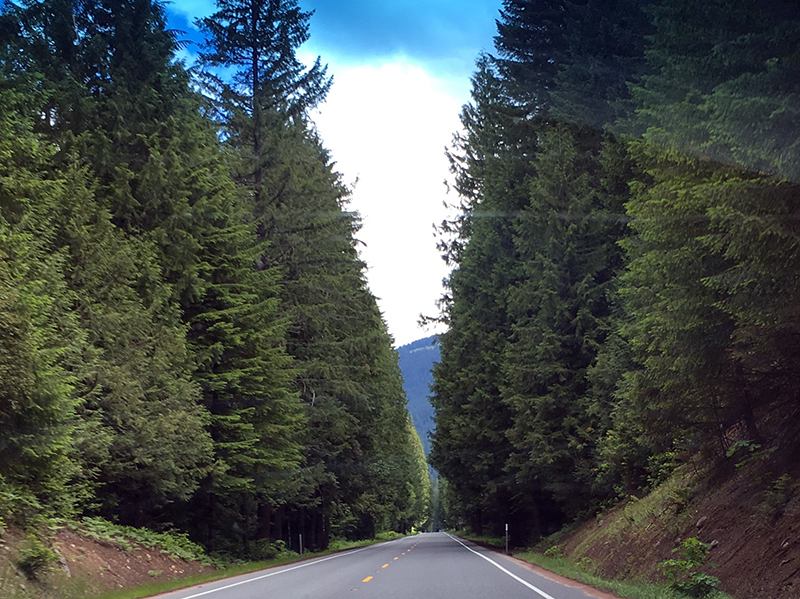 We saw lots of beautiful trees and drove into a tunnel right through a mountain then out the other side! Lots of big hawks flew high over the road. We drove through rain, then the hot sun. There were dark clouds and then the clear bright sky. We had three other great stops. One was at a gas station, and we saw a little dog and tried to get his attention by barking and barking. Gemma's dad was very hot, but he had a long conversation with this man who came up and told him about running bootleg moonshine in a '36 Ford back in the day. Then we stopped at a place that had wonderfully shady trees and nice cool grass. Gemma's mom walked us fast, and we got to run and play. That was great! But it was so hot and then we got stuck in traffic for a long time. The Ford overheated, so we all pulled to the side of the road. Gemma's mom and Peg came into the RV with us, and I jumped up on the seat next to Aunt Gaye. That was so nice! There wasn't room for Gemma, so she just laid down on her mom's feet. Then Gemma's dad came into the RV. He was so hot! But then he drank a bottle of Gatorade and the RV's air conditioning made him feel a little better. After a little while they all left, and we got back on the road. Traffic slowly moved along, then we heard from our mom! She said her visit to the doctor researchers had been very positive! And she and our dad would be flying back to meet us in Nashville. Just before we got off the highway, the sky got really dark and it really started to rain hard. We couldn't see very well out the window with all the rain. But we got to the hotel and our dad was there! He took us for a walk, then took us to our room to see our mom! That was the best of all. Our mom and dad are both looking at the tulip book to get ready for Thursday's drive to Memphis. And we will be back in the rally - which means we'll be rally dogs again! Our mom and dad got back from the hospital and boy, was it good to see them! 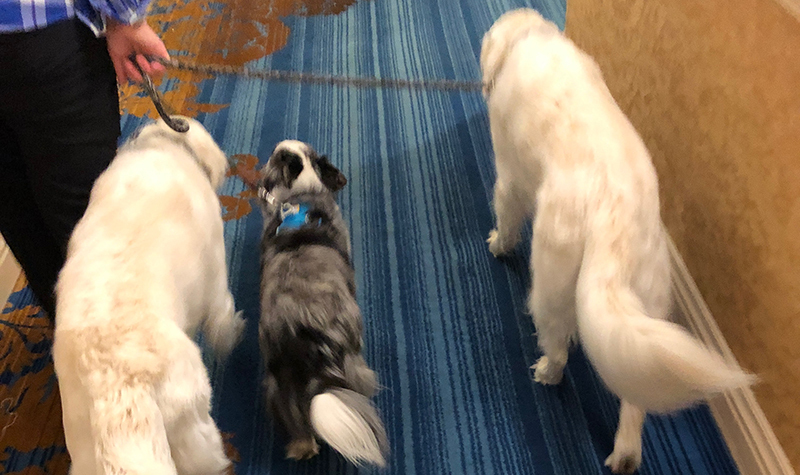 We got yelled at for barking in the lobby, but we couldn't help it - we were so excited! They were so tired from not sleeping at the hospital, we all got to take a nap. It's so nice to be with them! Instead of driving today from Highlands, NC to Nashville, TN with the rally, we hung out at our hotel. Tim and Gemma's dad took the Chevy to RK Motors to get the air conditioning fixed. And we did laundry! Gemma's mom and Peg walked us and then we collected all the dirty clothes and went to the laundry. It was hot there, but we like doing things with people. And we saw Willie there, too! Everyone was doing laundry - people like to be too clean, if you ask me. When we were back in Gemma's room, Peg texted our moms a story. She said she wanted to get the "tulip" book - the rally book of directions - from Willie. So she told Willie she would just follow him to his room. Willie said "It's been a long time since a woman has said that to me." That was funny! Our dad took us for a walk before dinner, and we saw Gemma. We hadn't seen her in what seemed like forever, so we had to jump all over each other to say hello. We love her and she loves us. Mom and Dad are going to New York tomorrow to meet with some of the people doing metastatic cancer research. We sure hope they decide our mom can have other treatment options. These researchers are the kind of people who work on projects Metavivor supports, so it will be great to hear how their visit goes. But we get to drive to Nashville! Our people say we'll take a "direct" route, instead of driving all the twisty roads the rally drives. 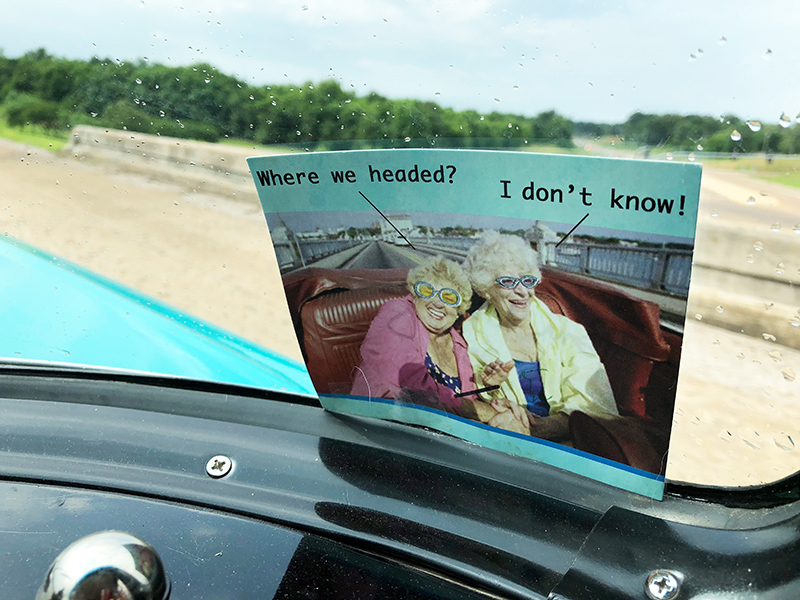 We know we'll have fun - just not as much fun as we have driving with our moms! Our mom is talking better and the doctors told her it will get easier the more she talks. So she's working on telling us stories, and telling us how much she missed us. We love hearing that! And tomorrow night our mom and dad will meet us in Nashville. That will be the best of all! Tomorrow we're on the road again! Our stay in Charlotte has been extended, and we're taking a break from being rally dogs. That nasty metastatic breast cancer took our mom to the hospital this morning. She had some trouble talking, so it made sense to check that out. They ended up having her stay there overnight for observation, but we're really, really hoping she'll be back with us tomorrow. Our dad is at the hospital with her. So we spent time with Gemma's mom and dad. They made sure we ate breakfast! We then moved to a better hotel, closer to the hospital, and Gemma's mom and dad went to the hospital to see our mom and dad. We stayed with Tim and Peg and Willie. There's a great park here to walk in! 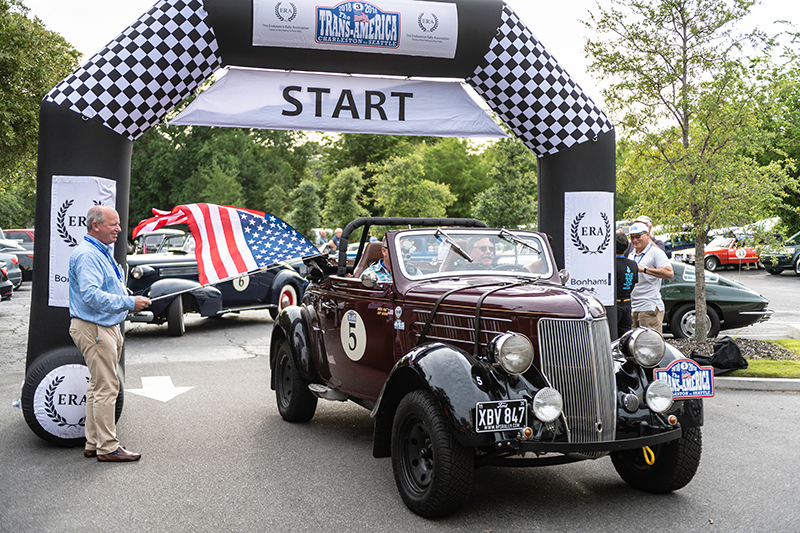 We hear the other rally cars had a fun drive today: up into the Appalachian Mountains of North Carolina! Tomorrow they will drive to Nashville, Tennessee, and we'll rejoin them when we can. We know how important this adventure is to our mom. She wants to be driving and having fun! Funding research into treatments for people like our mom, to help them live and have more fun, is a great reason to donate to Metavivor! Let's hope we get to see our people tomorrow, make a plan to rejoin the rally and Drive4StageIV! 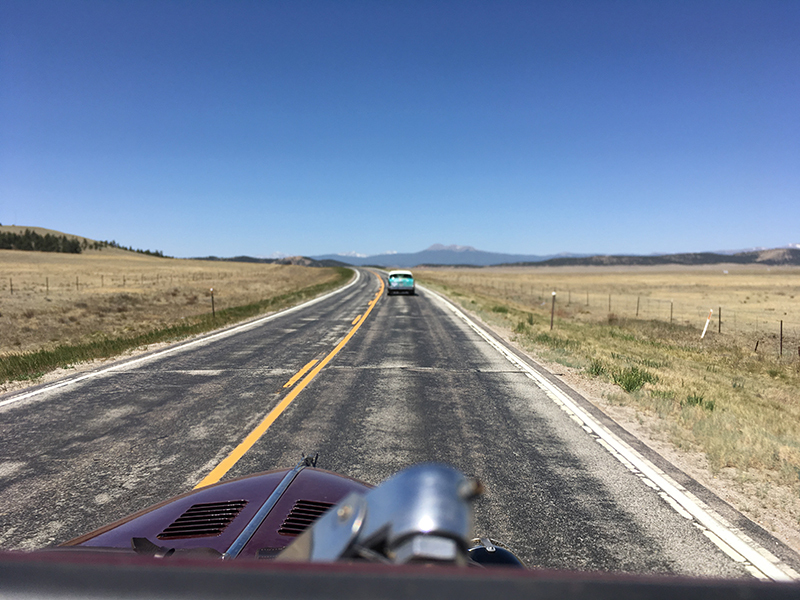 Our first day on the TransAmerica Rally! It was so fun at the start. We saw lots of people we know and met lots of new people. We got up on our padded shelf in the car, right behind our people. 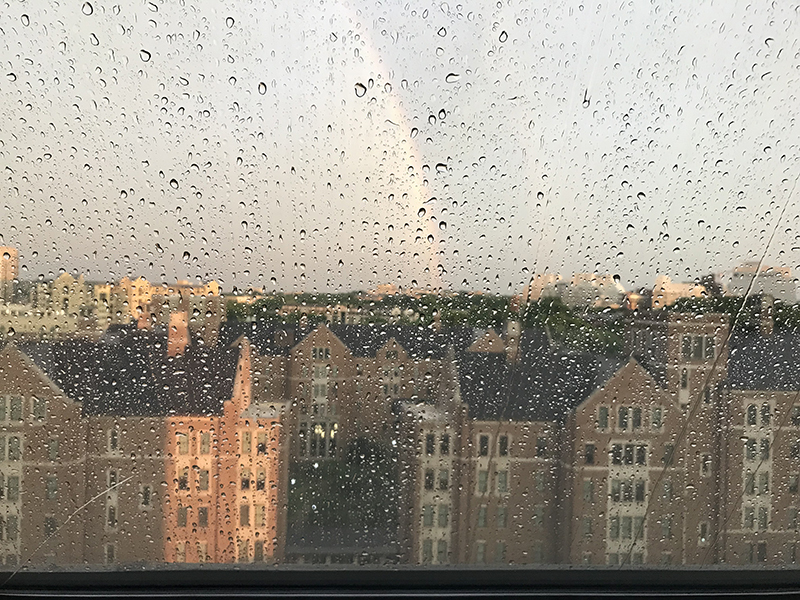 We had an awesome view out the windows! Tim ran our time book in the hotel to sign us in for the day, then ran it back out to us. 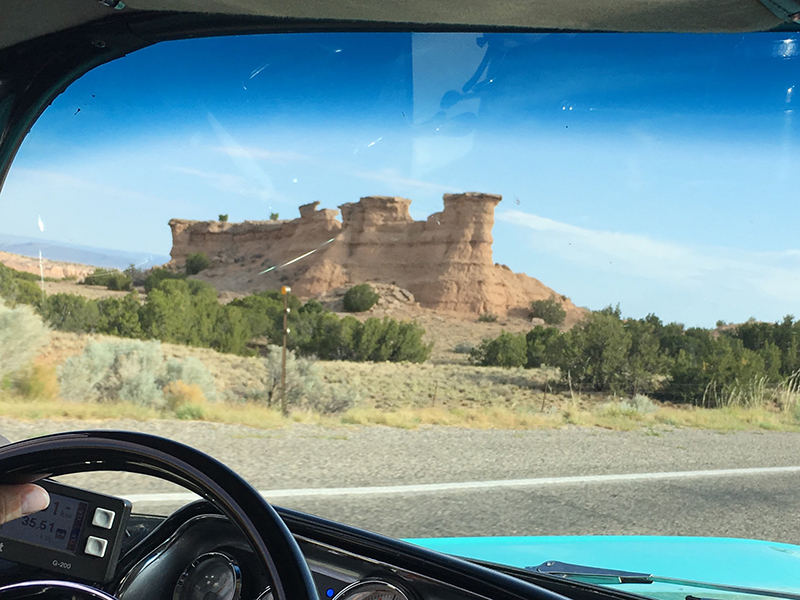 Then we drove through the starting arch and we were off! Getting out of Charleston was fun, lots of twisty turns, then Pam's cousin Maurice drove by and took our pictures! And there were other people we didn't even know standing by the road taking pictures and waving. We were celebrities! We had to slow down once for lots of vultures in the road-really. They're weird looking birds. There were a lot of really big trees called magnolias that lots of other birds were in. That was exciting! We are doing this ride for fun and to spend time with our people, but there's a serious reason, too. I know from listening in on humans' conversation that 113 people die every day from metastatic breast cancer in the US alone! Even from a dog's perspective that is way too many. And from the perspective of the dogs that live with those 113 people (if they're lucky enough to be able to have dogs) it is just plain sad. Our rally adventure is about fun, but it's about raising awareness and money for scientific research to save those lives - including our mom's. Metavivor makes sure every dollar donated goes straight to research. They are a great organization! My favorite thing today was something called a regularity. There were marshals who reached in to pet us and said hello. They signed the time book and counted us off and we shot forward at "go!" Then lots of fast turns, more fun people and then we were done! We had something called a time control, too. But I don't care about time controls. Dogs don't have much sense of time. But maybe I'll write about them another day anyway. At lunch we saw the rest of our people, and then said goodbye to our moms and the Chevy. It was too hot for us in the car! We drove in the air conditioned RV with Tim, Peg and Willie. 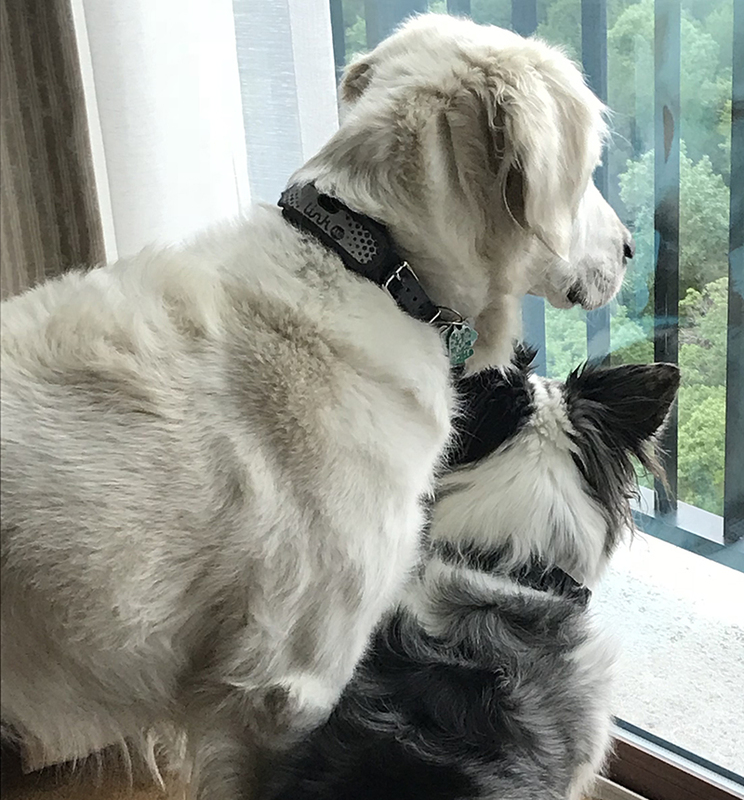 We got to lay on the bed and look out the windows. There was a lot of talk about "navigating." Peg told Willie she was learning so much from him. Willie said some people would be surprised to hear that, and everyone laughed, but I'm not sure why. 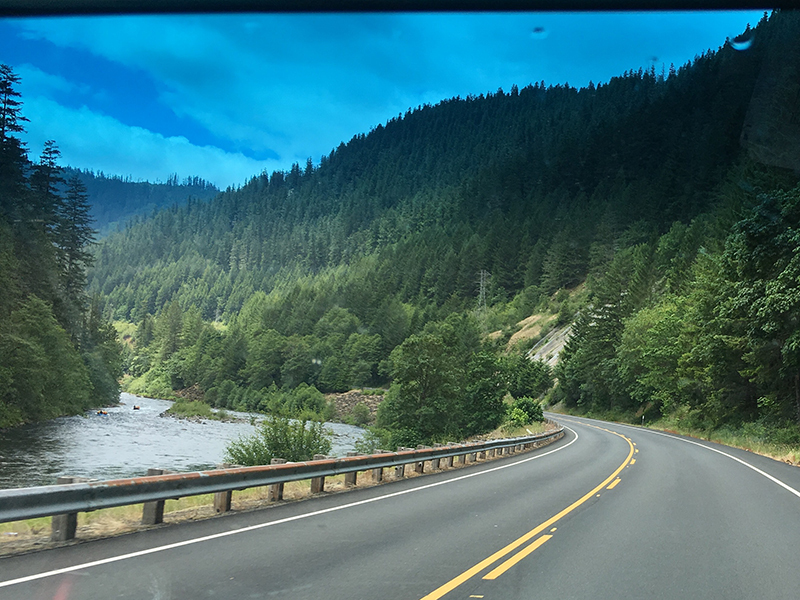 When we saw our own people at the end of the day, they talked about sandy roads, gravel roads, winding roads around a lake, and more winding roads. We also heard the "belt" that made the power steering and air conditioning work broke. Tim and Chris said they could fix that tonight. Apparently our dads, Chris and Jeff are leading their class after day 1 - that deserves a bark out. The hotel in Charlotte is loud with party music, but the air conditioning feels great. We are tired from our first rally day, and the best thing is we get to go do it again tomorrow! 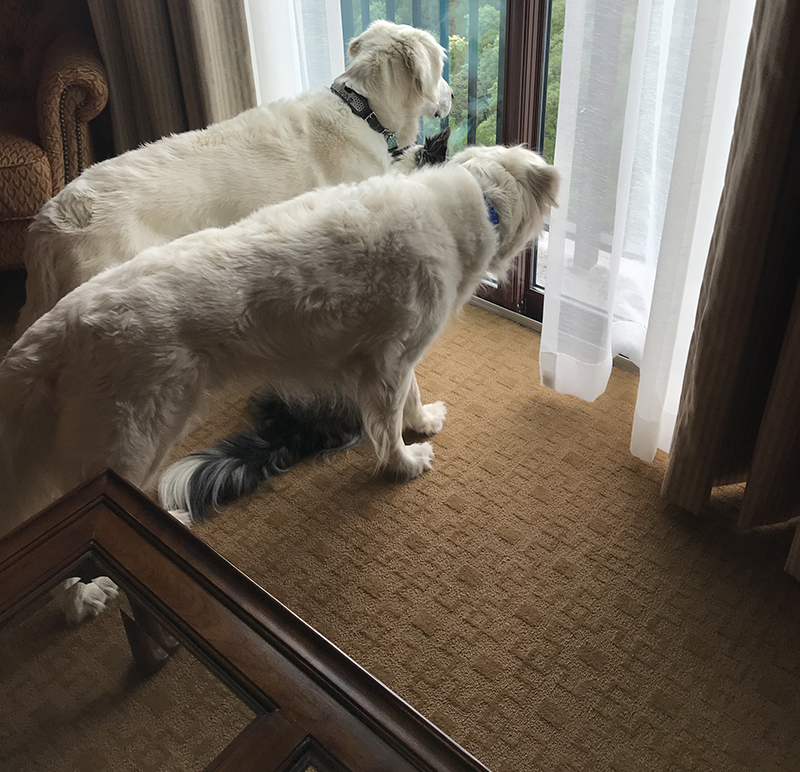 We arrived in beautiful Charleston, SC yesterday afternoon-a new state for us canines, if not for our people. Settled into the Belmond Charleston Place Hotel, we met friends Tim, Peg, Willie, and Gary - he's the mechanic from RPS in England, the guy who helped get the cars ready. 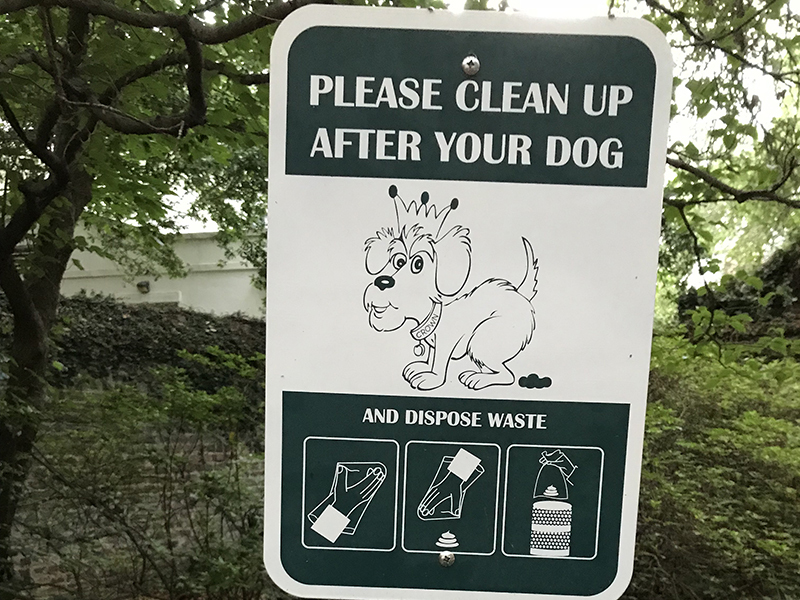 We personally find Charleston a very dog friendly city. We got to hang outside while our people had dinner, and that was fun! After a good night sleep in our hotel rooms, we headed to the Rally hotel. And then we got to see all the cars! We hung out in our air conditioned RV while our people met with the mechanics to do what they call scrutineering. A mechanic goes to each car, then the driver has to show safety gear, the medical kit, and show the lights, horn and turn signals all work. Our car passed with flying colors thanks to Tim's prep work, and our moms got to go in the air conditioned hotel to check in, get their name badges, trip time card book, and tulip book. 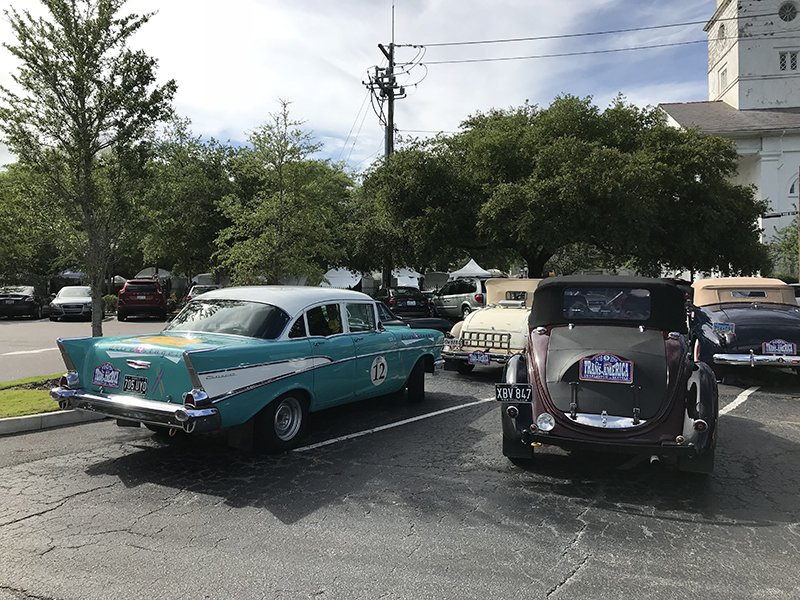 While we were in the RV, we had a great view of all the vintage cars in the parking lot, and people coming and going. It was fun! Our dad and Gemma's mom came to take us for a fun walk around the hotel, then we got back to our air conditioning - and phew, we needed it! Too hot and humid for New England dogs! We learned about navigating from our people after they went to "Novice Navigator" class. They brought back atlases marked with each day's route, and thick "tulip books" marking each turn along the way. Tomorrow's drive takes 15 pages! 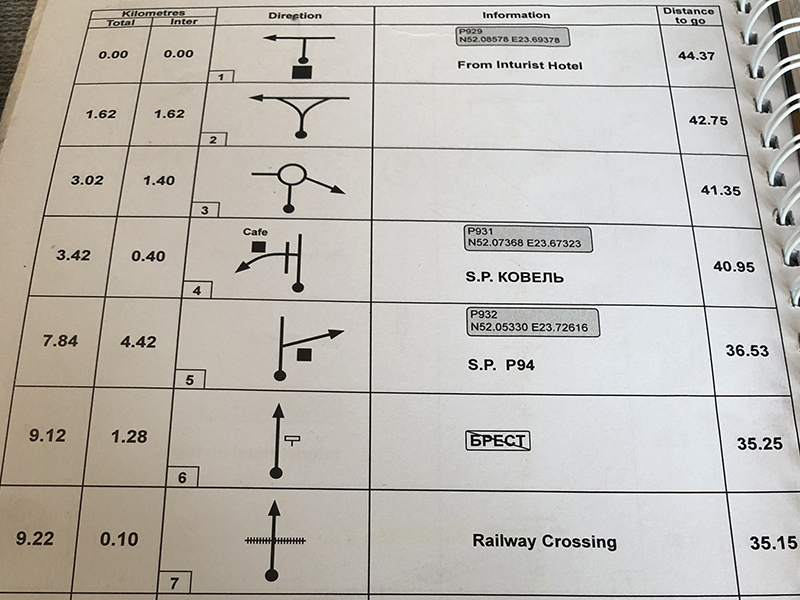 Right turn, left turn, stop - the basic rule is the black dot symbol is where you start from, and you go the number of kilometers marked, then turn in the direction marked. Sometimes the turns are only .2 kilometers apart! It's like me and Finn running the slalom at Fort Getty! Then there are secret checks, time points, regularities... but we'll write about those once we've experienced them. Signing off for now. We were partying it up with our dog sitter. Our first day of Team Ruff starts early tomorrow. We are off to Charleston tomorrow to get ready for the start on Sunday. The guys spent time teaching Gaye and I the navigation and rally rules. There is quite a bit involved. I will type an update tomorrow on the flight down sharing what we've learned. 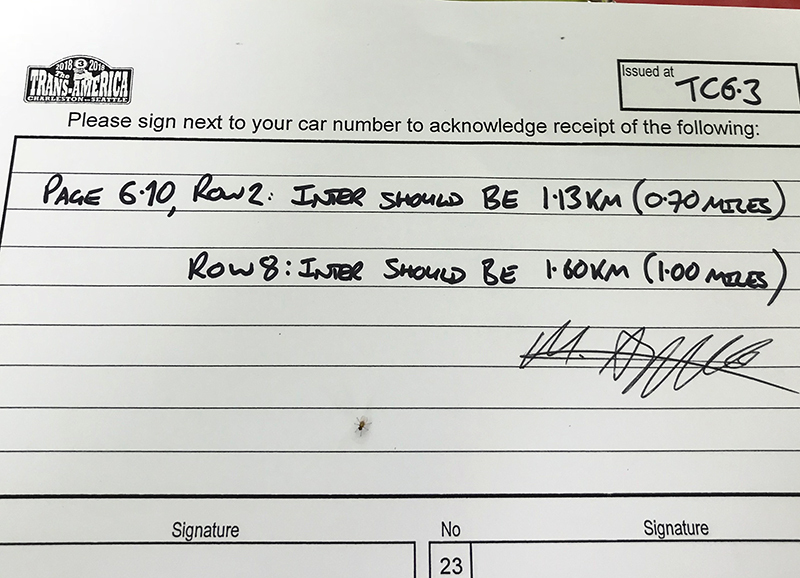 Gaye will be driving for us and I will be navigating, Dodger will be taking over the race updates for us, with some help from his brother Finn and best friend Gemma. If you have not read through the website, Team Ruff are our dogs and it is sure to be entertaining.